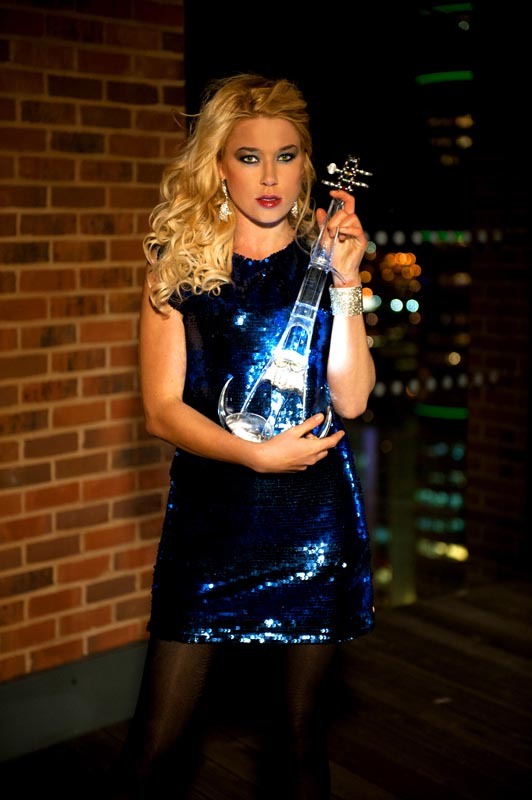 Kate Chruscicka is a world-renowned, award-winning violinist. 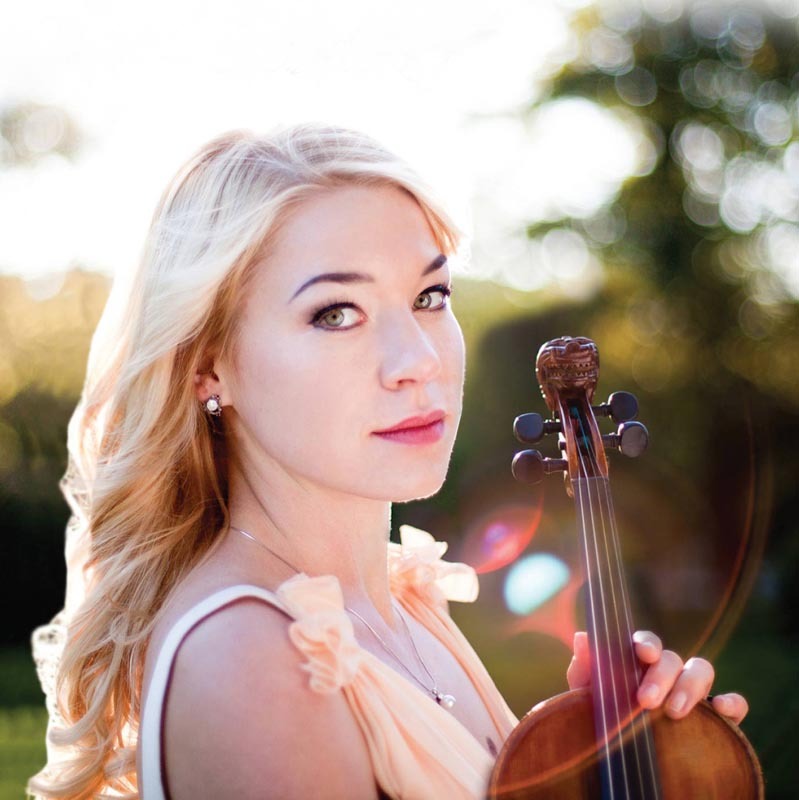 With her incredible talent for playing her extraordinary violins, Kate can elevate any function—private or public—to an ethereal experience. 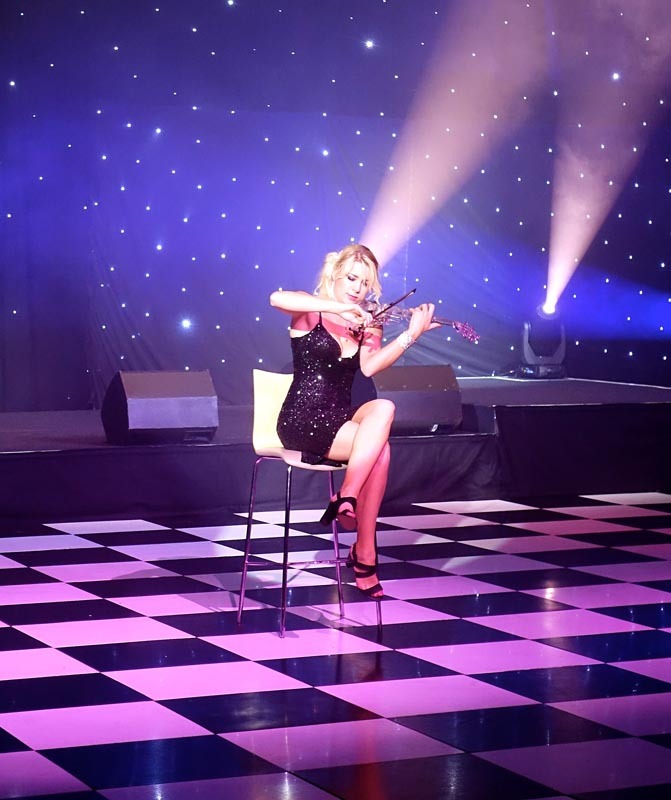 Whether she is performing at a Wedding, Charity Ball, or any Private or Corporate Event, Kate can create an ideal ambience. 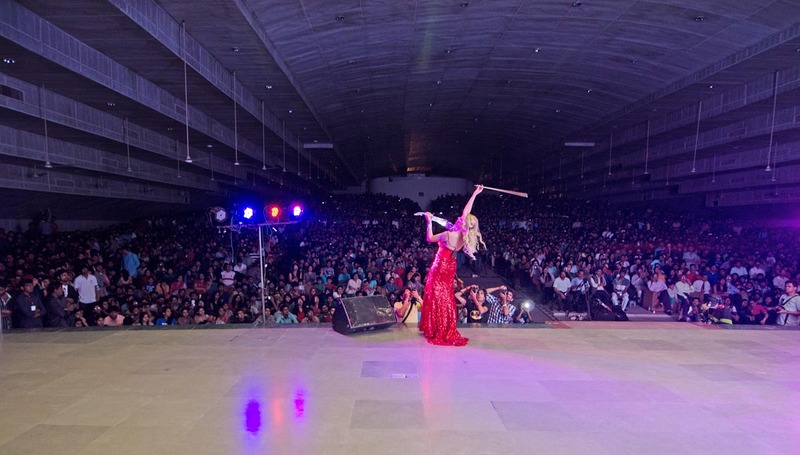 Her audiences have been enraptured with her unique musical fusions. 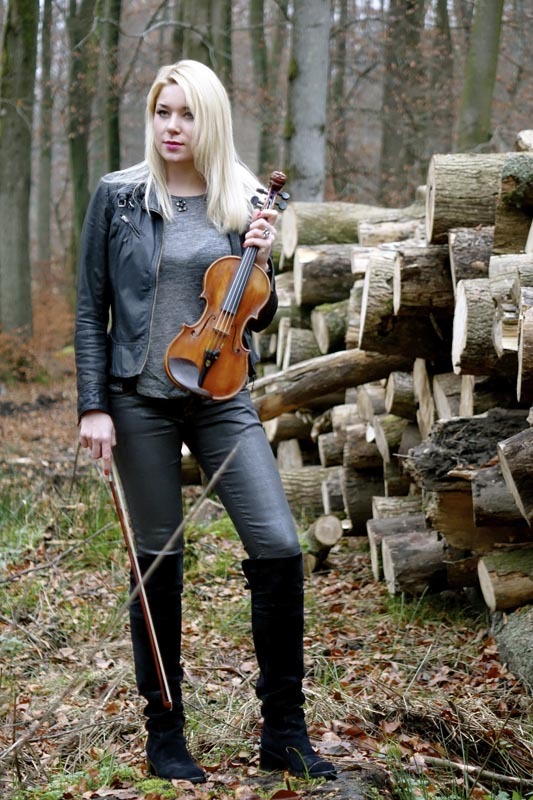 She plays everything from acoustic classical sets that subtly entrance, to electric pop favourites that can move even those unaccustomed to dance. 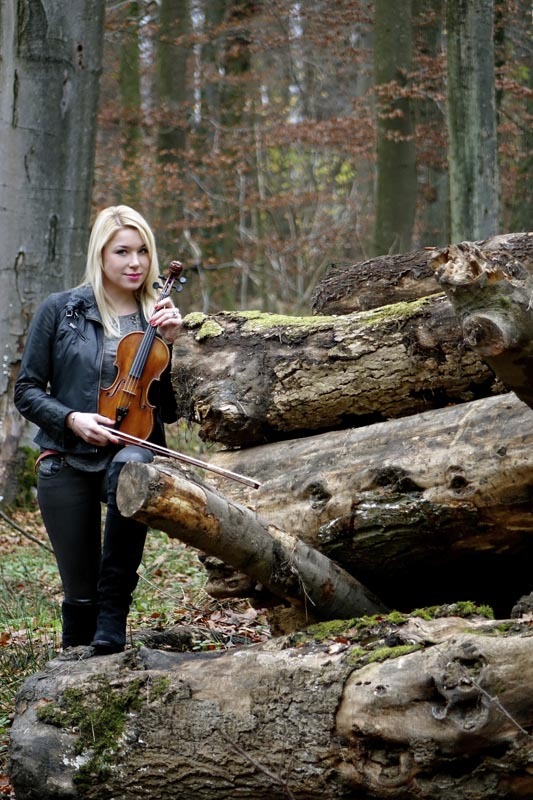 It all began when six-year old Kate received a present from her parents: her first violin. 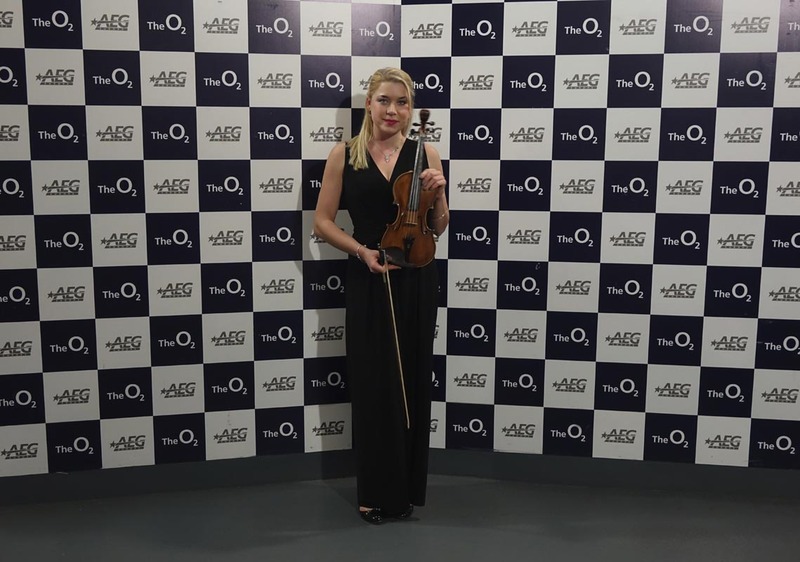 This simple gift, combined with the music of Singaporean/British violin player, Vanessa Mae, would become the catalysts for Kate to dedicate her life to becoming a virtuoso of the violin. 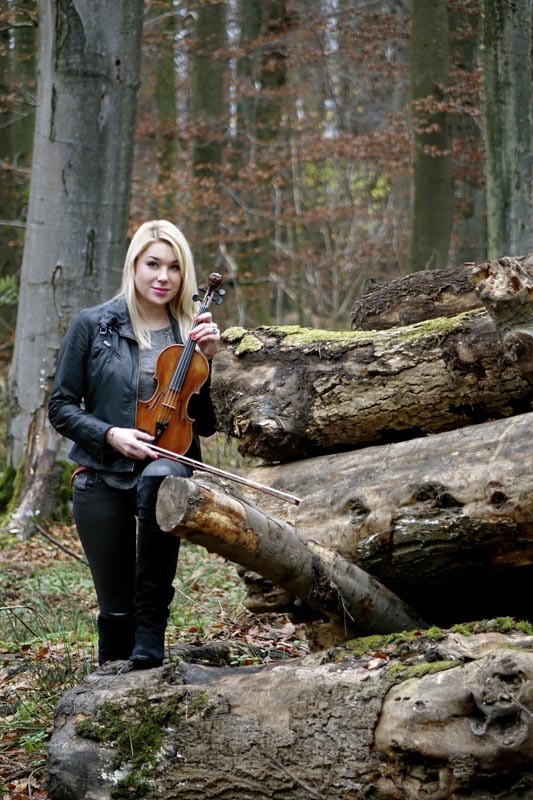 At the age of twelve she received a classical violin by Polish craftsman Luther Irena Kozak (Sobecka)—an extraordinary, heart-felt gift willed from her late, loving father. 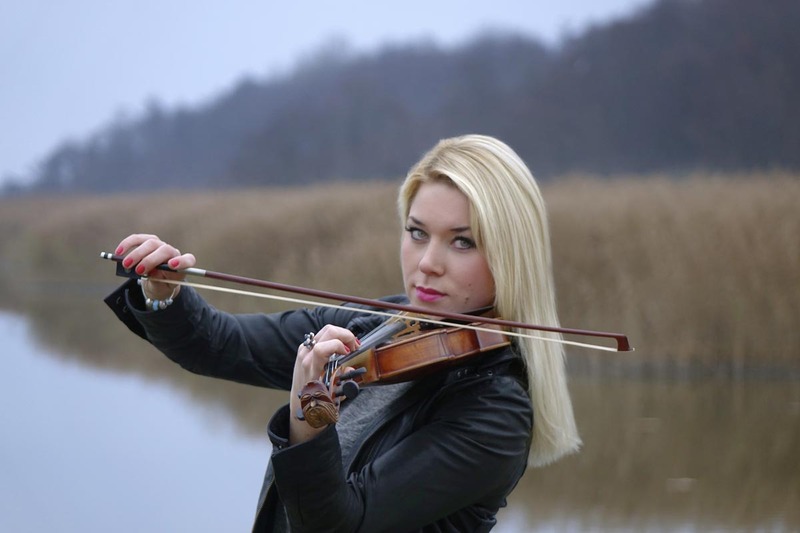 Kate’s confidence and skill blossomed during thirteen years of studying at the Comprehensive National Specialist School of Music (ZPSM) in Koszalin, Poland. 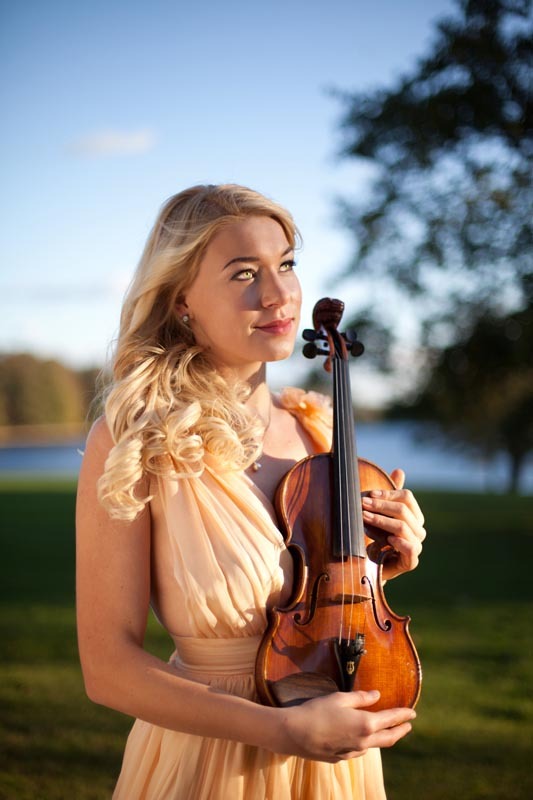 Years of steadfast practice propelled her from Poland to the University of Leeds, where her prowess was acknowledged with several competitive scholarships, including the Toothill Performance Award and the Blanche L Leigh Award (twice). 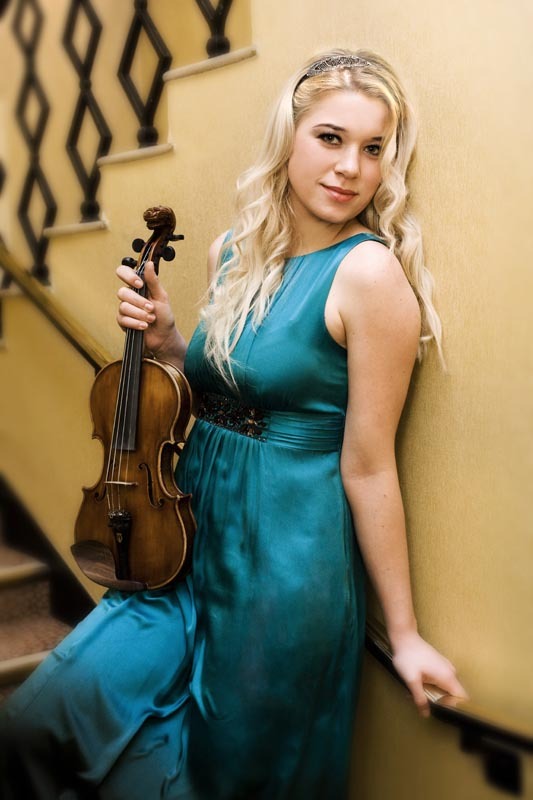 At Leeds, she earned a BA Mus (2:1) and performed as co-leader of the first violin section of the University’s Philharmonic Orchestra. During her first year, she significantly broadened her range. 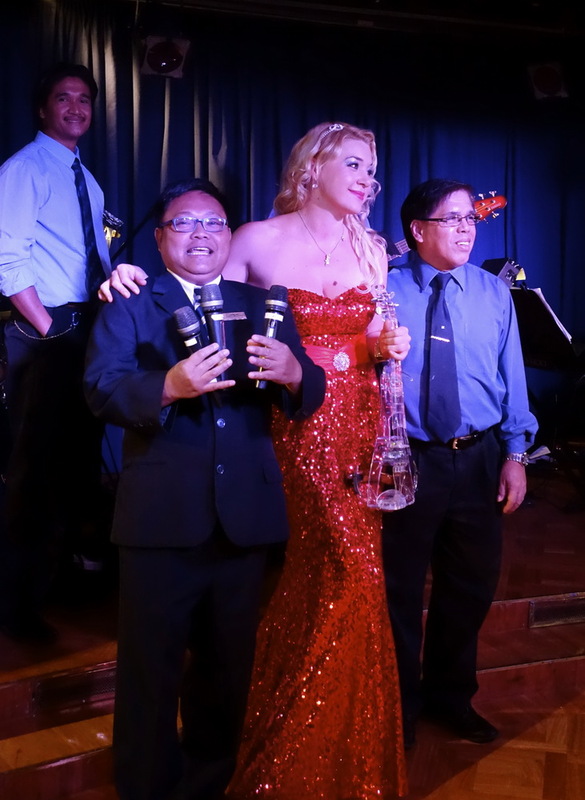 She became acquainted with more popular and world music styles by participating in Cuban Band, Charanga Del Norte, led by Dr. Sue Miller (with whom she later teamed to record the album “Look Back in Charanga”). 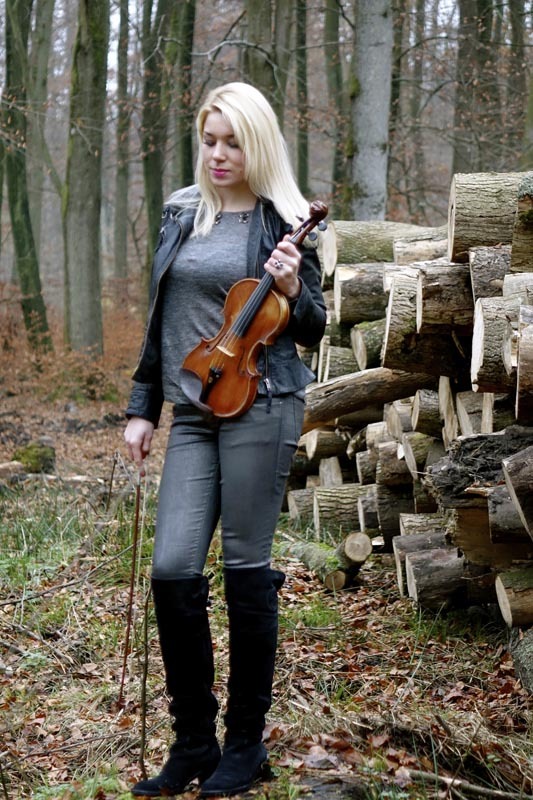 Likewise, she nurtured her firm Classical roots, as she was engaged as a soloist at an orchestral concert given by the Leeds Haydn Players, performing the Haydn Violin concerto in G major. 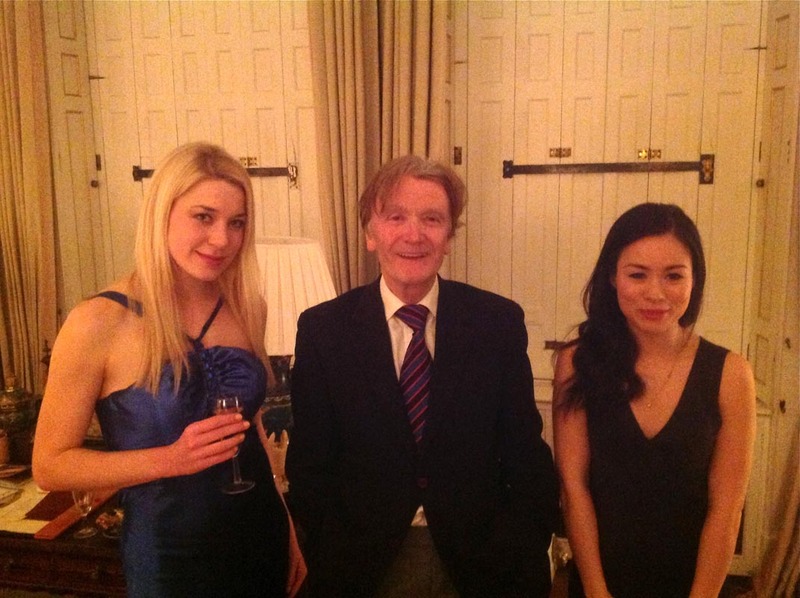 Leland Chen, a pupil of Yehudi Menuhin & Yehudi Menuhin Competition Winner. 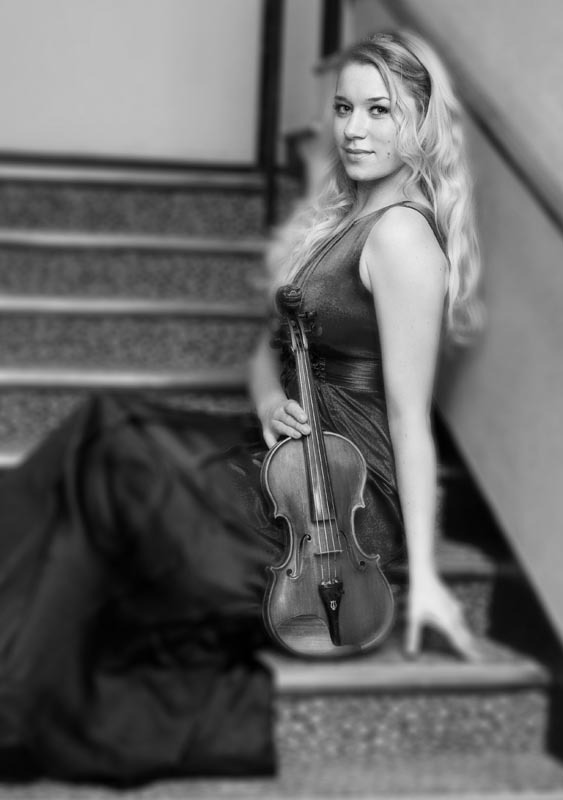 Miranda Playfair, co-leader of the Royal Liverpool Philharmonic Orchestra and member of Joshua Bell of the Academy of St Martin-in-the-Fields Orchestra. Raimondo Koço, First Violin player at Opera North. Prof Lukas David of Cologne. 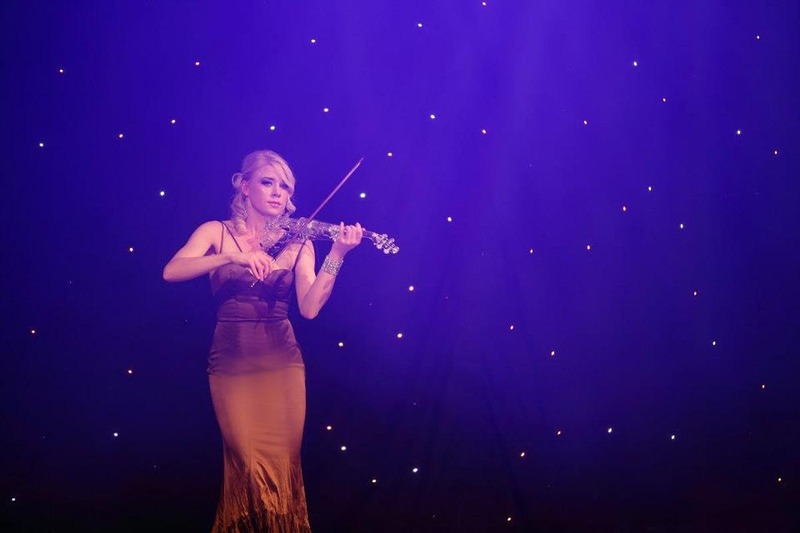 Kate has taken her intensive technical training to lofty heights: performing across the globe, recording beautiful studio albums, and playing live on radio and television. 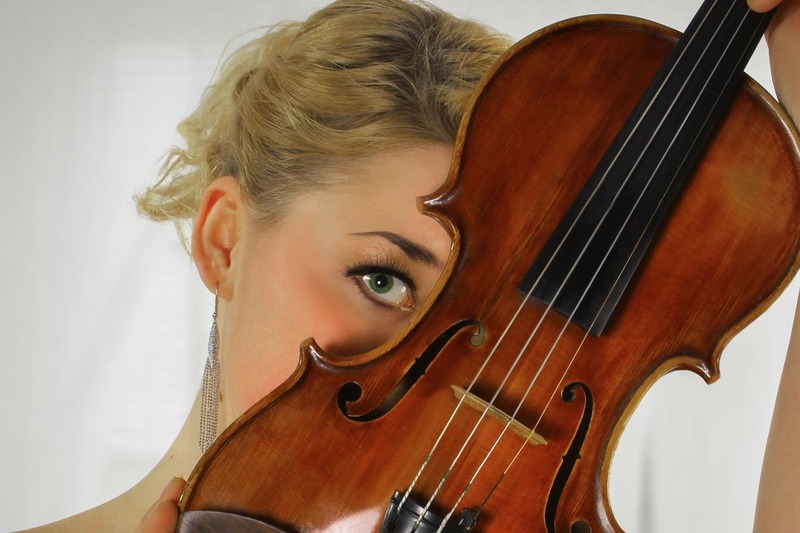 She is now an experienced, acclaimed violinist. 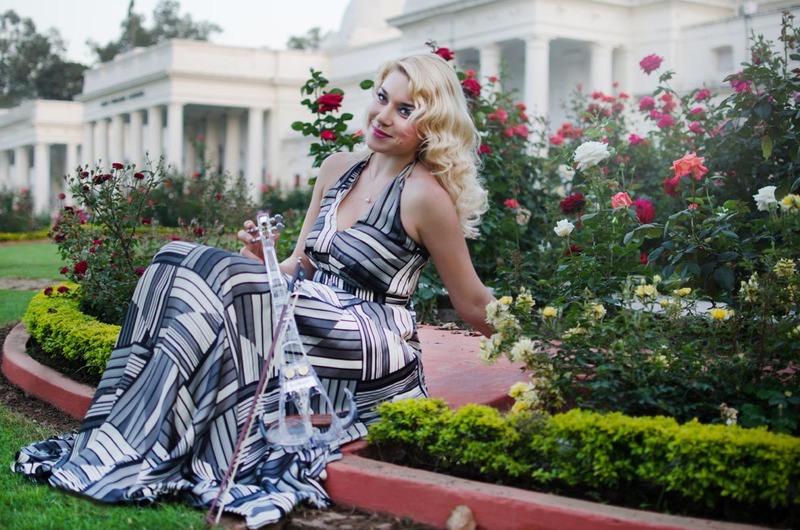 What’s more, she is an innovative and versatile musician. 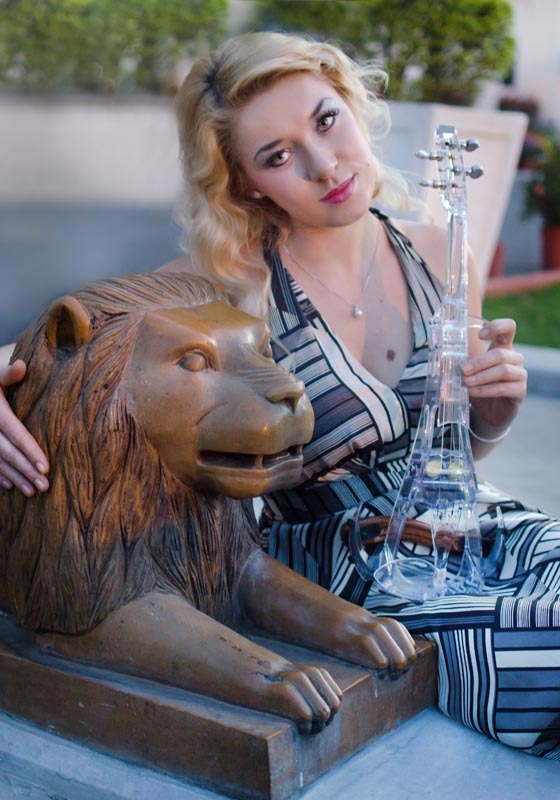 Adeptly, she accompanies full orchestras or small groups; and of course she shines as a stand out solo artist—all in a medley of musical styles. Kate considers every event she plays completely unique. 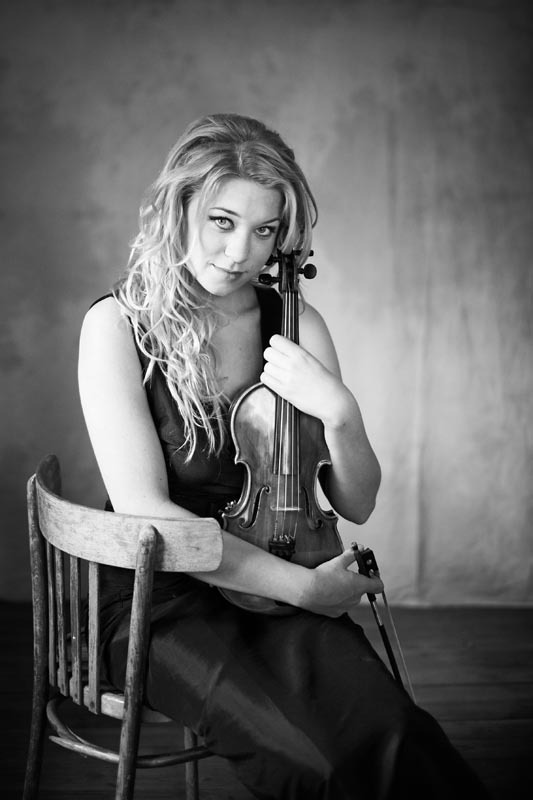 She adjusts her repertoire of styles to suit each audience —whatever their age, mood, or musical taste. 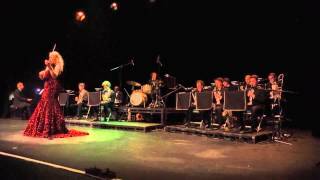 Soothing solos to help everyone unwind. 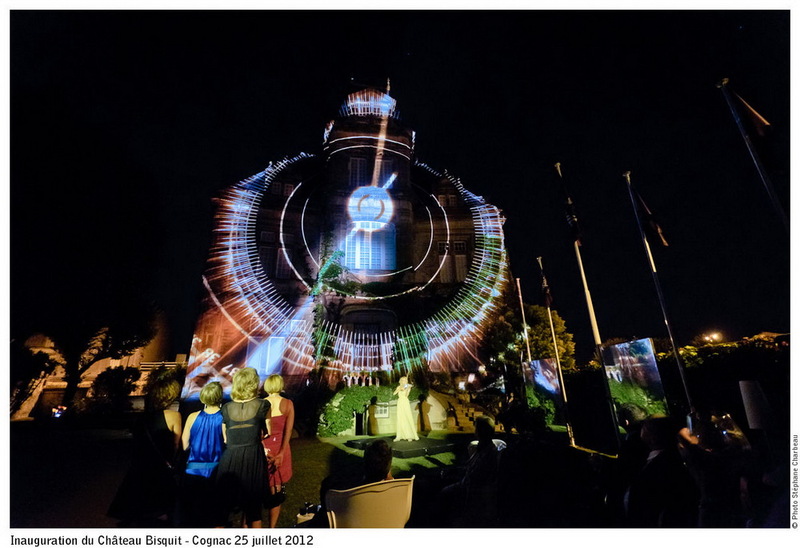 Or accompanying a DJ, band, or orchestra with electric notes to make the crowd come alive. 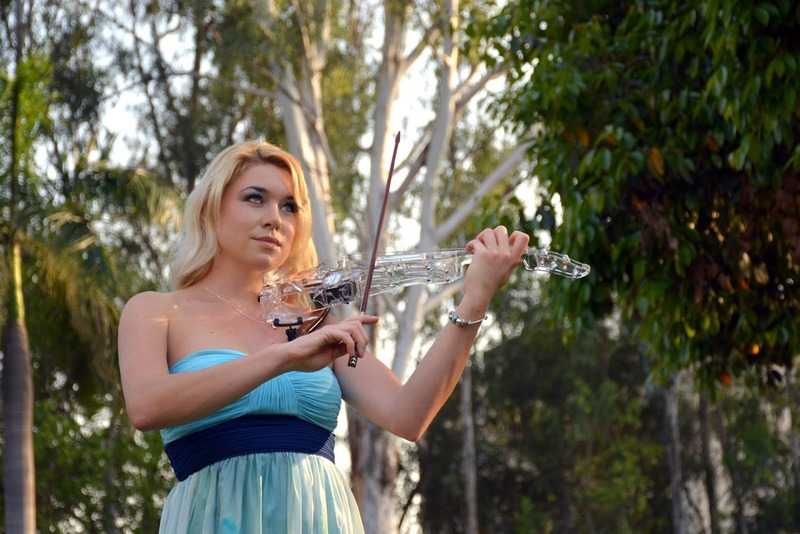 Unbelievably, all from the top of her head—she’s not limited to using sheet music. To complement the craft of such an accomplished performer, the highest quality instruments are essential. 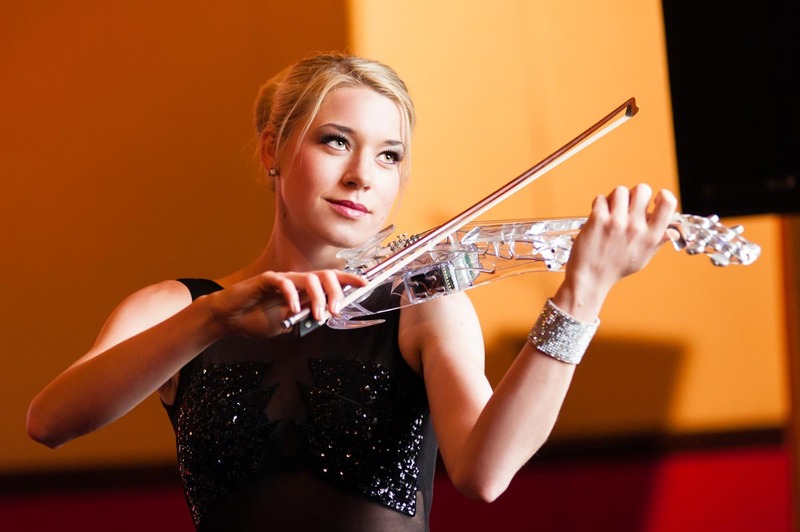 Kate’s violins are like extensions of herself. 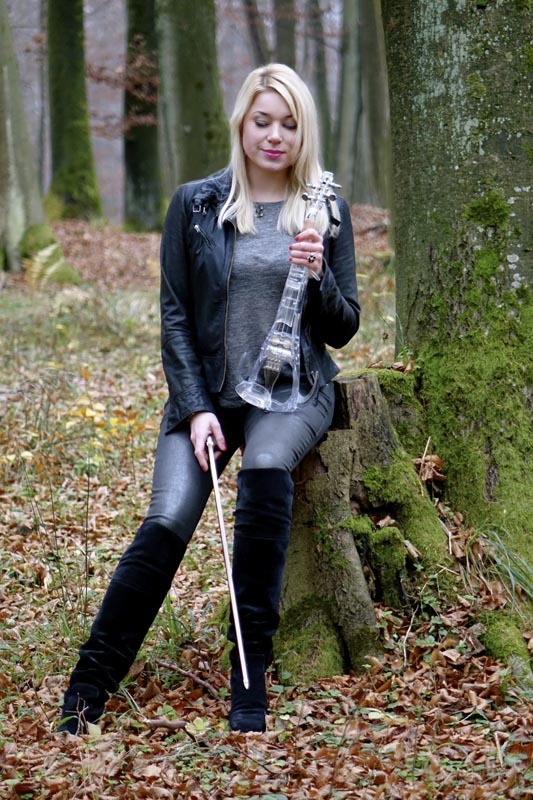 She has been said to be “as one” with her Sobecka’s classical acoustic violin. 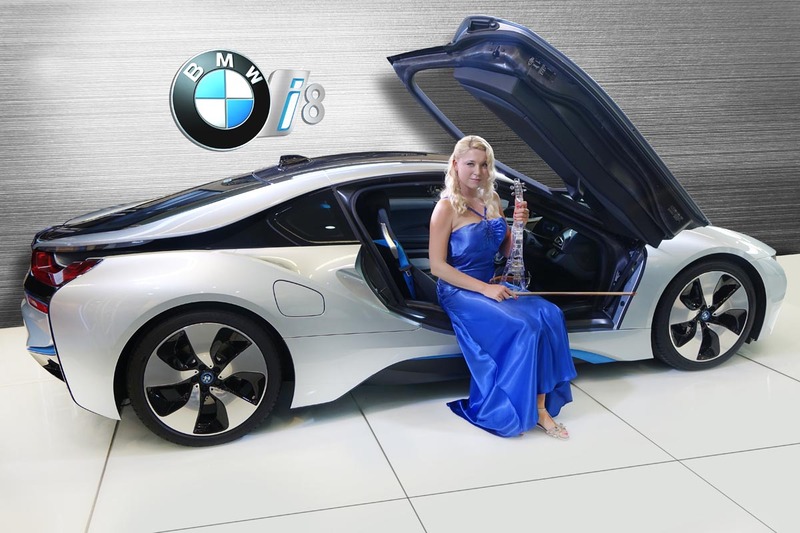 To watch her swaying with her crystal-clear electric violin (masterly crafted by Ted Brewer, winner of the highly-coveted Music Industries Association award) is utterly mesmerising. 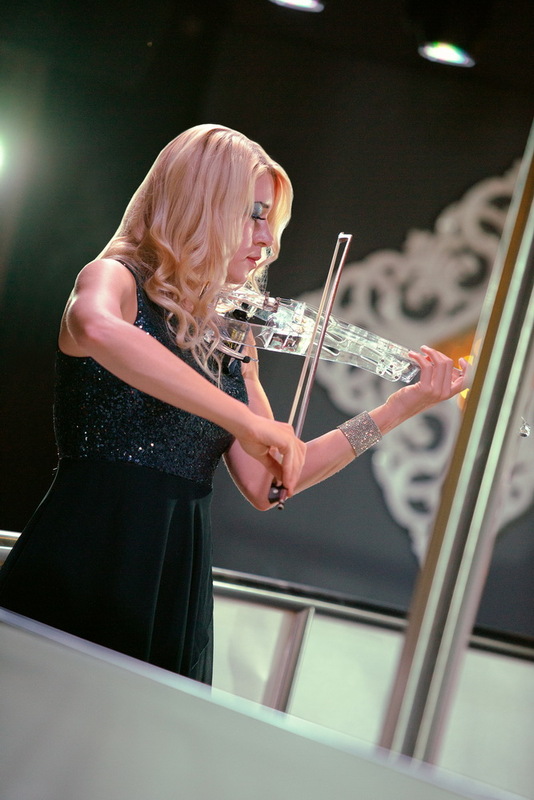 With these instruments at her helm, she can adapt her performance to suit any venue and event. 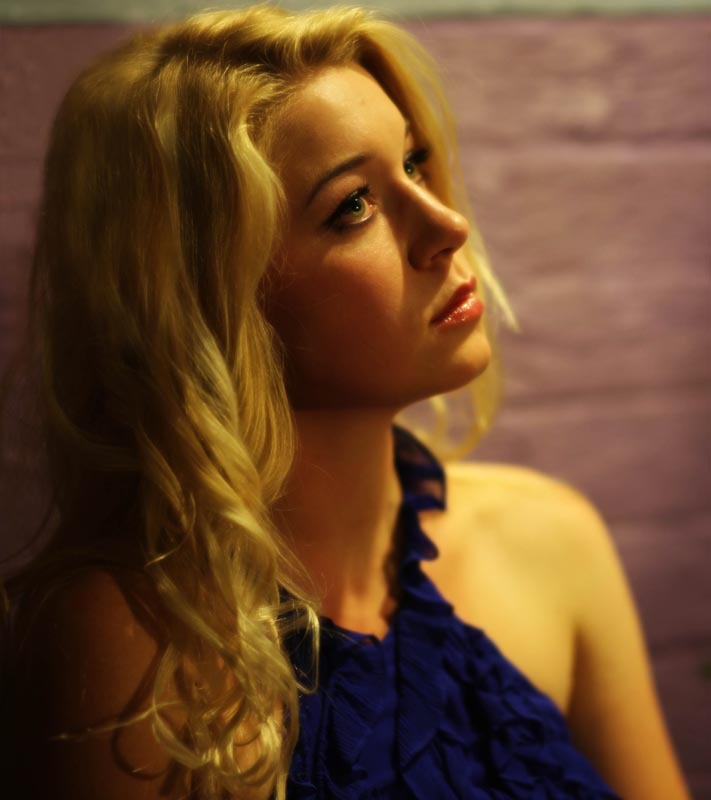 Kate is a young, ascending star who has already recorded two critically-acclaimed studio albums. 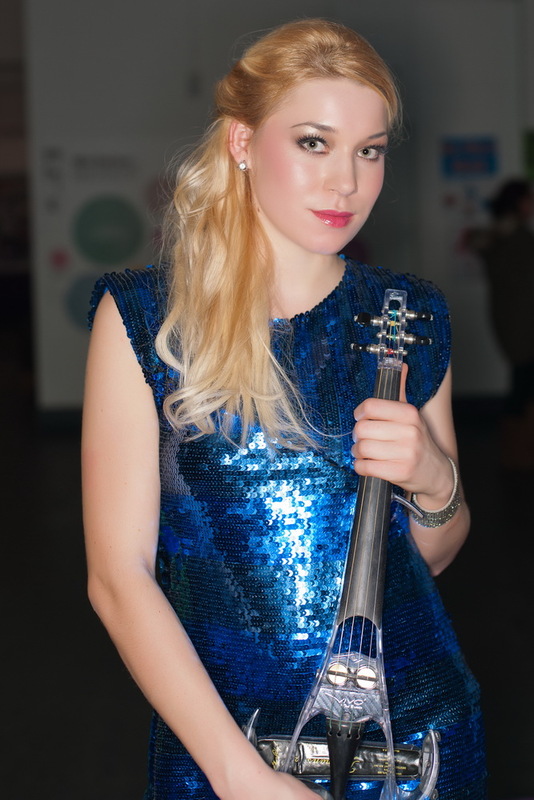 Her artistry has inspired other artists: dancers, skaters, actors and poets have used tracks from Kate’s arrangements as background music for their own performances. 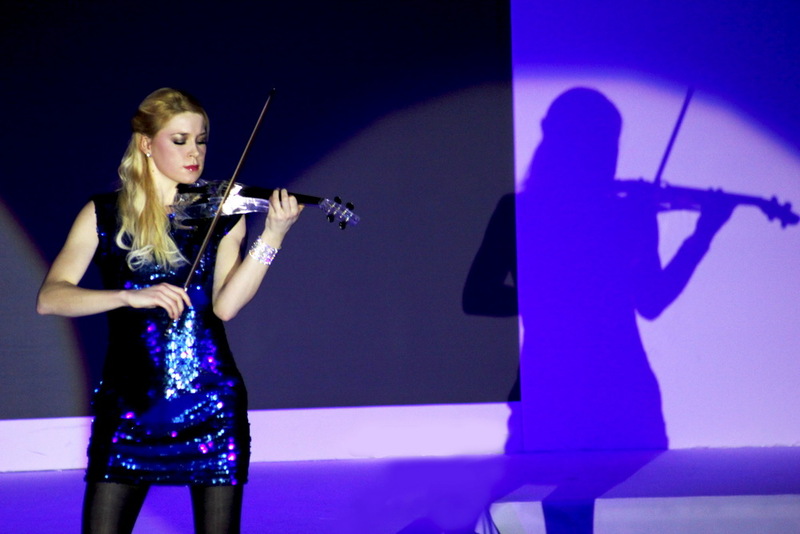 Kate’s debut album, “The Violinist” (2009) sold over 5,000 copies worldwide. 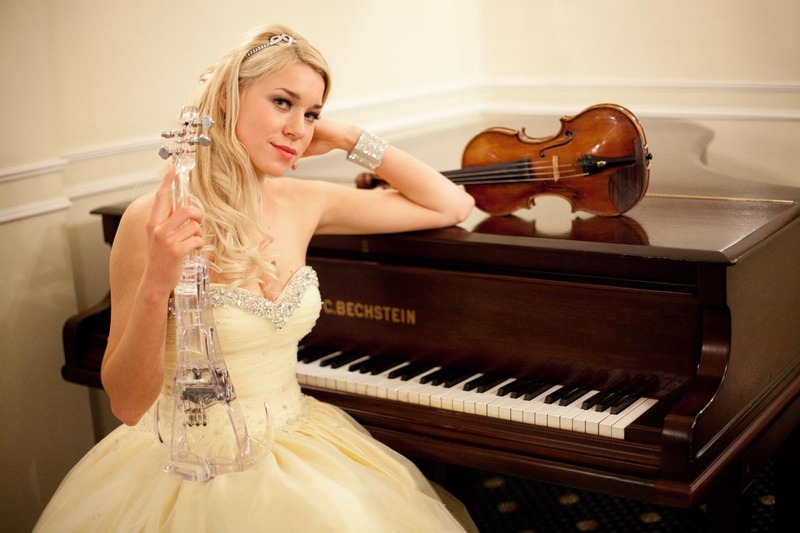 Her second album, “My Classical Interpretations” (2012), (featuring the piano accompaniments of Daniel Holden) which sold over 2,000 hard copies and numerous tracks online. Songs from this album have been broadcast on the BBC and used for programmes on ITV. 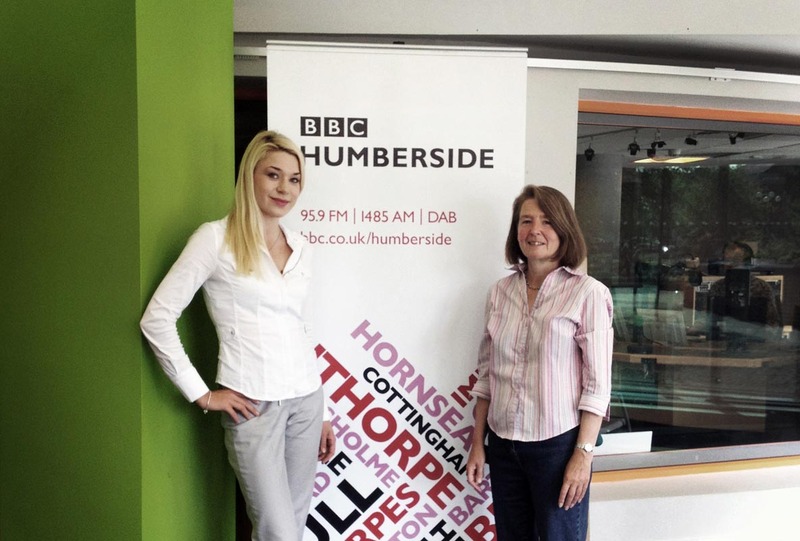 Kate has also performed live on TV (BBC 1, SKY and Arabic Al Sharqiya) and radio (NE1 FM Newcastle and BBC Radio Humberside). 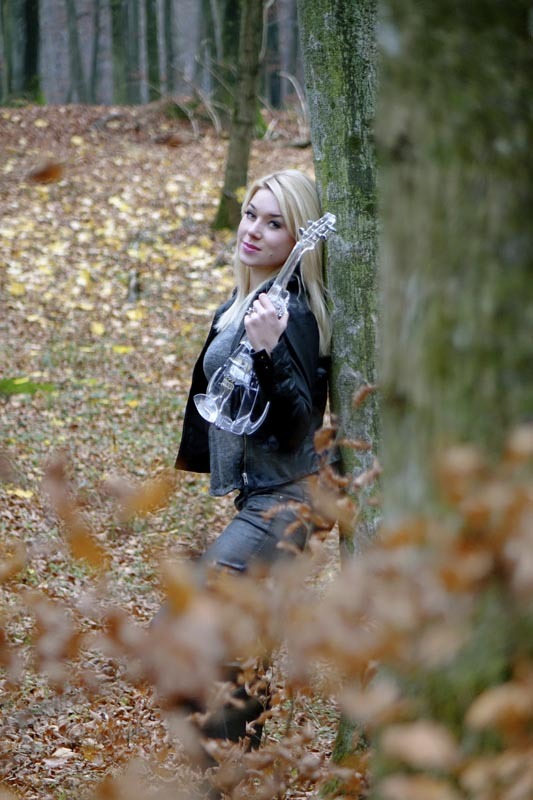 Another success for Kate has been the ever-increasing popularity of this, her website (which has received over 4 million hits) and YouTube channel. 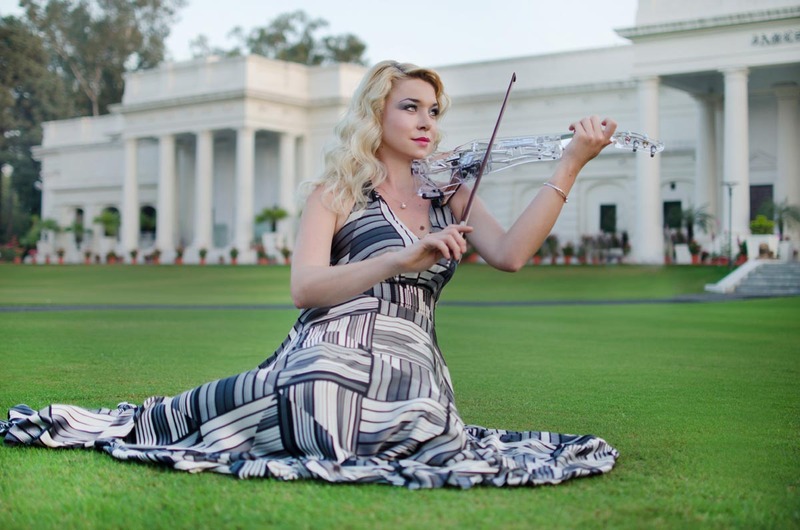 You can be among the millions who have logged on to buy her exclusive singles, and delight in her diverse interpretations of classical gems and modern hits. 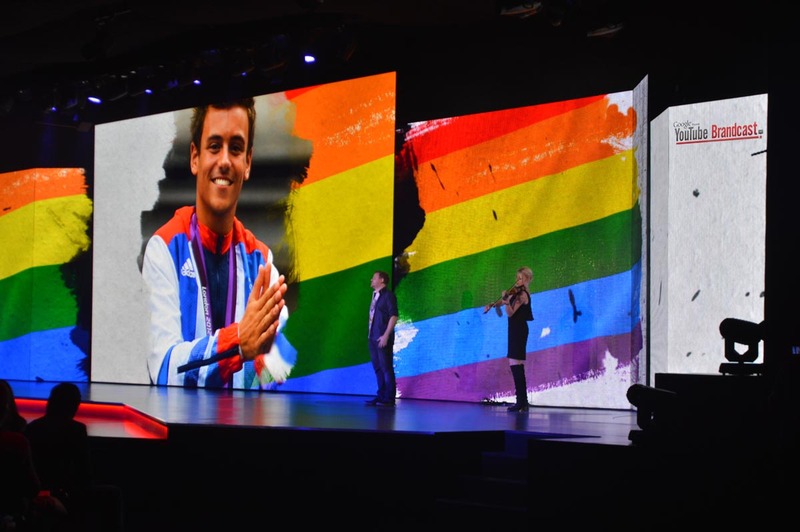 YouTube Brandcast, representing UK for Google, featuring a duet with the poet Mark Grist and performance alongside stars and guests such as: Clean Bandit, Rudimental, Jamie Oliver, Zoella, Google & Pepsi CEOs. The launch of the Macron Stadium in Bolton for over 1000 VIP fans and the Bolton Football team. 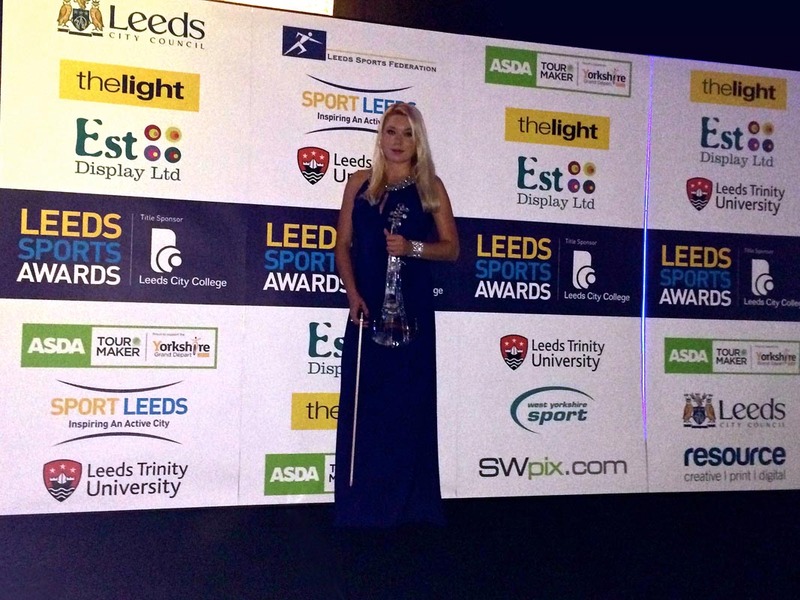 A charity fashion show and the West Yorkshire Police Awards Ceremony at The Royal Armouries (both in Leeds). Fund-raising events for Cancer Research. 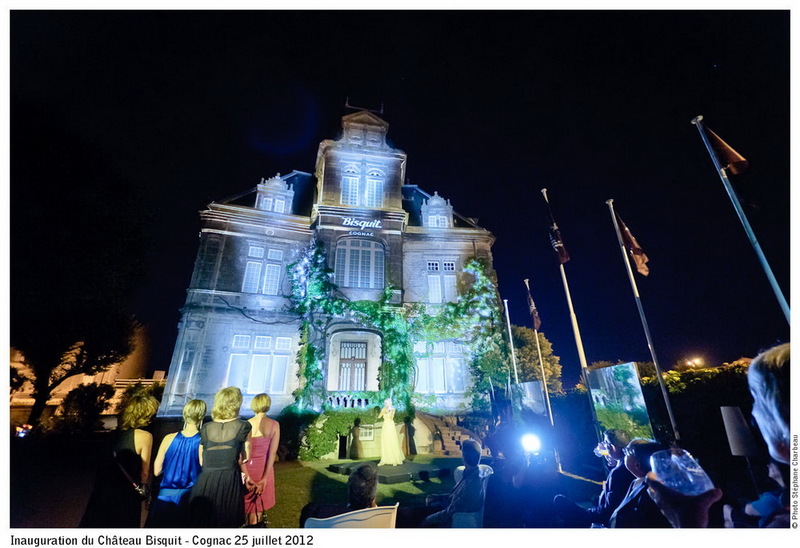 The inauguration of Chateau Bisquit in Cognac, France. 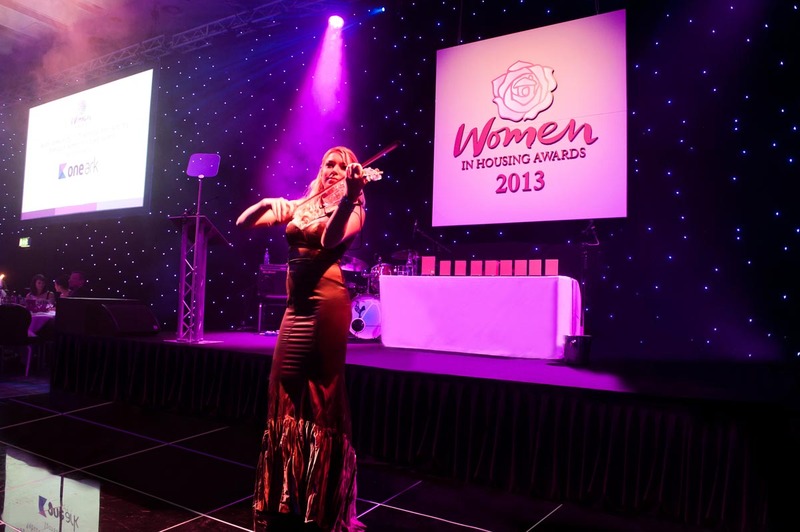 Soroptimist International Charity Ball at Harrogate Yorkshire Pavilions. 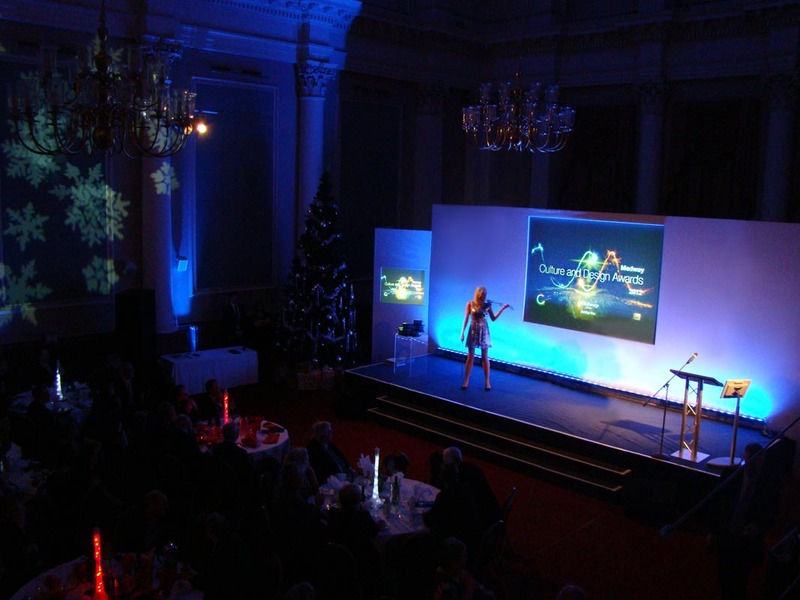 Other notable appearances have included: The European Watch of the Year Awards at Mayfair Hotel, London; The Confederation of British Industry at Parkinson Building, Leeds; The British Society for Haematology, 51st Annual Scientific Meeting, at Stanmer House in Brighton; Eastbourne Bandstand - Electric Night of the Proms and The Northern Design Awards Ceremony in Manchester, Ladies Day at Ripon Races and the Garden Summer Party at Lawrence Batley Theatre. 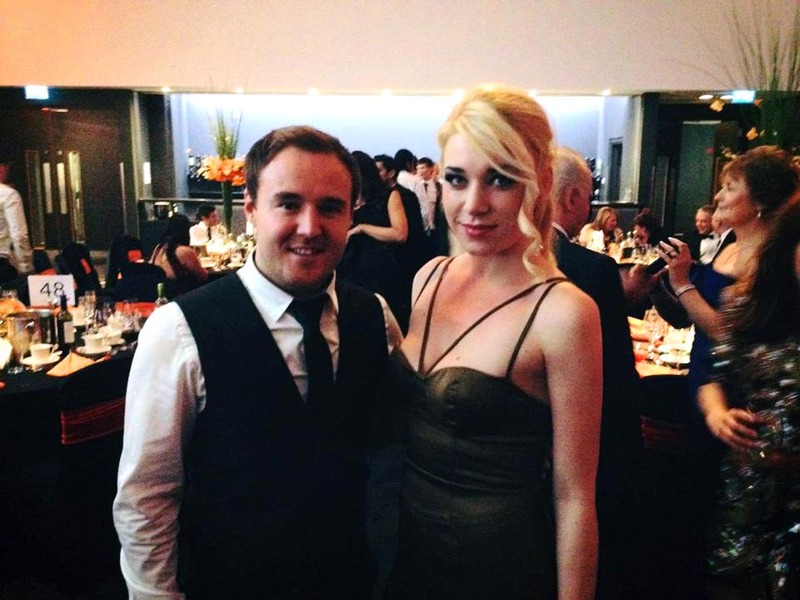 One of Kate’s most acclaimed performances was during the ball, “Once Upon a Smile” (Point Lancashire County Cricket Club, Manchester), alongside the Pop singer Lemar and the band Mend. It was another testament to her immense talent—as well as her open-minded approach to crossing genres and teaming with other artists to make beautiful music. 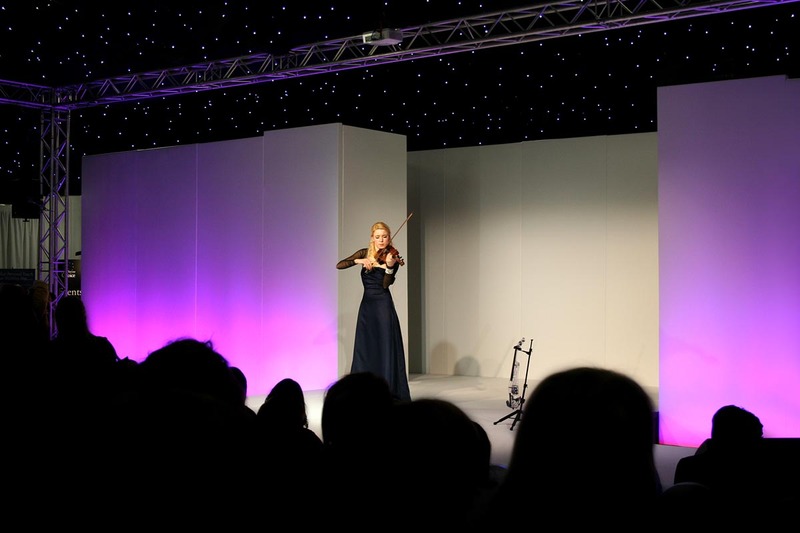 Kate has also had the pleasure of performing at ethereal English landmarks such as: Chatsworth House, Sledmere House, Bolsover Castle, Allerton Castle, Ripon Cathedral and York Minster. 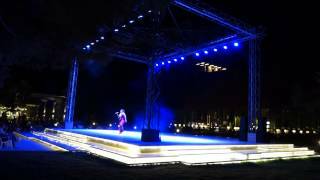 In Europe she has played at venues in several countries, including Germany, Switzerland and the Czech Republic, and, further afield, in Turkey for Maxx Royal Hotels. 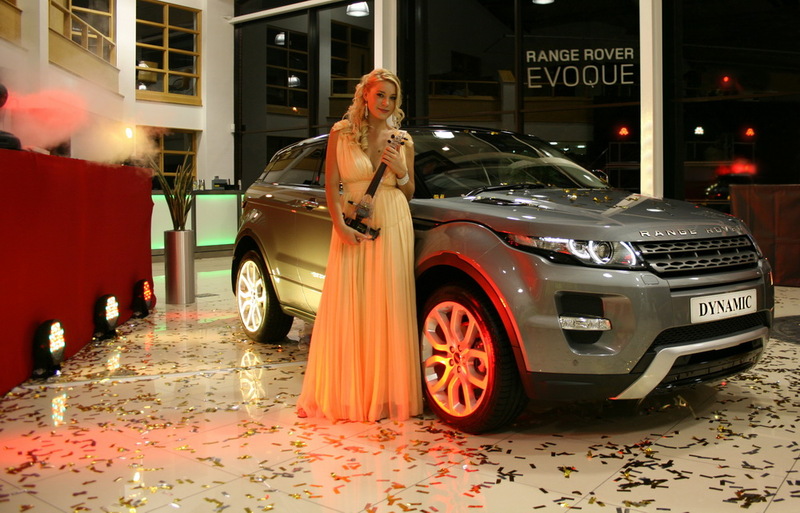 Along with prestigious locations, Kate has performed at private parties for prominent clients. Celebrities such as Steve Coogan and V.I.P.’s such as: The Rt. Hon. William Hague, Karren Brady, Sir Tatton Sykes, the Swinton Family, and Andy Clarke (CEO for ASDA UK). 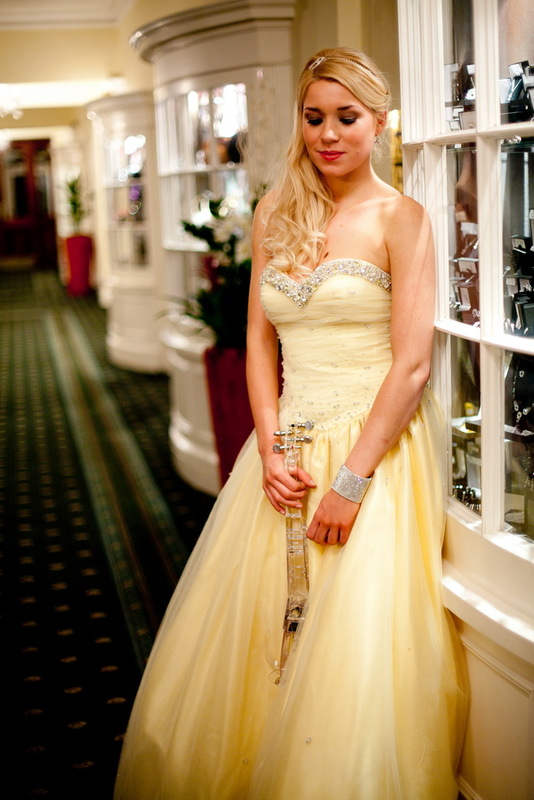 She recently played at the wedding for Yeovil Town goalkeeper Chris Dunn. What‘s important to Kate is to please whatever audience is watching, and she happily takes specific requests and specially learns new songs. 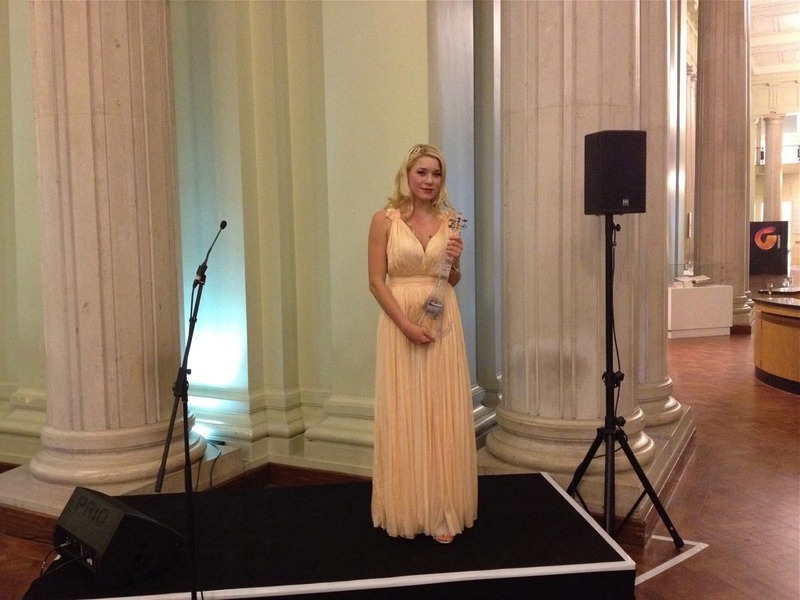 Kate was awarded “Best Music and Entertainment” by the Wedding Guide in 2013 (and was a finalist in 2014). 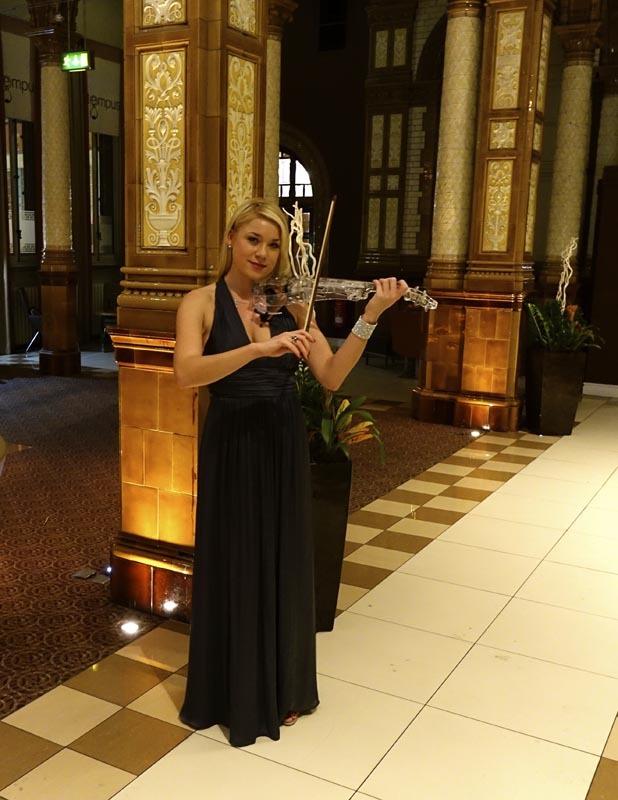 She’s added an essential touch of elegance to wedding ceremonies, breakfasts and drink receptions in the UK and across the world (from Italy to Ireland and Spain to France). 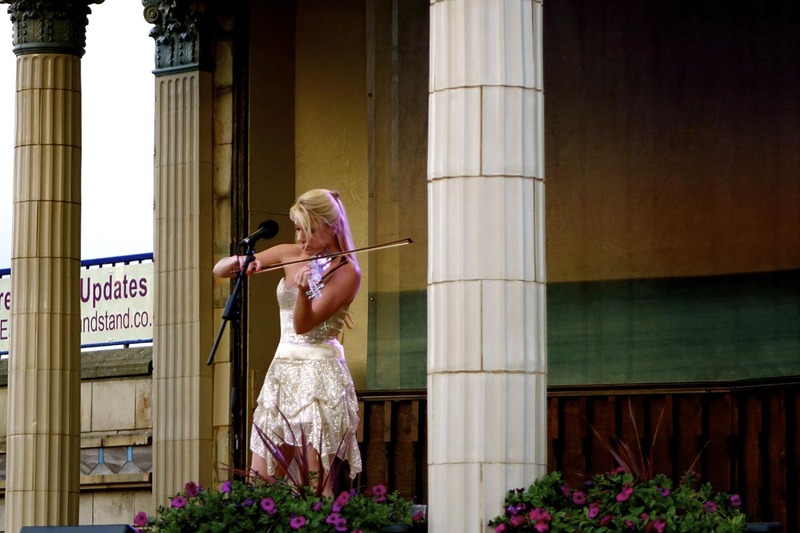 She is widely regarded as one of the top wedding violinists in the country, and has entertained guests at some of the UK's most famous venues, including Chatsworth House, Hazelwood Castle, Allerton Castle, Maften Hall, Coombe Abbey, Carlton Towers, Castle Howard, Beamish Hall, Rudding Park, Swinton Park, Tunnels Beaches and Wynyard Hall. 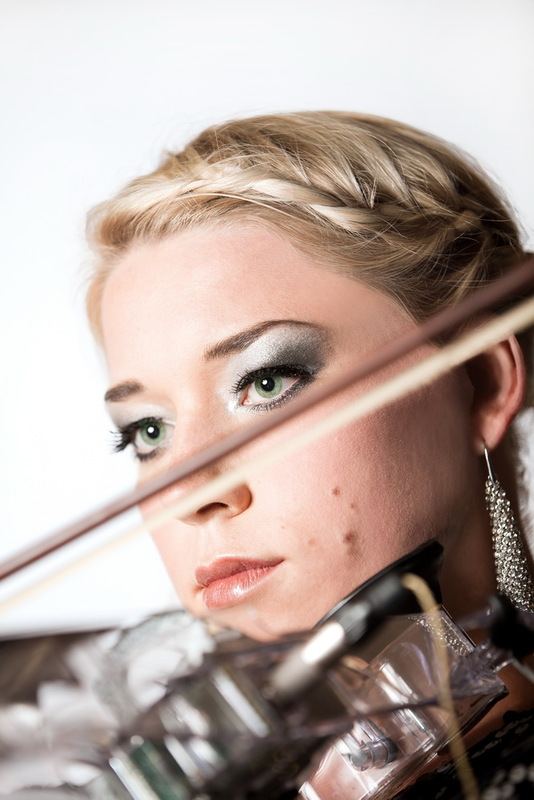 Possessing so much talent and tenacity within her, Kate Chruscicka certainly has a bright, diverse future ahead of her. 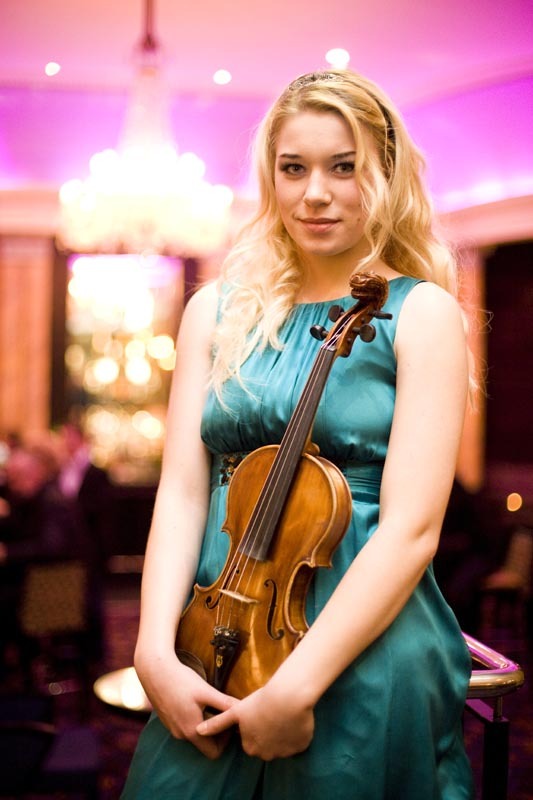 She has recently become a member of British Philharmonic Orchestra. 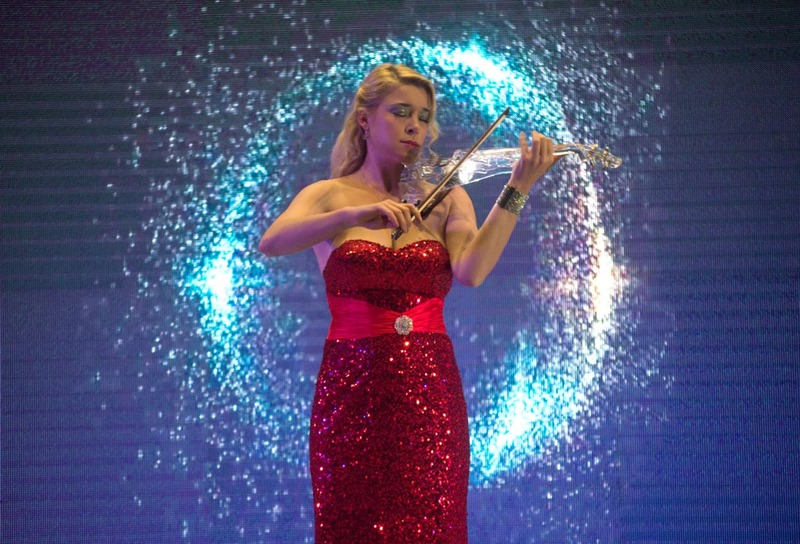 This winter, she will be embarking upon one of her many UK/European tours with the Orchestra: The War of The Worlds. 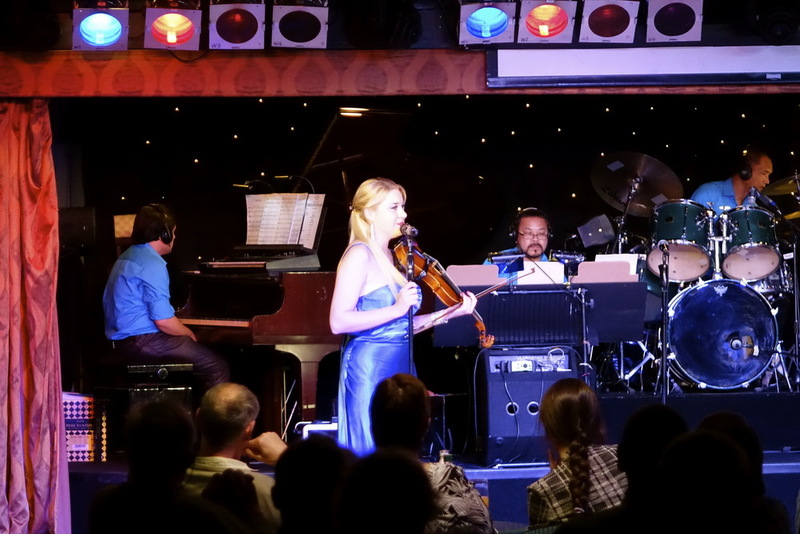 A highlight for Kate in 2015 has been performing her spectacular violin shows as a headliner for Fred Olsen Cruise Lines, where she received a standing ovation. 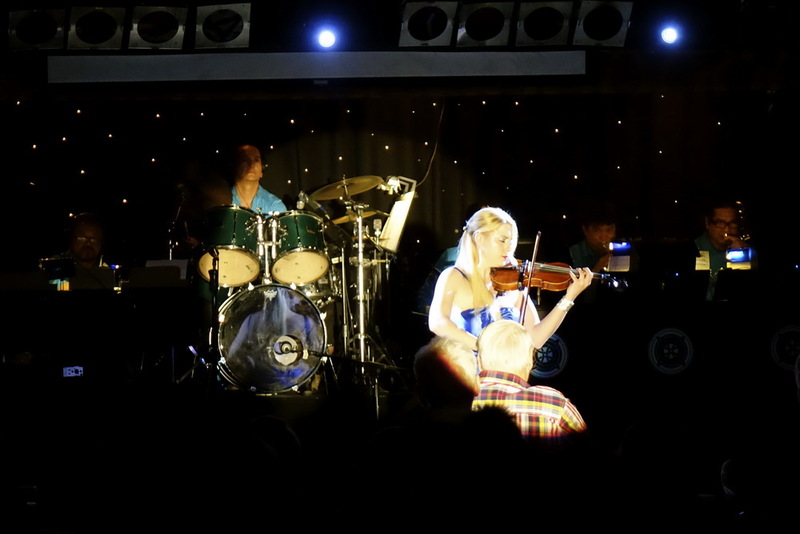 She will be performing further shows aboard cruises through the Caribbean, Norway, Iceland, USA and the Canary Islands. 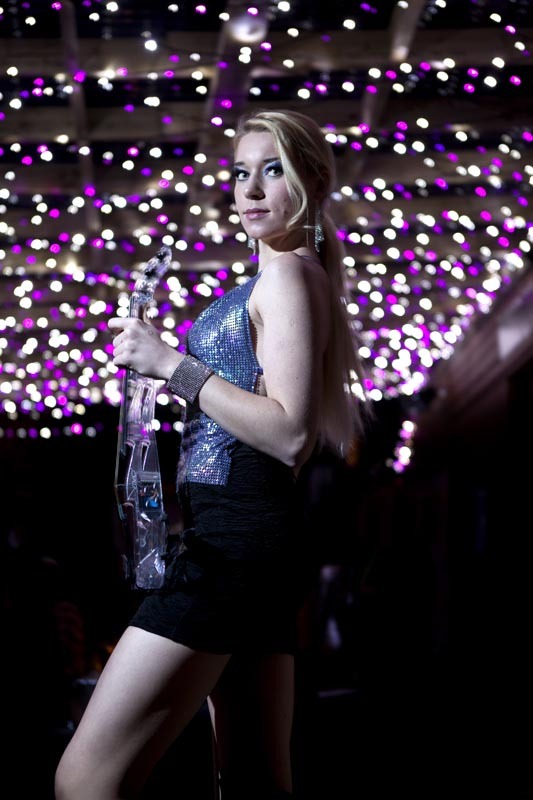 Kate loves performing and is eager to record more studio albums. 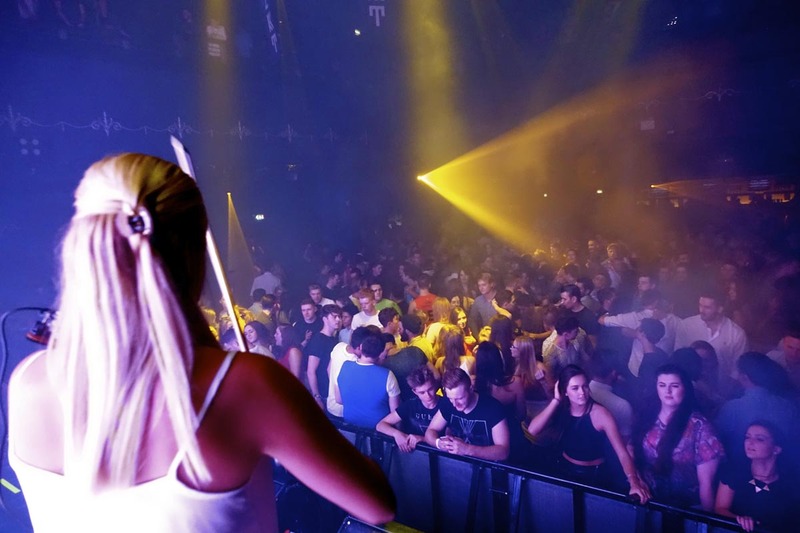 She will embrace playing at new venues and events across the UK and around the world, whether it’s for a few guests or a crowd of thousands. 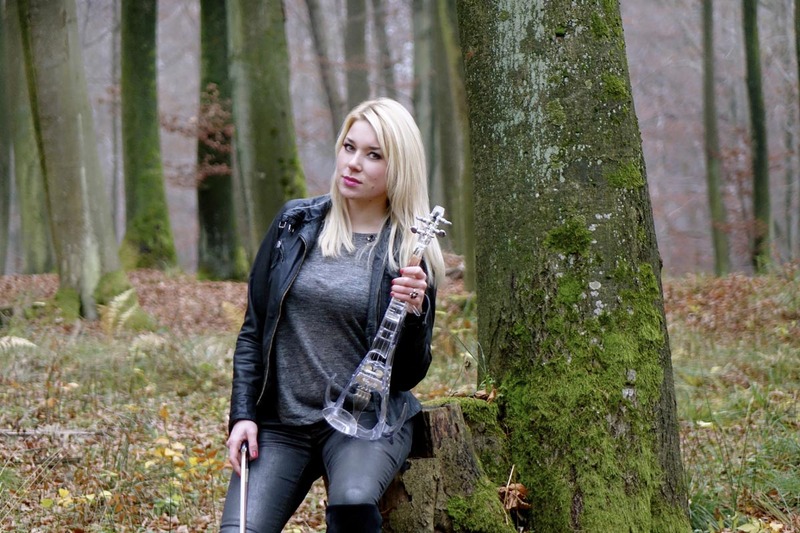 She is keen to collaborate with other artists—from the Electrify Duo to Spanish guitarist Eduardo Niebla—creating new, exciting styles of music. 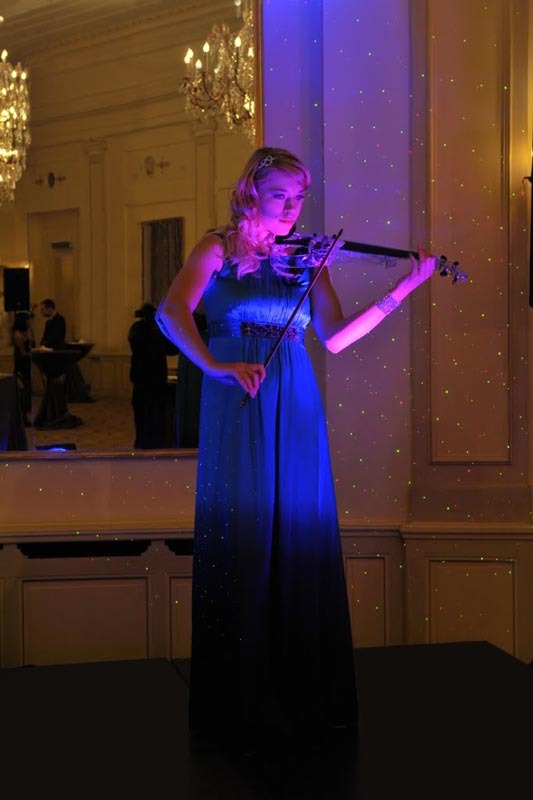 Imagine greeting your guests with graceful notes cascading from Kate’s violin. 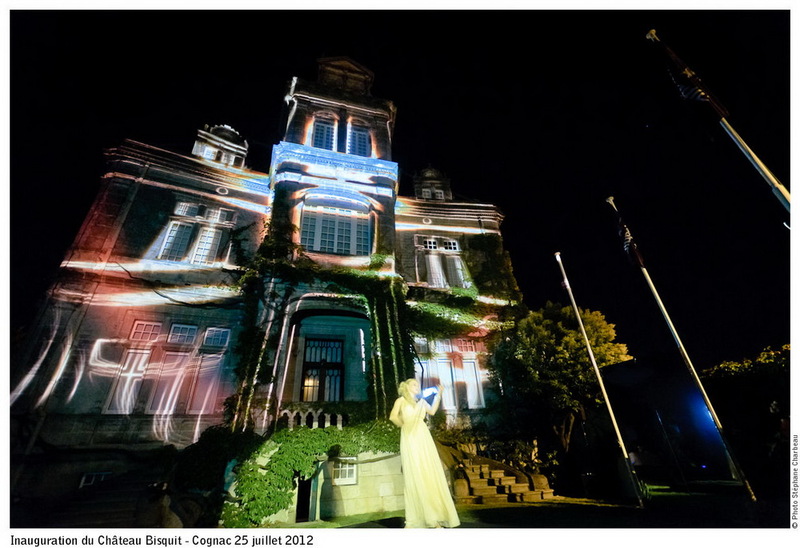 The sublime sound builds as the bride advances…subtly enhances the signing of the register…and proclaims the grand departure of the joyful couple, followed by friends and family. 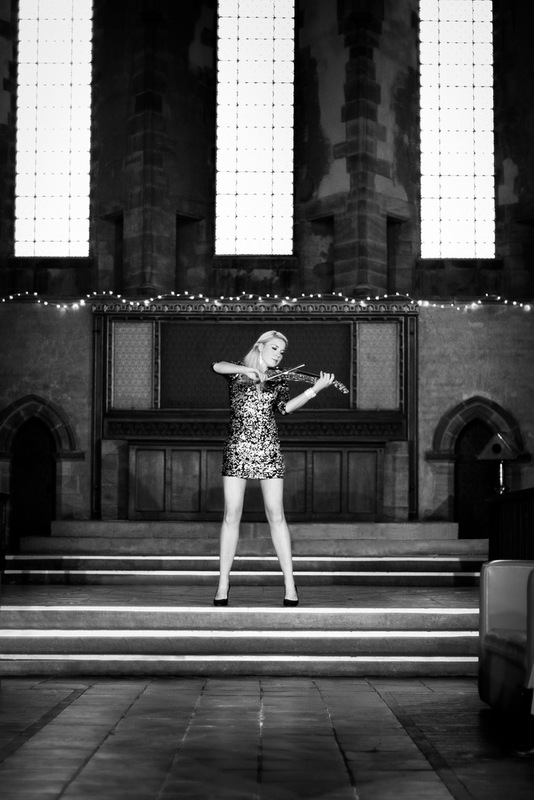 Kate can set an immaculate tone during your ceremony, whether solo or accompanying a choir. It’s your day so you can select each song, and when you’d like Kate to play during the proceedings. Of course, she is happy to help you decide, and can even learn your special request. Kate’s performances are moving—literally. 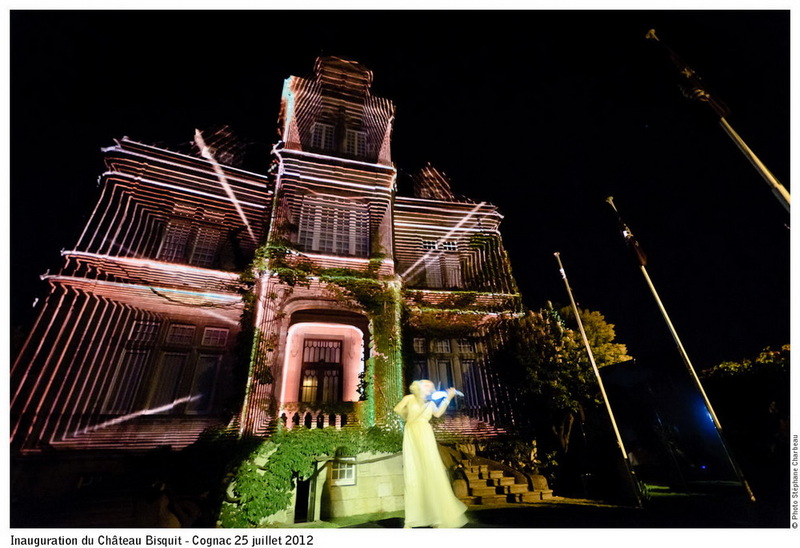 She moves with you, uplifting proceedings inside and outside the venue. 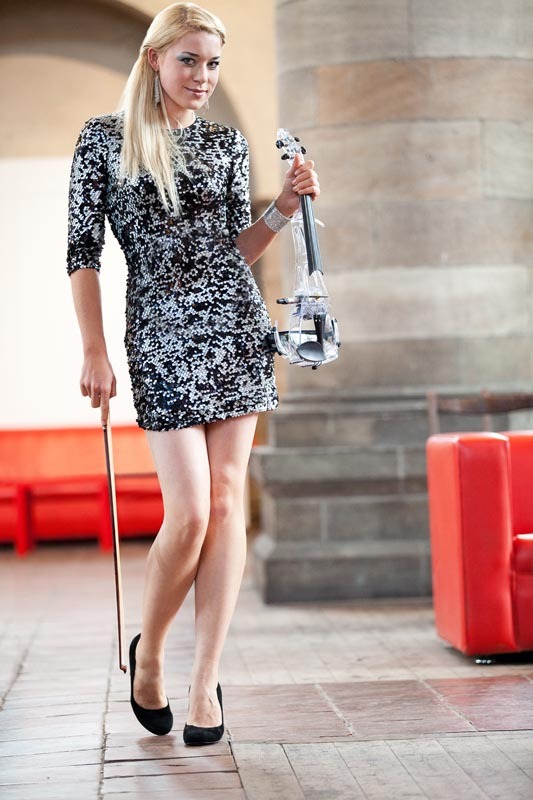 A wireless transmitter allows her to play her electric violin at the perfect pitch whilst she glides amongst your guests. 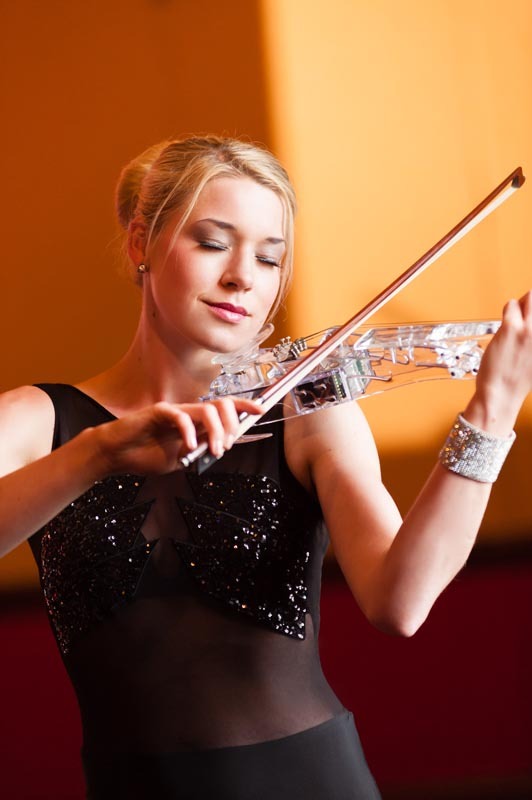 Her clear instrument glistens like crystal as Kate creates a radiant atmosphere of elegance. It’s unique entertainment thoroughly conducive to mingling. Complementary to hors d'oeuvres and champagne sipping. She can even serenade as you pose for the pictures you’ll hold forever. Sharing a meal with loved ones is often the highlight of a wedding day. 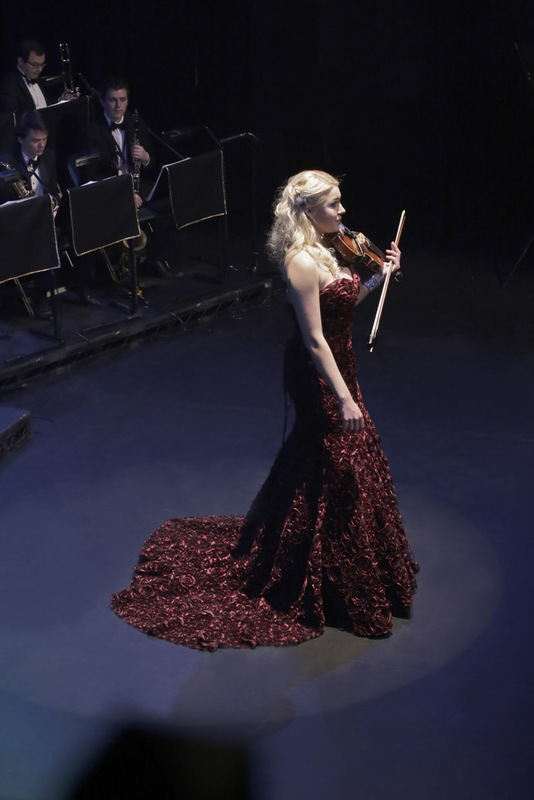 Kate’s playing can make this momentous time more elegant and festive—whether performing throughout, or anytime during the feast. 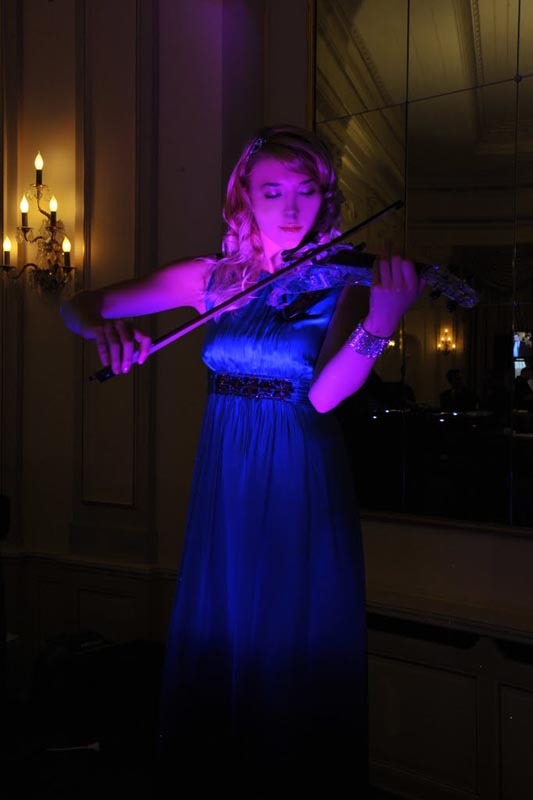 Warm chords coming from Kate's violin can enhance the ambience, to encourage conversation and laughter in between toasts and speeches. As the proceedings move along, so can the music. Kate can use her wireless transmitter to spread joy from the top table to every guest. 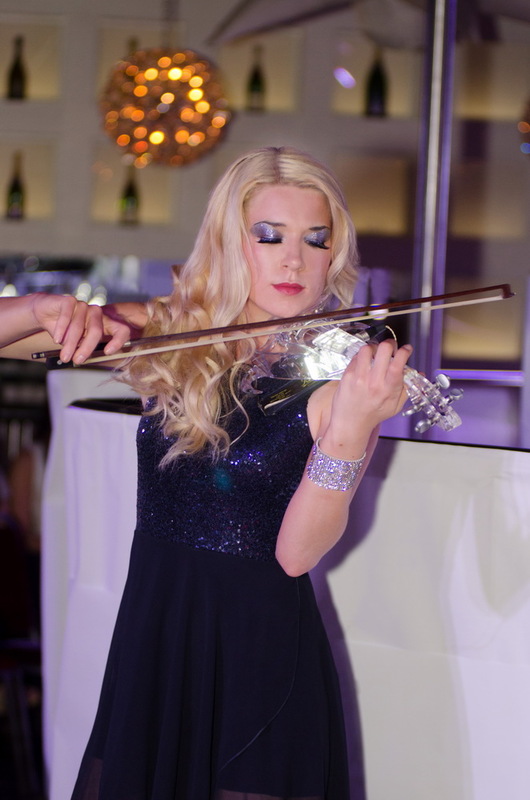 Kate will personally consult with you about what special melodies can complement your beautiful banquet. 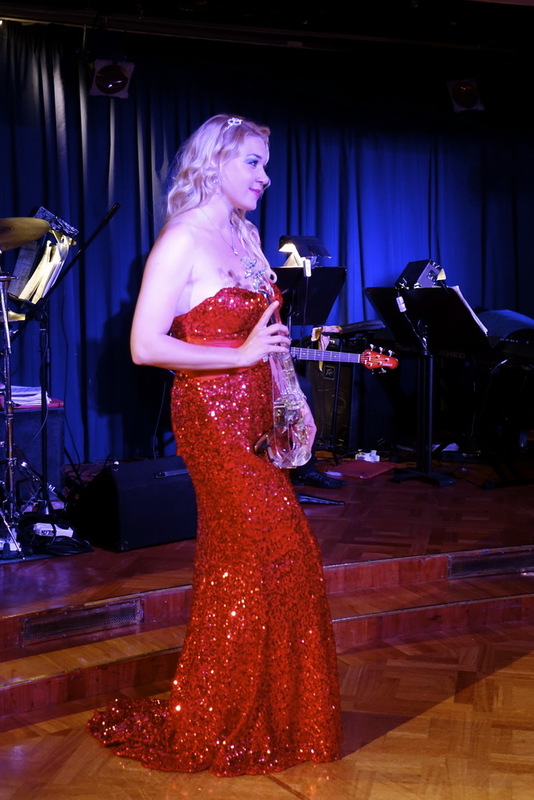 After Kate subtly scores the more formal part of your special day, she can absolutely electrify your evening festivities—as a solo performer or alongside a band or DJ (she has even done sets with DJ’s like world-famous Mike Freear). 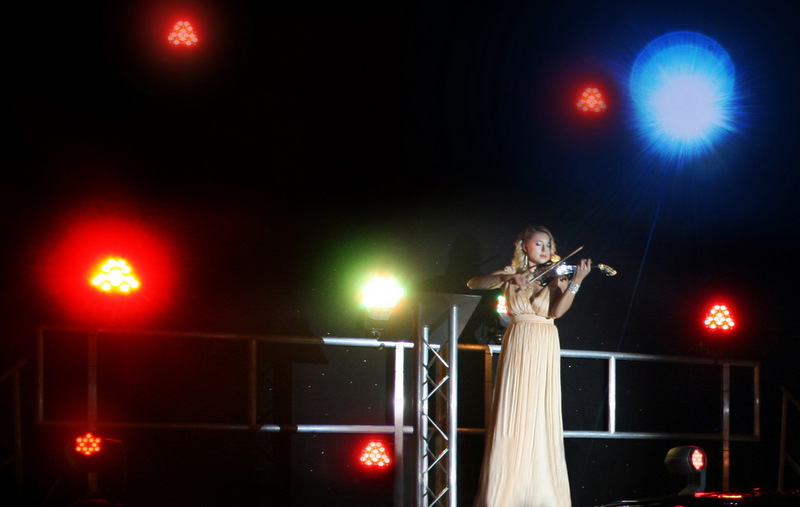 Kate can recommend a live DJ for the show, or provide studio pre-recorded backing tracks as per your requirements. 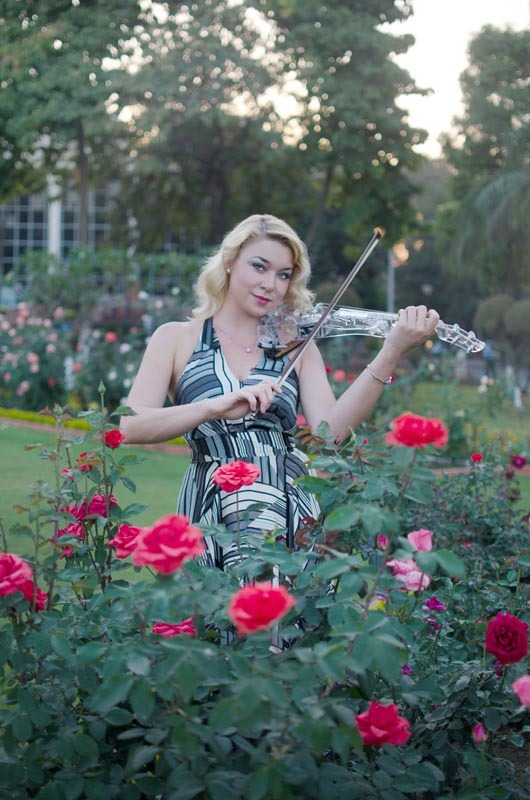 Again, your wish is at her fingertips, as Kate’s violin can inspire different forms of dance, moving from fast-paced pop hits to classic romantic ballads. To find out more, you’re welcome to visit Kate at any of her up-coming wedding fairs (she may even be able to get you some free tickets!). It would be worth it just to witness a morsel of Kate’s live performance—which will inevitably make you want to hear more. In the meantime, here are answers to some of your possible queries. How long does Kate usually play for? As aforementioned, Kate caters to your wishes. During a wedding breakfast she tends to play for up to two hours, and will finish just before you are to have your speeches or your deserts are cleared . 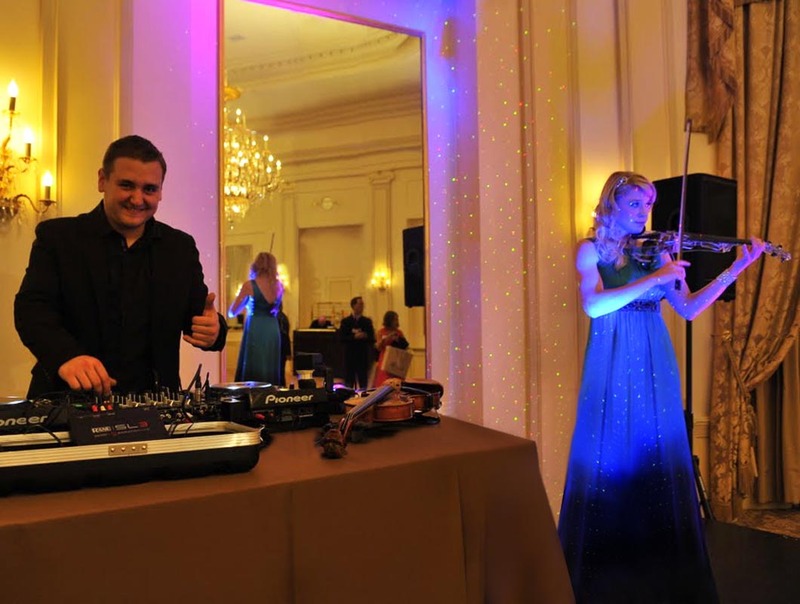 Her evening electric violinist show is usually divided into two 25 minute sets, but if you do choose the live DJ option, don’t worry, the DJ can keep the music flowing until the end of the night. What does Kate’s typical wedding performance consist of? Here is a simple guide as a starting point. You can expect Kate to arrive about hour and a half before your guests, which is about how long it takes for Kate to set up for amplified performances. What if there is no power supply at the venue? Kate will come equipped with portable generators to power amplifiers. Can you provide pre-recorded music to play during breaks? Certainly. Anything it takes to make your special day more momentous, Kate is happy to help. 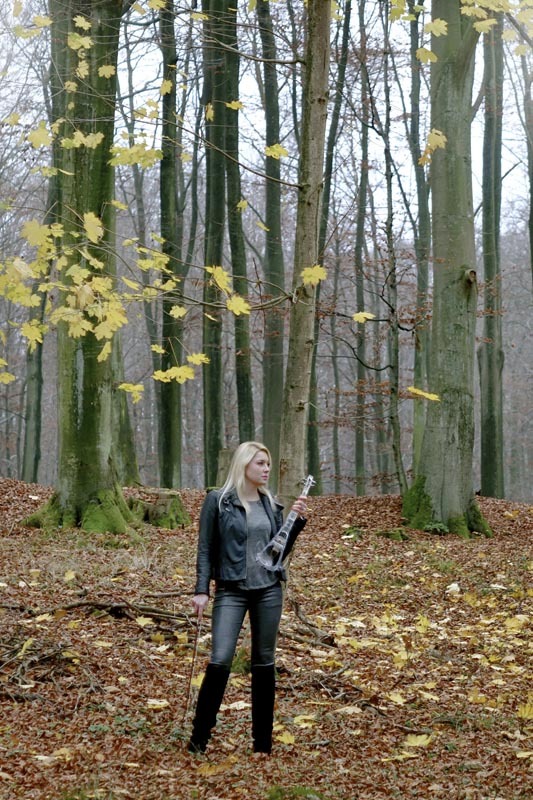 What equipment does Kate use? 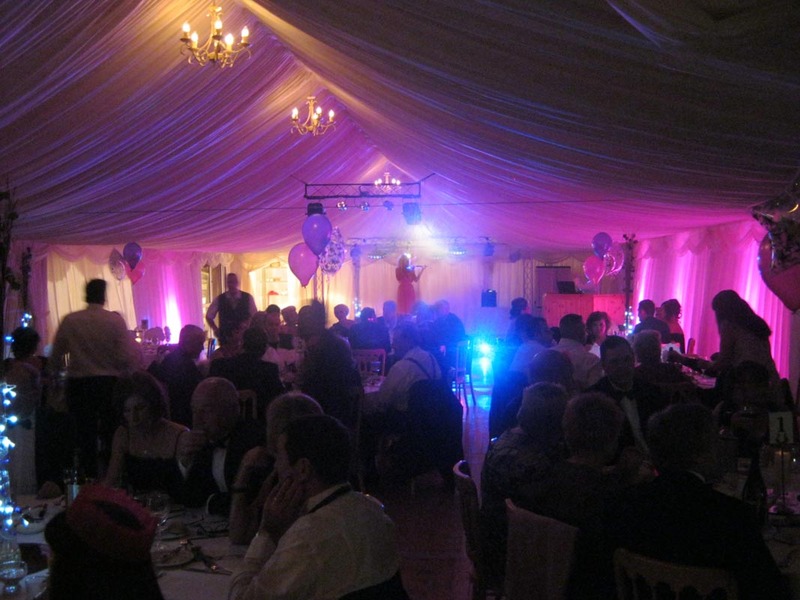 PA system – Bose LS1 Model 2 – can amplify up to 500 people – mostly used during inside drinks receptions, Wedding breakfasts and evening entertainment. Whatever you’re wondering regarding entertainment at your wedding, please contact Kate for further personalised advice. Of course, with Kate’s ever-increasing popularity it’s best to plan well in advance! 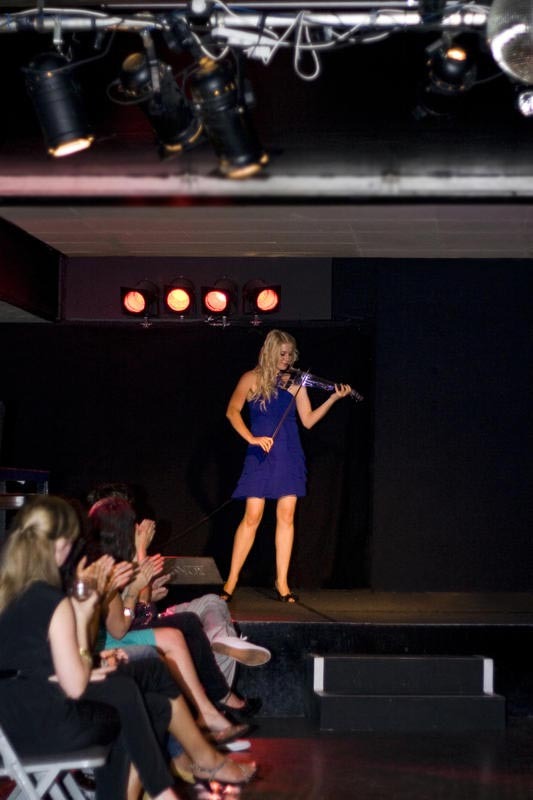 Kate’s impassioned violin performances can also help proclaim the miracle of new life at Christenings. She can subtly add a dramatic score to the blessing. Or lift the spirits of friends and family with a performance at the post-Baptismal party. Kate can take a simple Birthday Party and transform it into a true extravaganza. You can reduce the pressure of your planning by consulting with Kate before the bash. Perhaps you have a theme in mind? Kate can arrange a fitting ensemble. 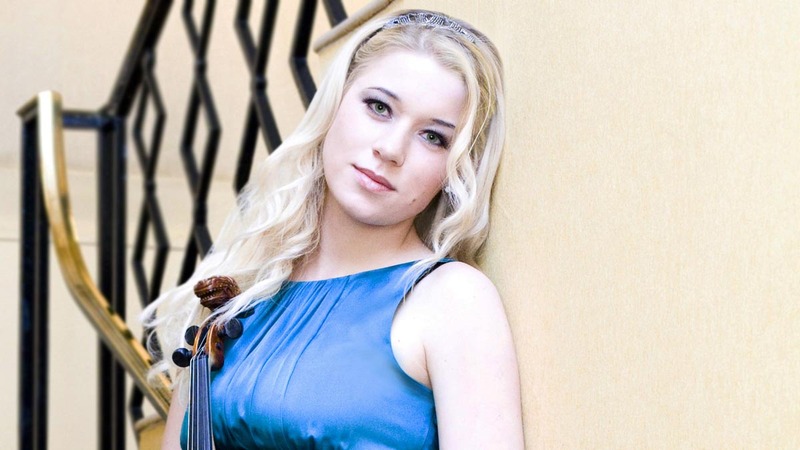 She can also make recommendations from her extensive repertoire—from Massenet and Mozart to Michael Jackson and Metallica. If your favourite tunes aren’t on her list, Kate will practise until these are yet more songs she knows by heart. 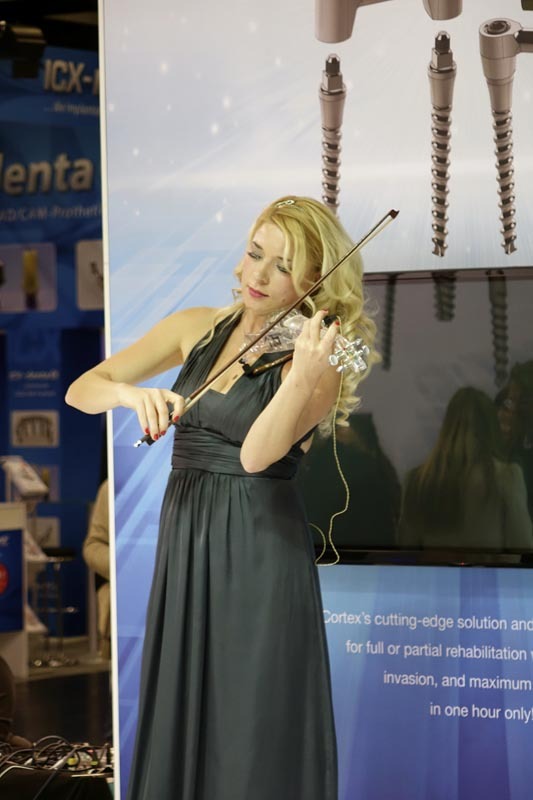 It’s also flexible how and where Kate performs. Fast or slow, inside or out. 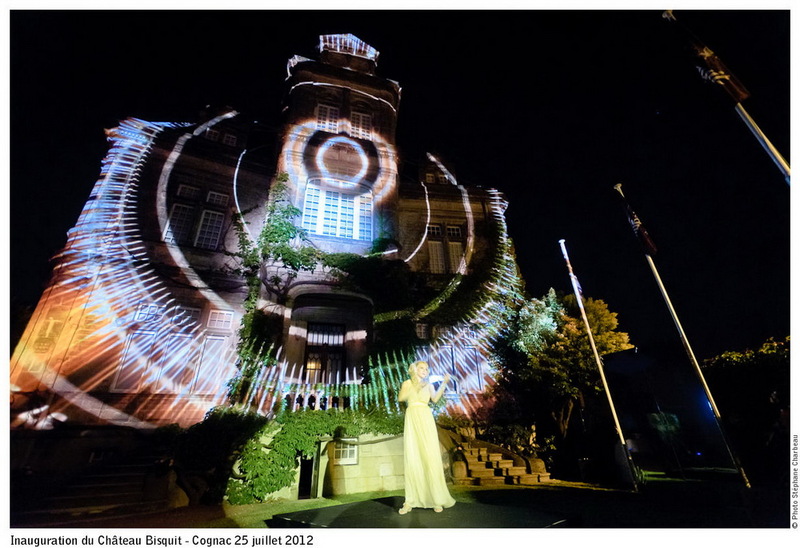 She has the liberty to move amongst your mingling guests (using a wireless transmitter and her own amps). 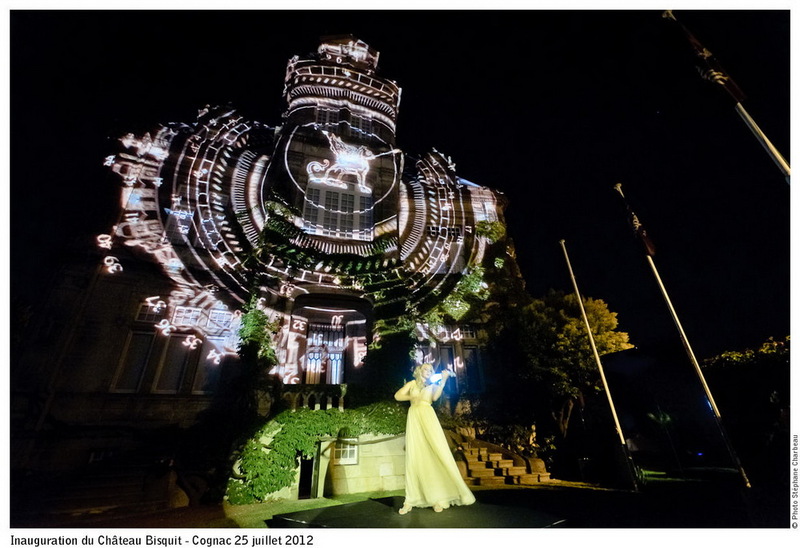 She can even elevate your party to an amazing concert—performing her solo show or in sync with a DJ or other artists. Kate’s violin performances are also the perfect stimulus to celebrate a couple who’ve stuck together for so many years. At an Anniversary Party, Kate can make it seem like the dynamic duo are getting married all over again! How you pay tribute to such a milestone is up to you. 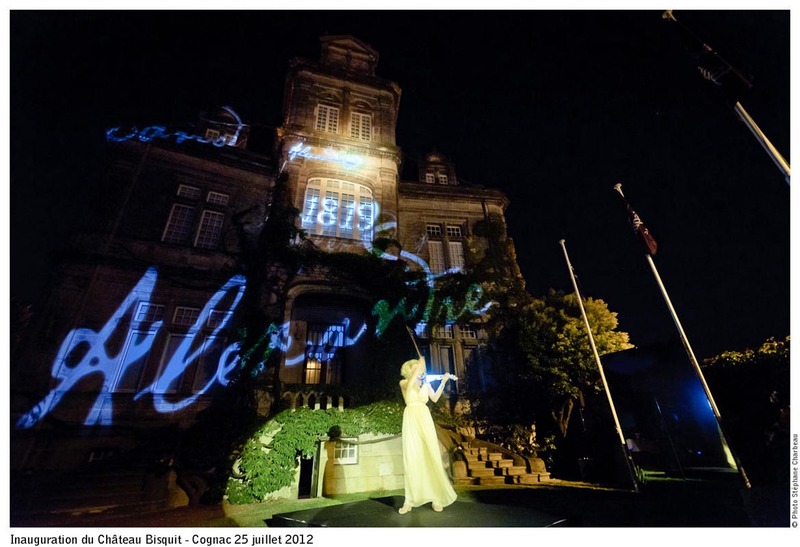 Kate can compile a theme to honour the couple’s commitment. 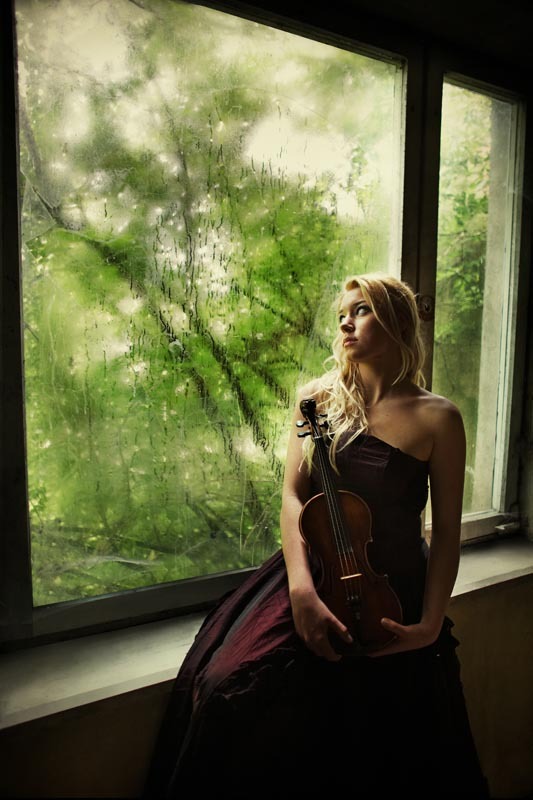 Perhaps play the special songs that first sparked love. 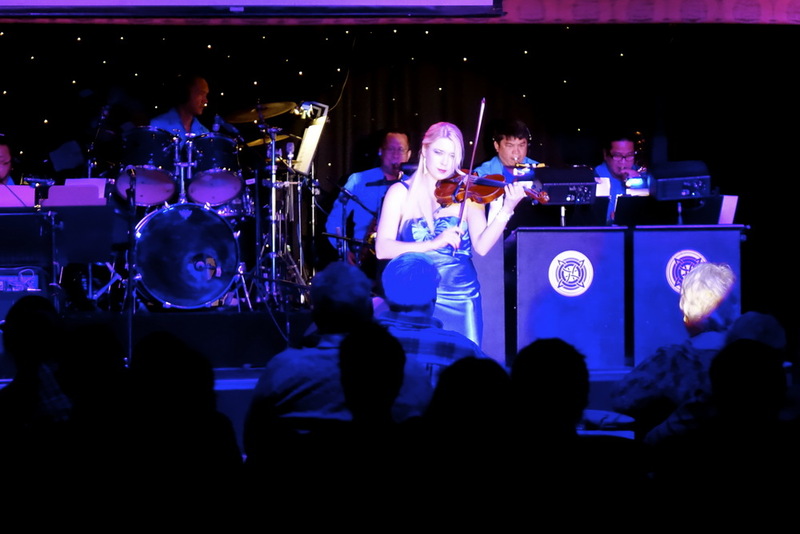 Definitely make sure family and friends are thoroughly entertained—with accentuating classic background melodies or invigorating modern flair. 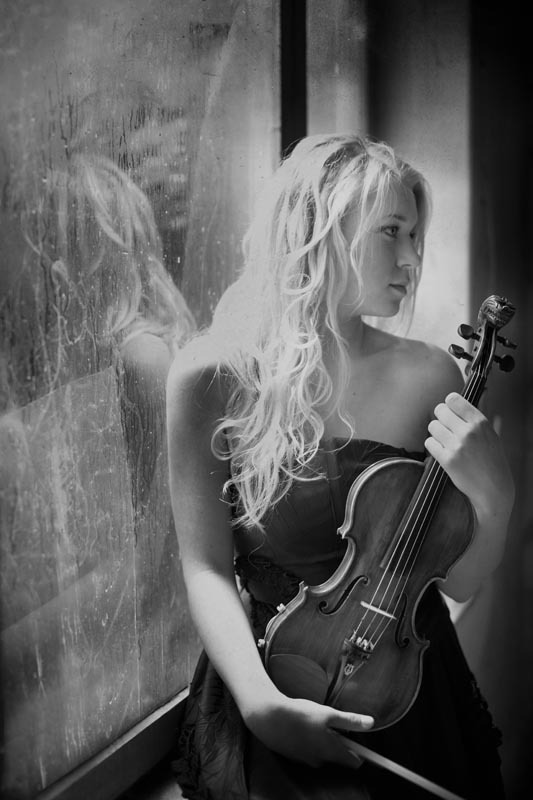 Sometimes music can communicate what is difficult to put into words. 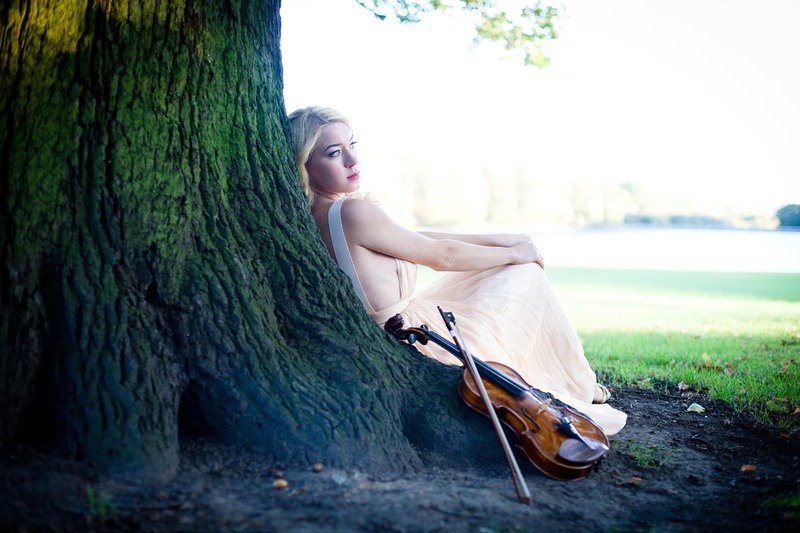 Kate’s music can poignantly commemorate the life of a loved one at Funerals. 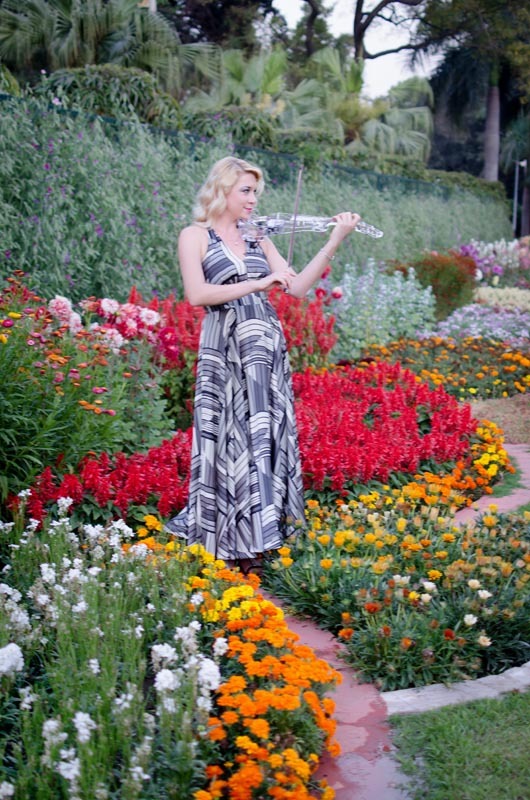 Of course, Kate is always open to play within your desired arrangements. 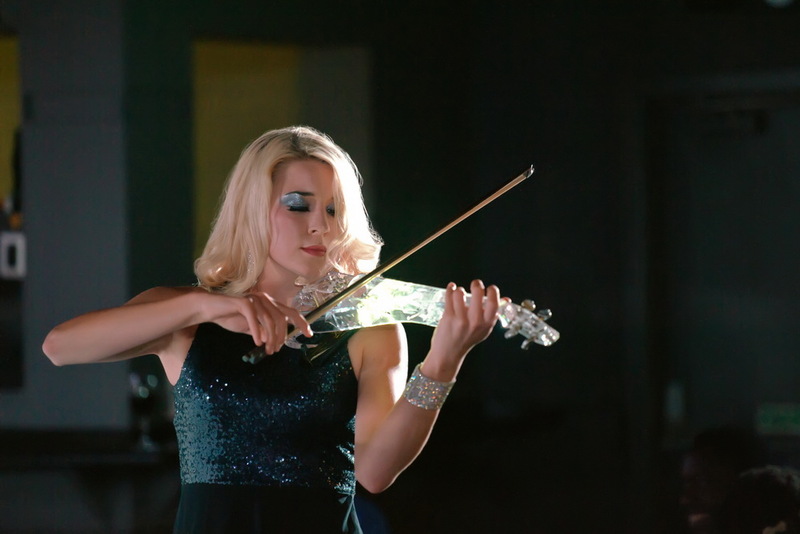 She can play prior to or during a service, or afterwards at a reception. 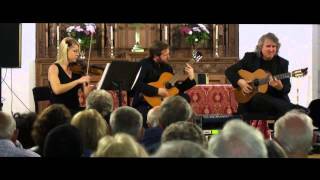 Selection of classical or popular pieces for approximately 30 minutes as friends and family arrive. 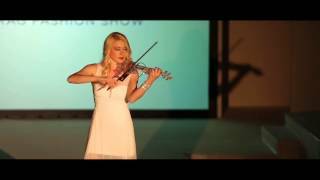 Violin Performance of a special song or musical arrangement during the service. 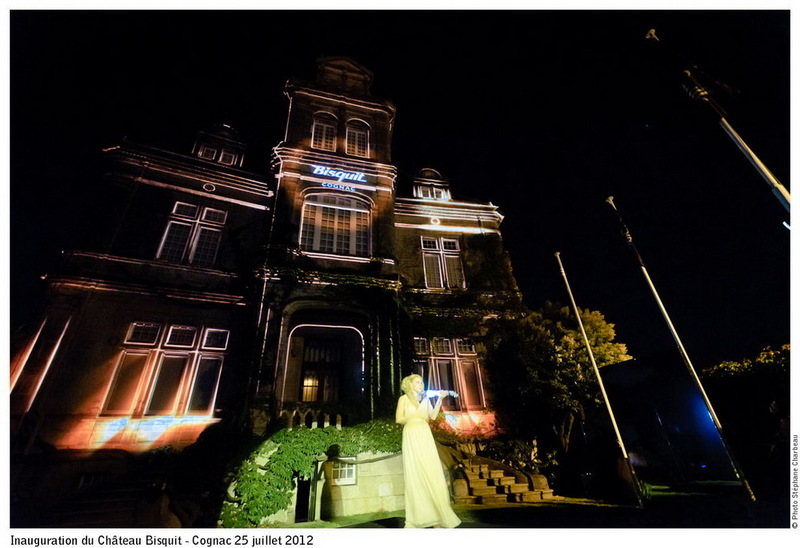 Approximately twenty minutes of classical or popular pieces as friends & family leave the church or crematorium. 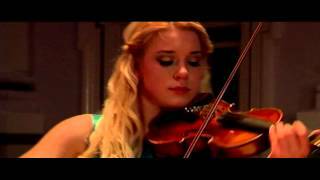 Sixty minutes of violin performance during a drinks/buffet reception (or 2 x 45 minutes). 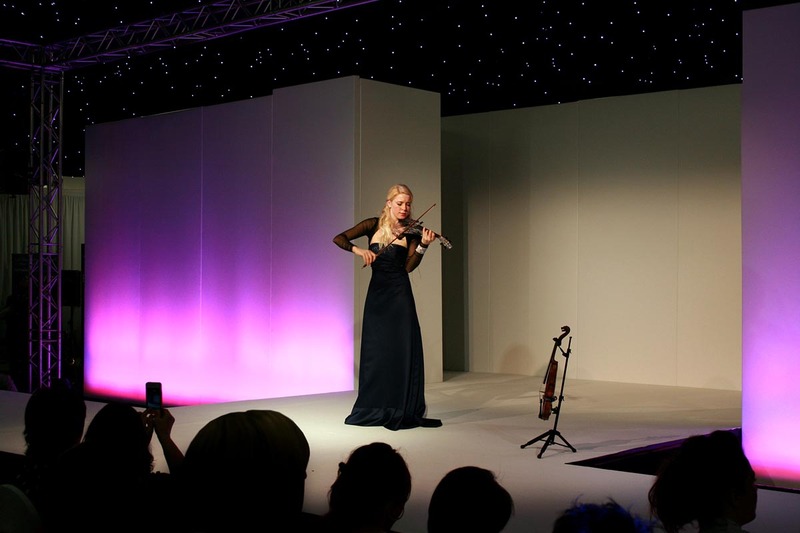 Kate has performed her electric violin show at a number of high profile Awards Ceremonies for both local and international organisations—including commemorations for Firefighters and Police Officers, as well as companies in the Motorsports, Fashion and Banking industries. 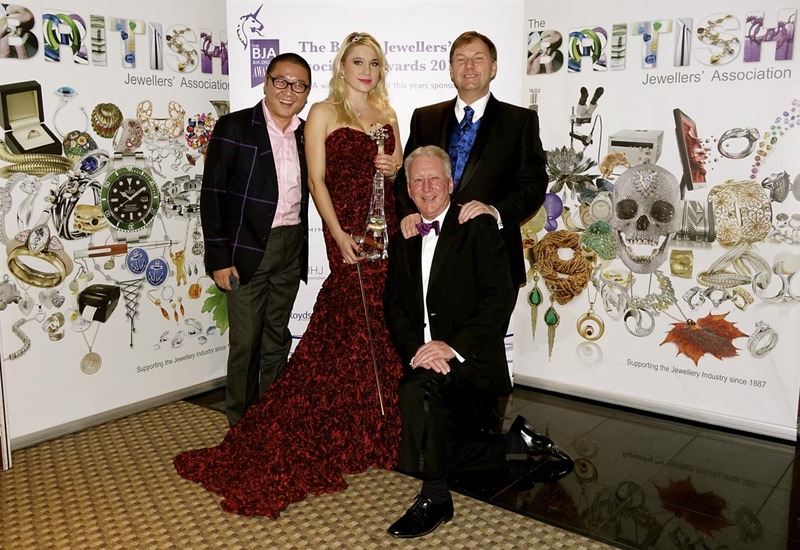 She was a star at The European Watch of the Year Awards at Mayfair Hotel, London and The Northern Design Awards Ceremony in Manchester. 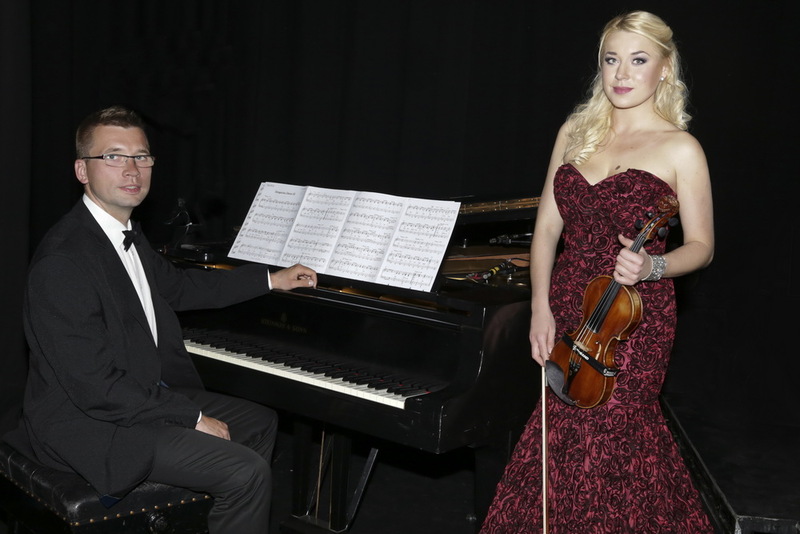 Her playing can set a prestigious tone for the evening so that each award seems more of an honour. 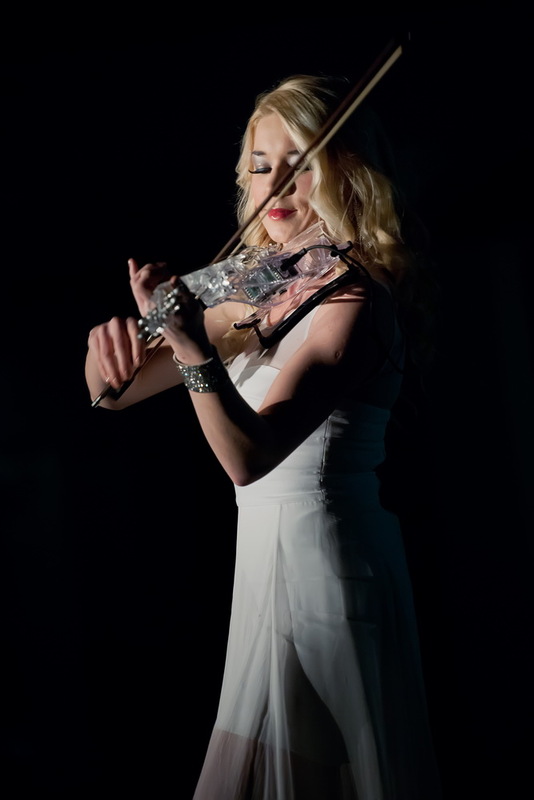 Kate can strike dramatic chords to signify the recipient of each award, and provide poignant background music throughout the evening. 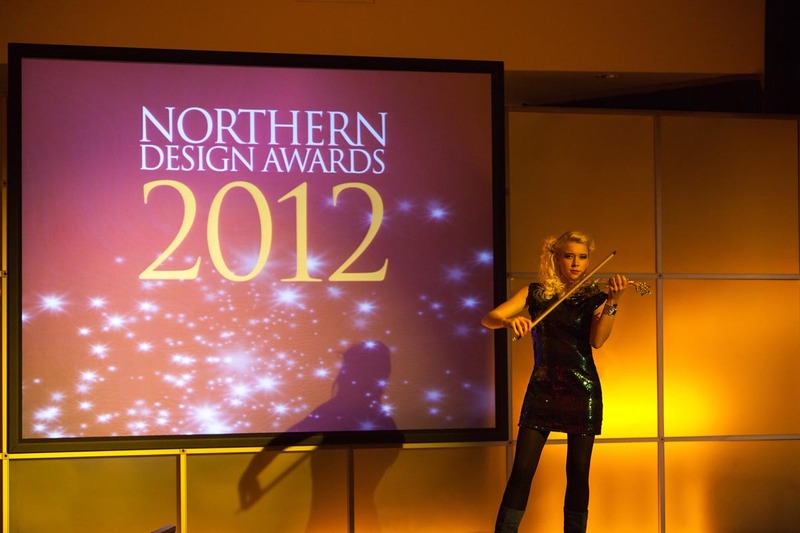 Another popular option: Kate can perform before the awards begin, to help everyone relax and build anticipation. 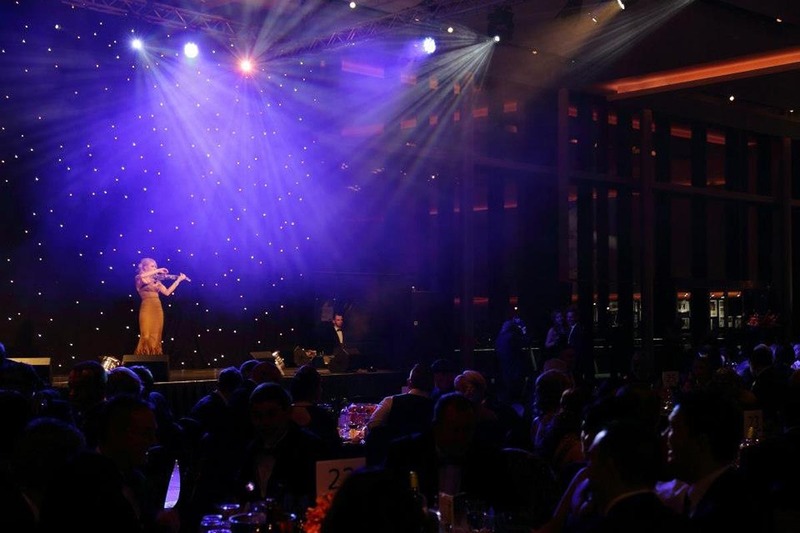 Heart-warming violin sounds are perfect to celebrate raising support for noble causes at Charity Balls. 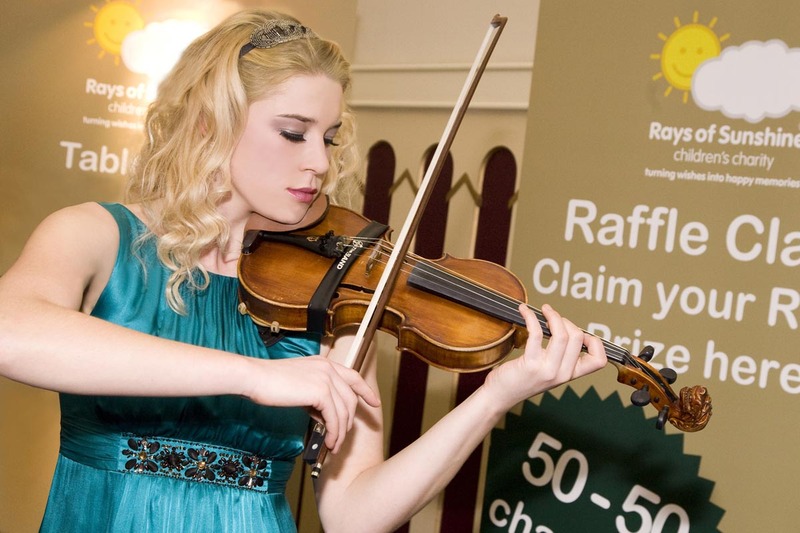 Kate plays regularly at events for her chosen children’s charity, Rays of Sunshine and local and international fund-raising events for causes like Cancer Research. 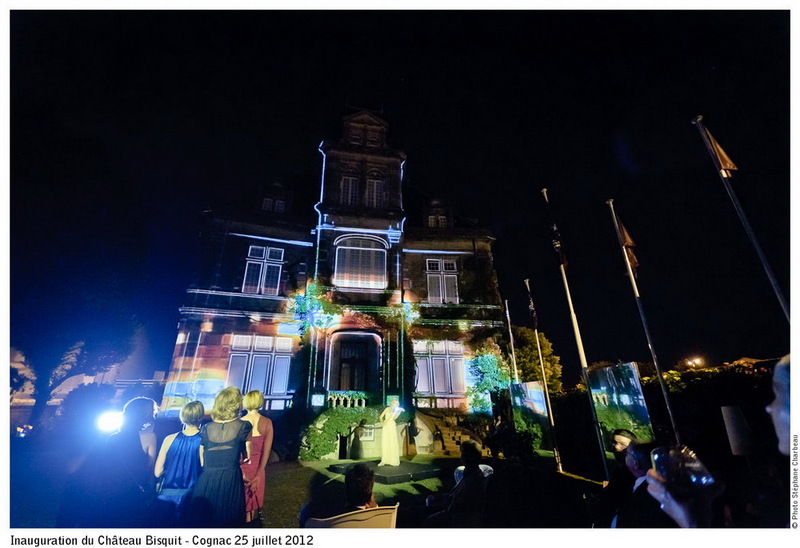 Not only does Kate generate rich notes on her own, she often performs marvellously with other up-lifting artists, such as during the ball, “Once Upon a Smile” (Point Lancashire County Cricket Club, Manchester), alongside the Pop singer, Lemar, and the band Mend. 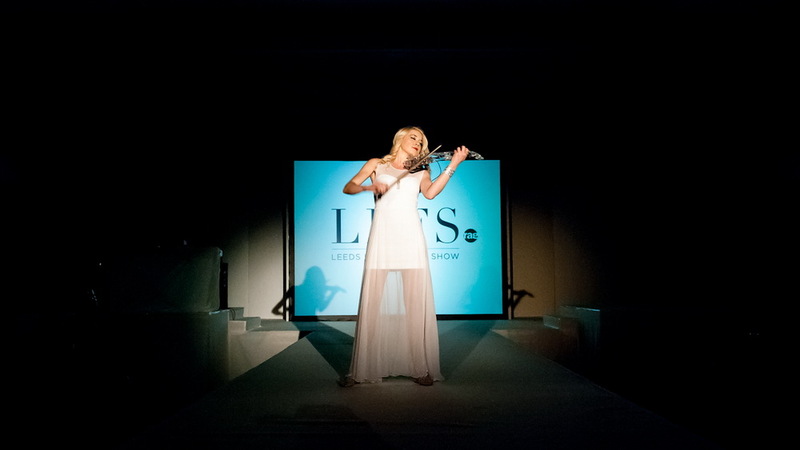 Kate’s repertoire of violin performances are so uplifting, they naturally enhance Product Launches. 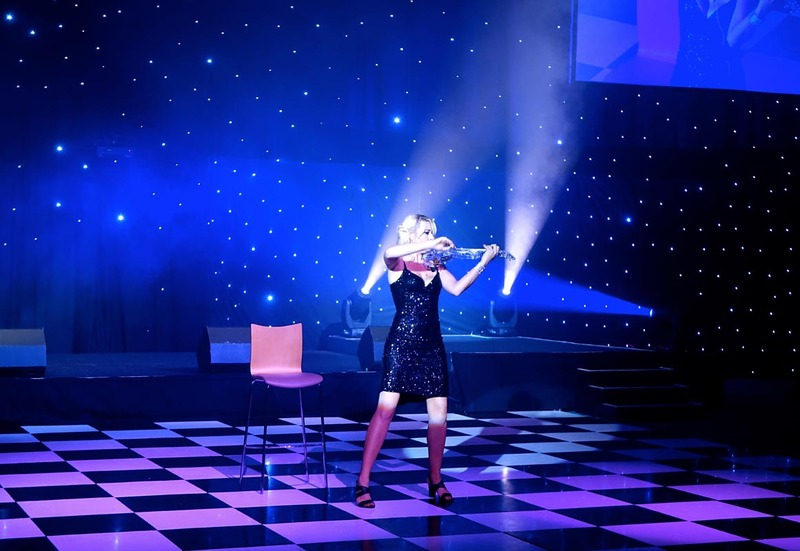 Kate has provided amazing performances for a number of high-profile national and international product unveilings in the UK and across Europe. 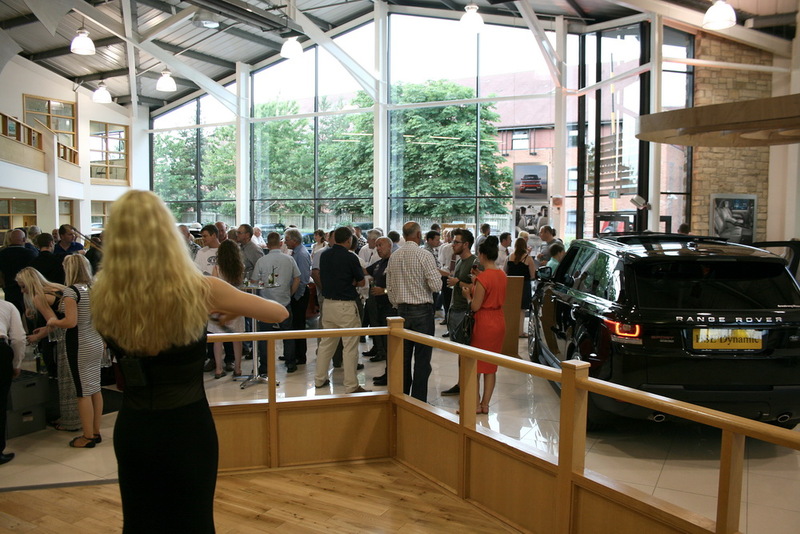 After so much market research and planning, every new product deserves a resounding inauguration. 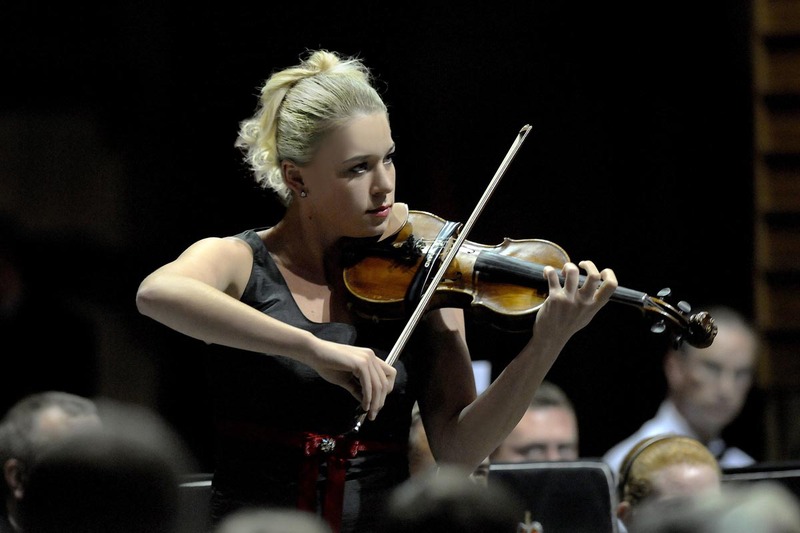 Kate’s violin solo can build excitement better than a drum roll. 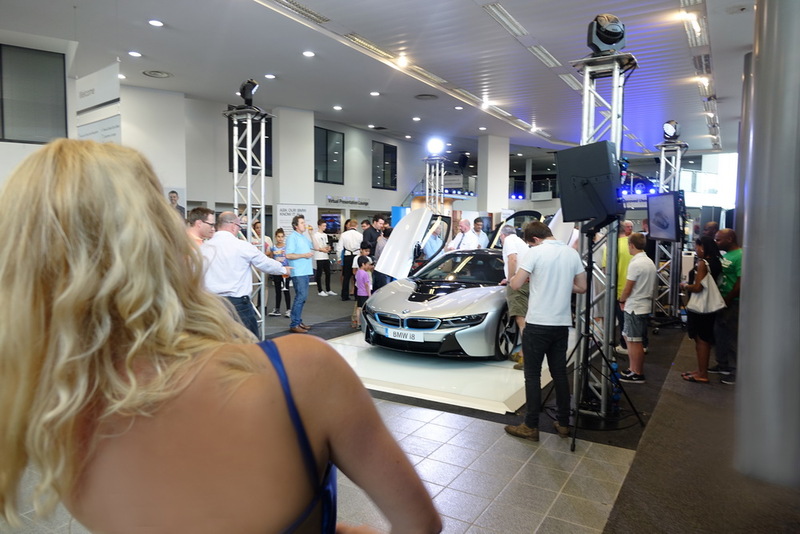 Her theatricality blends well with any special effects drawing full attention to the marketing team’s innovation. 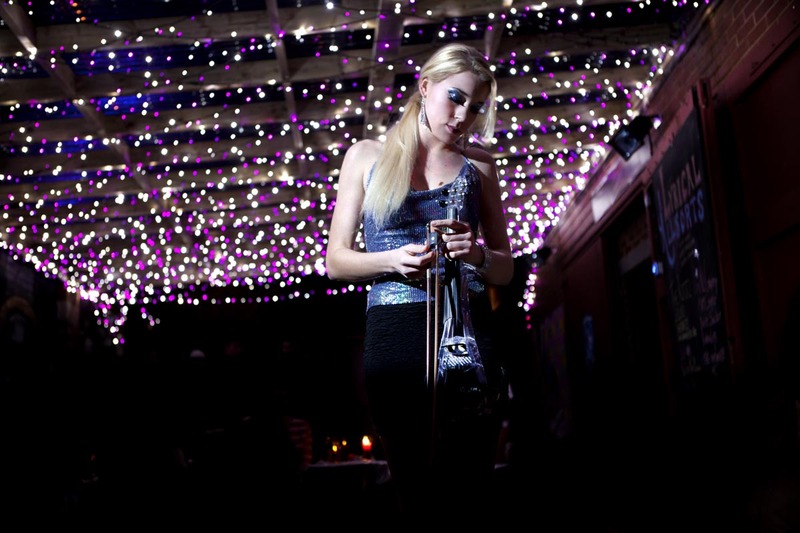 Kate can be booked to upscale the entertainment at clubs. 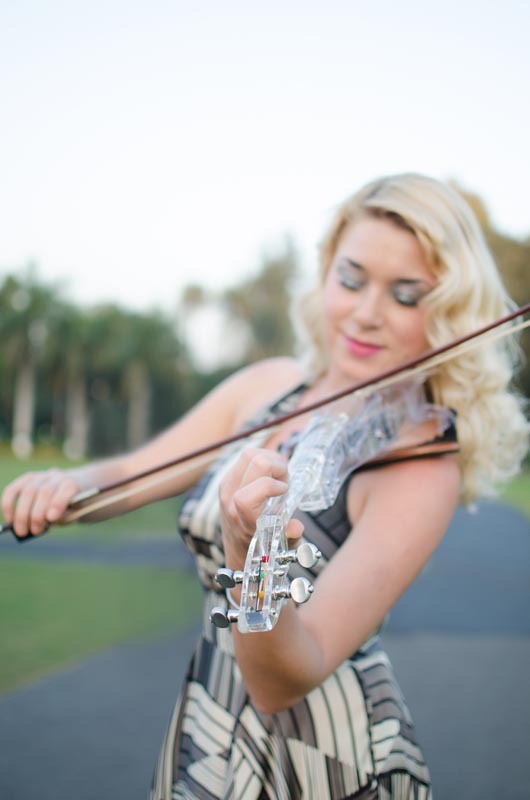 Her lively strings blend well with the beats of a band or a DJ to get crowds grooving. 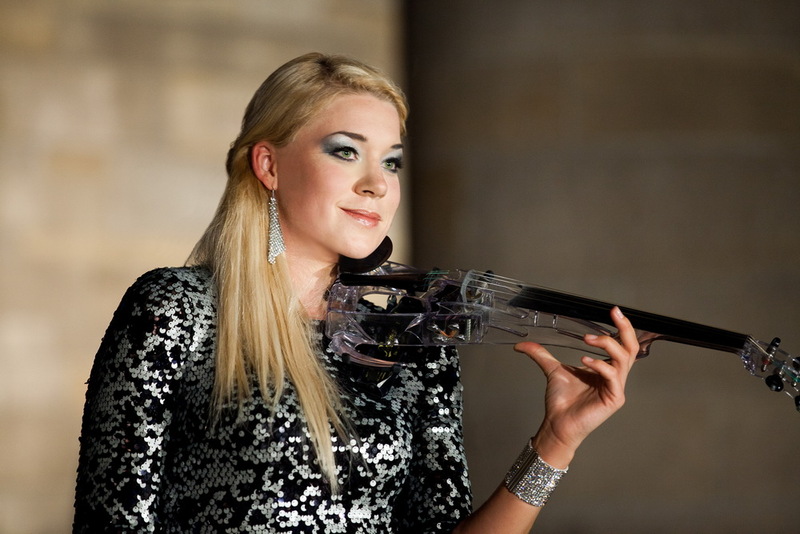 She is always dressed for the occasion—her gown sparkling in sync with her futuristic-looking, clear electric violin. Kate is accustomed to playing with DJ’s like world-famous Mike Freear. If you’re looking for a DJ, Kate can help you out with a recommendation. 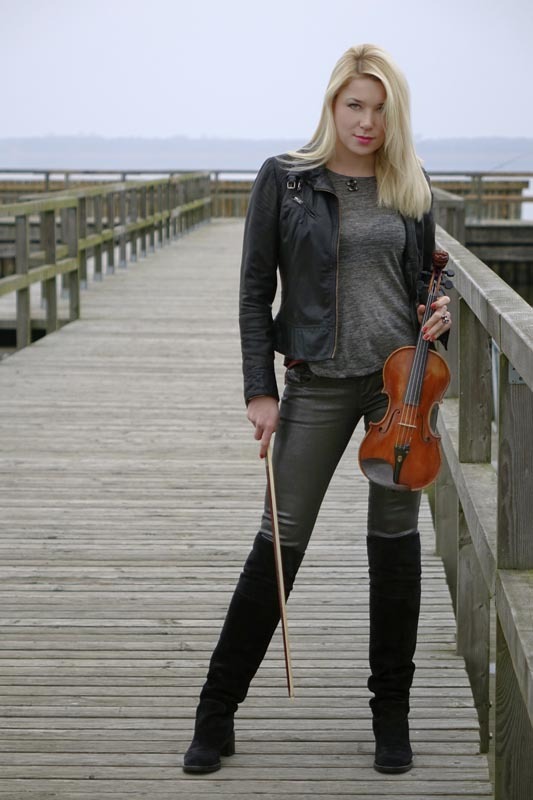 Kate’s repertoire is vast, so you have scores of music to choose from—she covers classic favourites and fast-paced modern pop, and can certainly accentuate the instrumentation of any band. 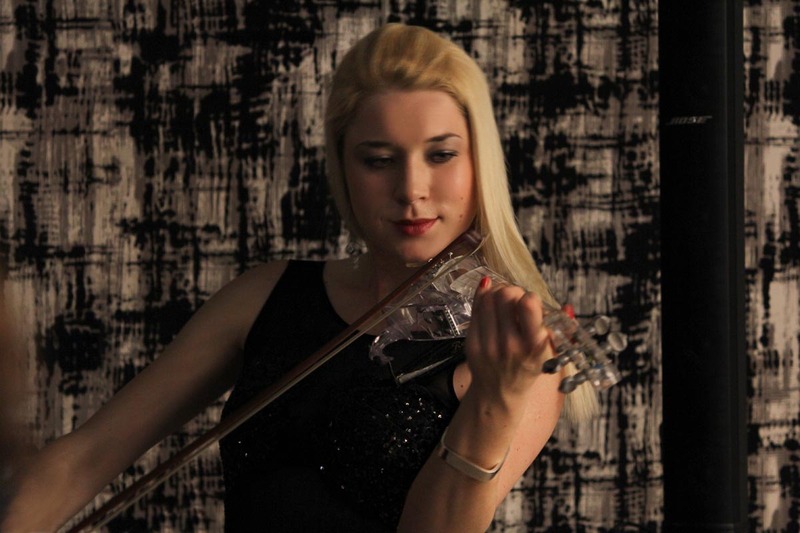 Kate’s violin music also blends well with stunning models and chic clothes. 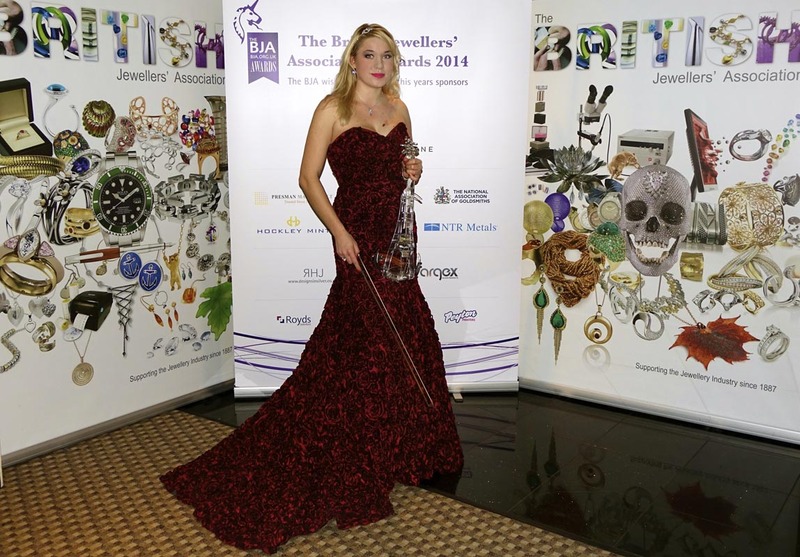 Kate has often been a catalyst invigorating the catwalk at important Fashion Shows. 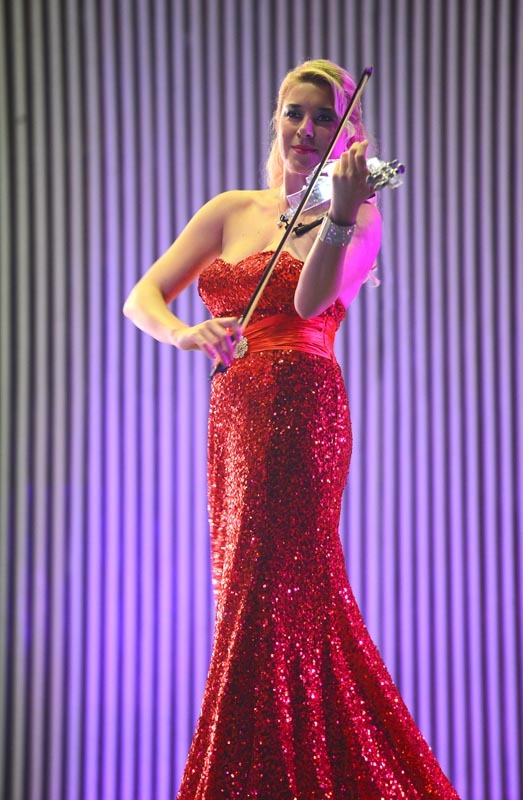 Of course, she will dress for the part: in a glamorous gown, swaying with a jewel-like sparkling violin. 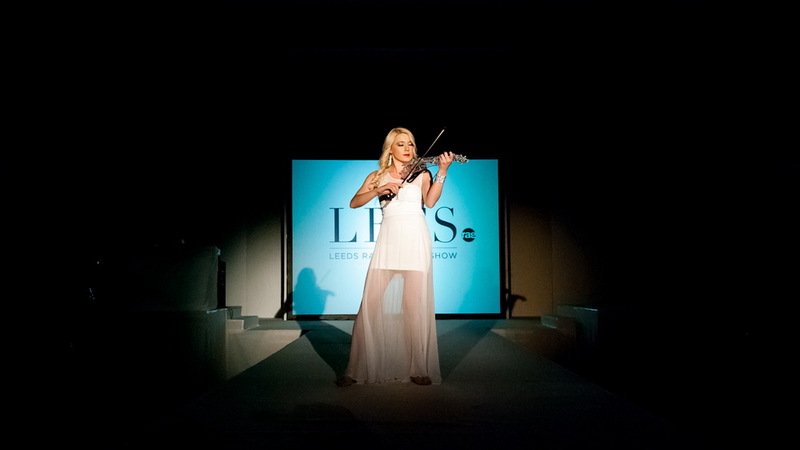 Her music can spark mingling before the show and make for dramatic entrances for each new design during the show. Kate can play a selection of songs to match each emerging style of clothes, whether it’s light-hearted leisurewear or the most lavish ensembles. 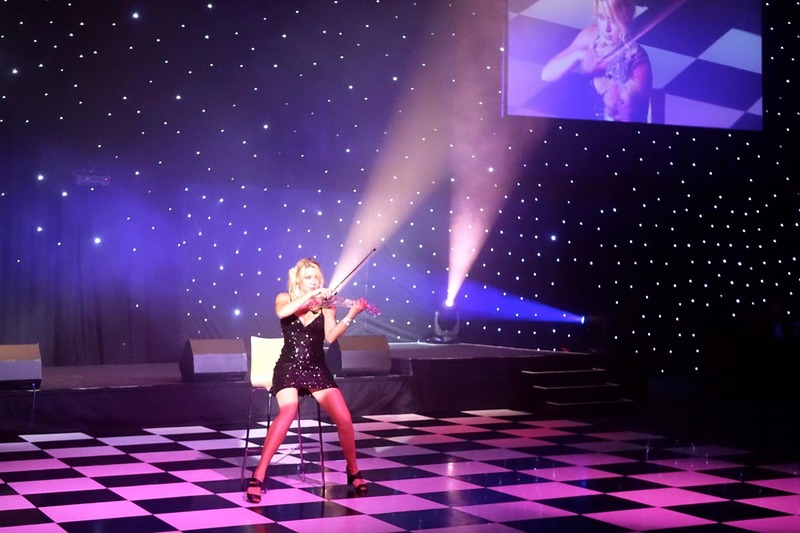 Kate is so versatile with her violins that she is sought after for various Corporate Parties. 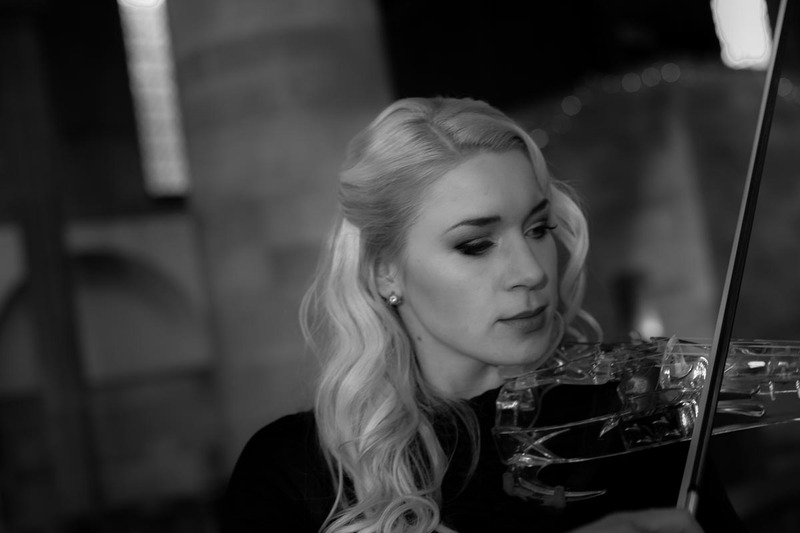 Corporations like IBM and House of Fraser value Kate because her music is conducive to team building: beauty has a way of bringing people together. 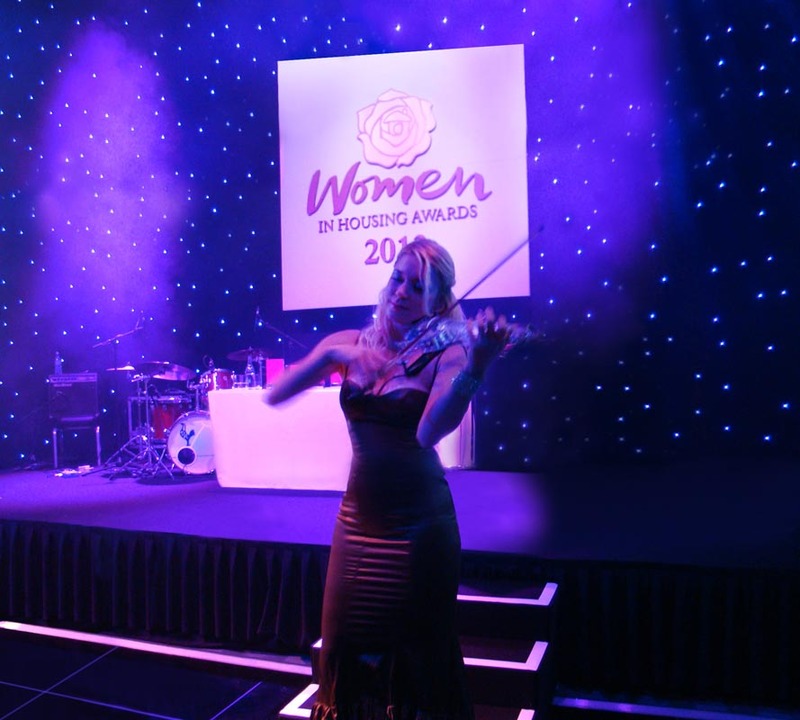 Whether she is playing subtly in the background at drinks receptions or shining on centre stage, the vibrations of her violin are not just good—but rather, gorgeous. 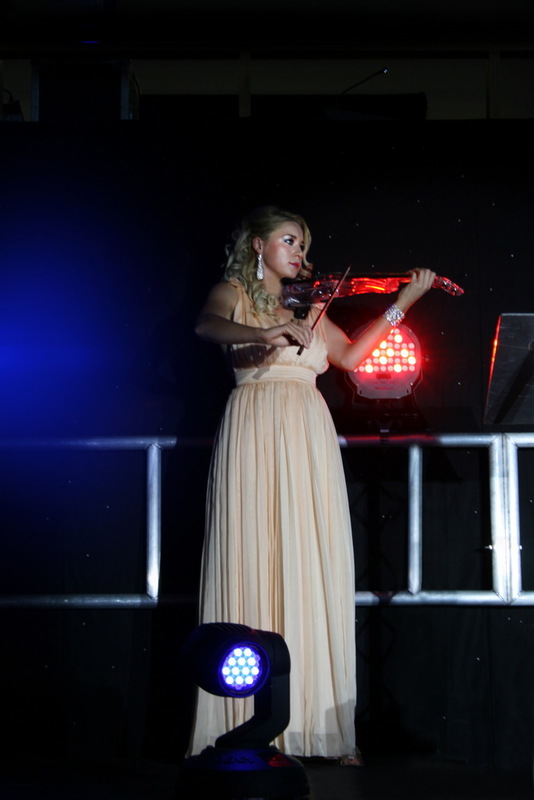 Once Upon A Smile - Charity Ball, The Point at Lancashire County Cricket Club, Manchester. Performance with pop singer Lemar and boyband The Mend. 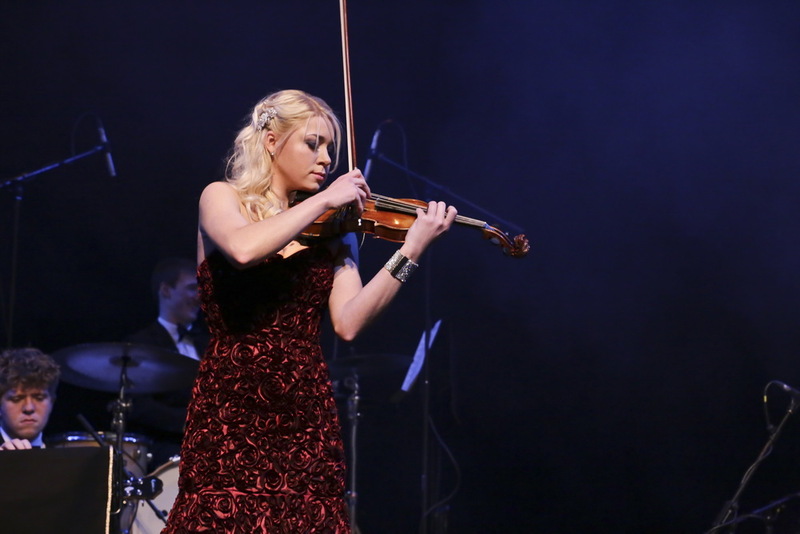 When you watch Kate performing live for the first time, it immediately becomes apparent how vast is her talent for playing the violin. If you’re lucky enough to see her on stage again, you may be surprised to witness a completely different spectacle—suddenly she’s regenerated her genre from dramatic classical to dance contemporary. A third show could be yet another thing altogether! 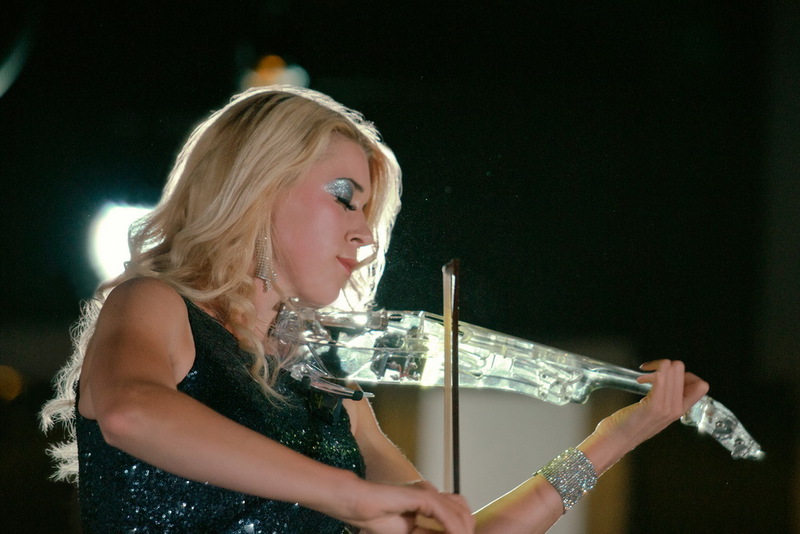 Kate is truly a multi-dimensional artist who can adapt her performances from Classical to Popular (or fuse the two together) and can perform live or in Session—solo or collaborating with other musicians: most frequently as a duo called Electrify. 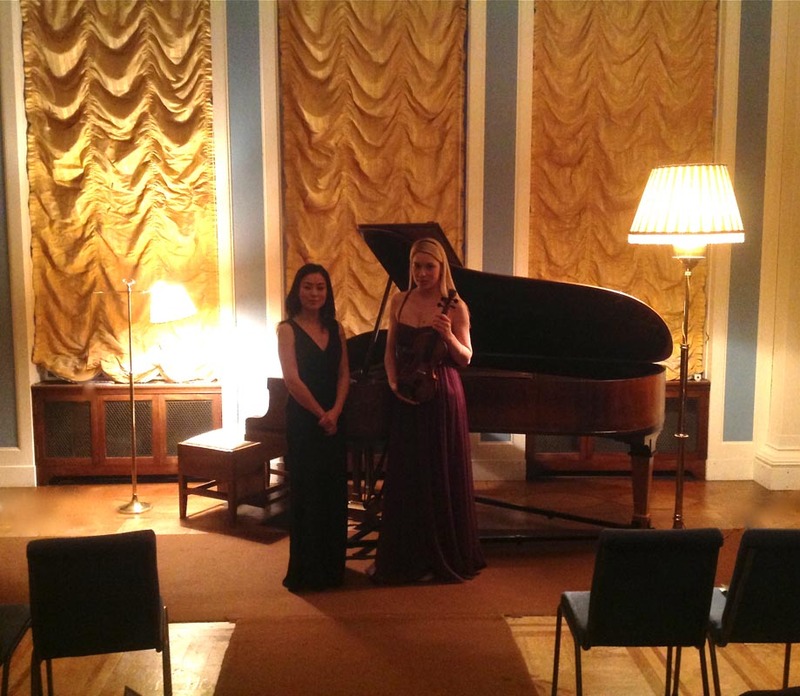 Thank you for the wonderful concert you gave at Sledmere House last weekend, you were excellent. 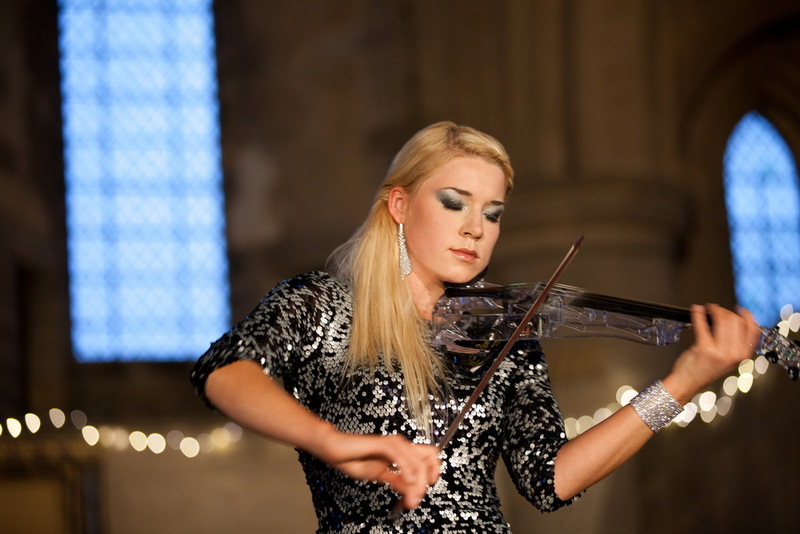 Somebody who came to the concert told me yesterday that you were the best musician they had heard at Sledmere! We have heard nothing but praise for your playing! 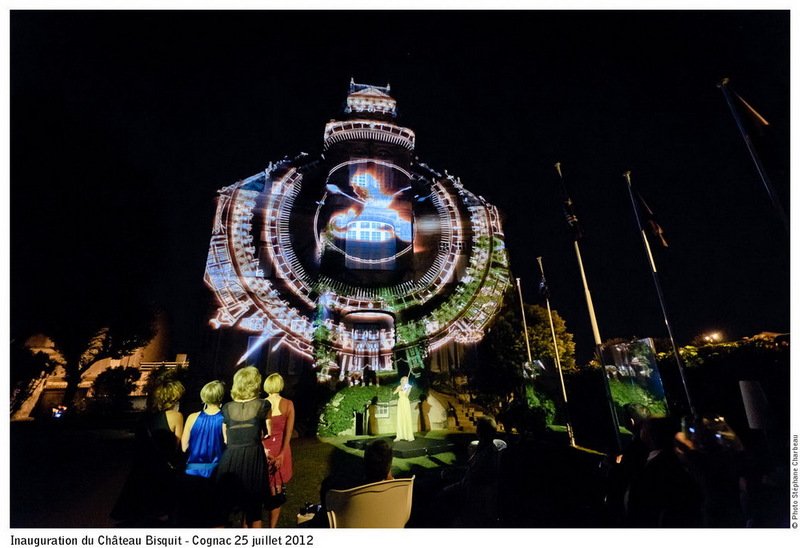 Thank you again for giving us all the most enjoyable evening. 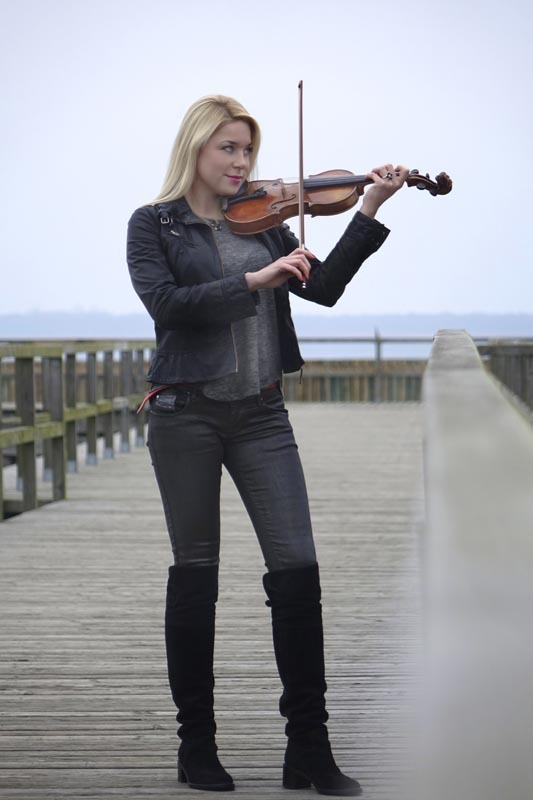 Kate’s technical know-how has been honed through extensive years of training with highly-respected virtuosos of the violin. 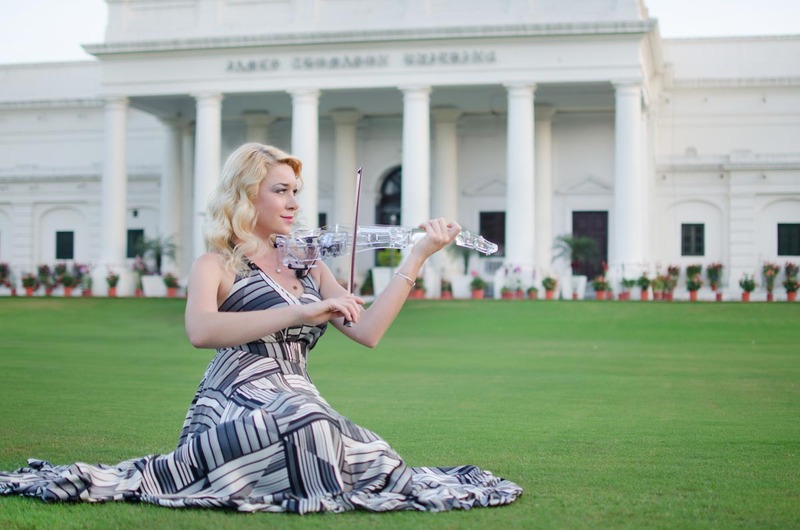 She has committed numerous Classical movements to memory and performed them on her popular studio albums and in front of awe-inspired audiences around the world. 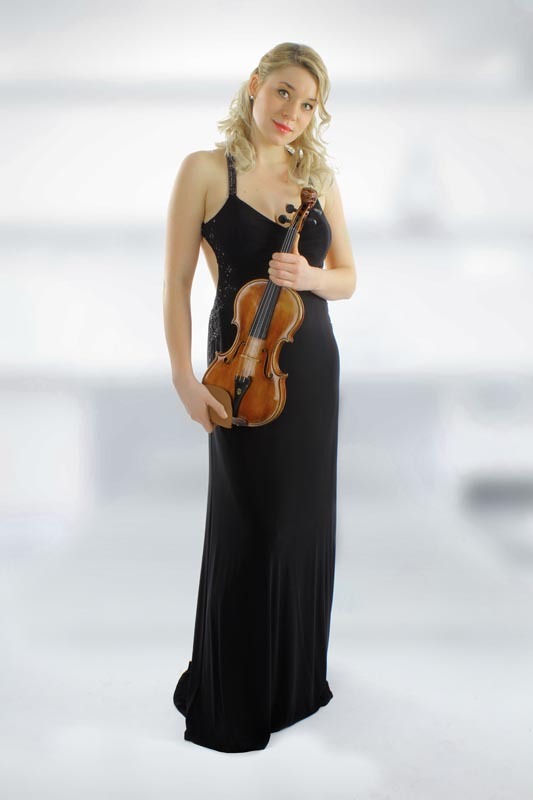 She is constantly adding beautiful new concertos and beguiling arrangements to her repertoire, which includes Bach, Beethoven, Schubert, Handel and all the masters. 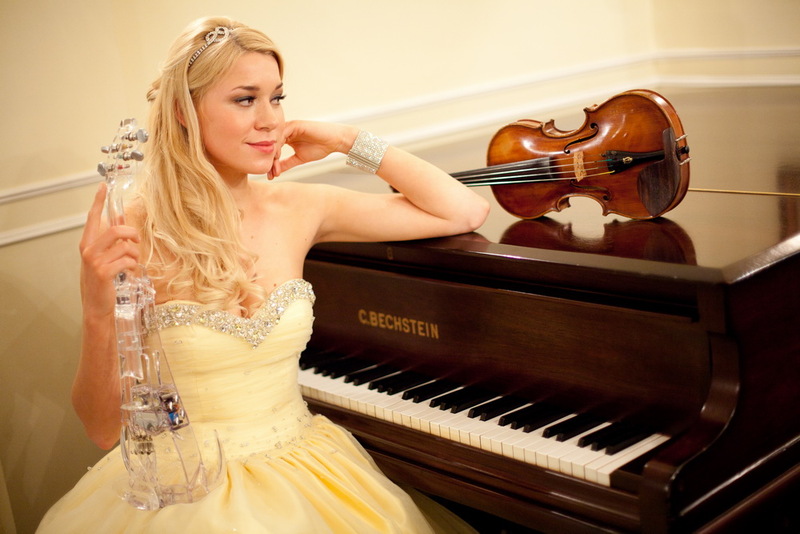 She will also dedicate herself to perfecting whatever request you have for your recital or event. 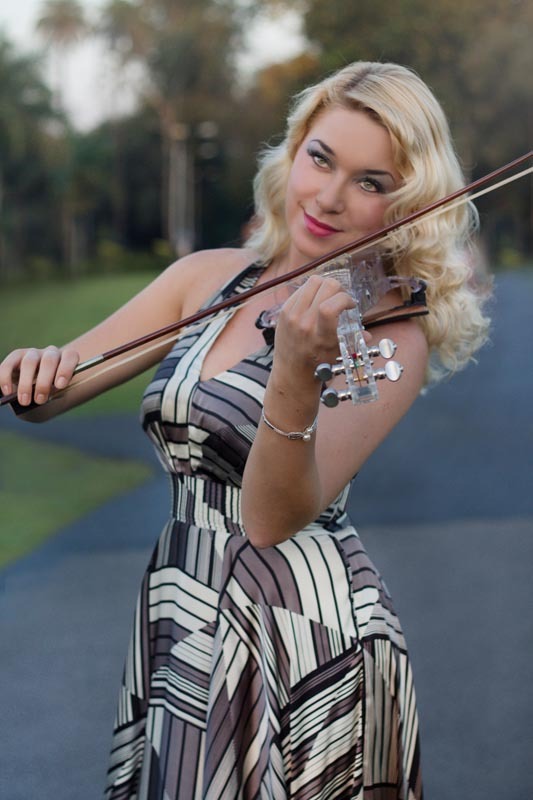 Kate can provide and perform alongside a live pianist if required, or can provide studio pre-recorded piano accompaniments. 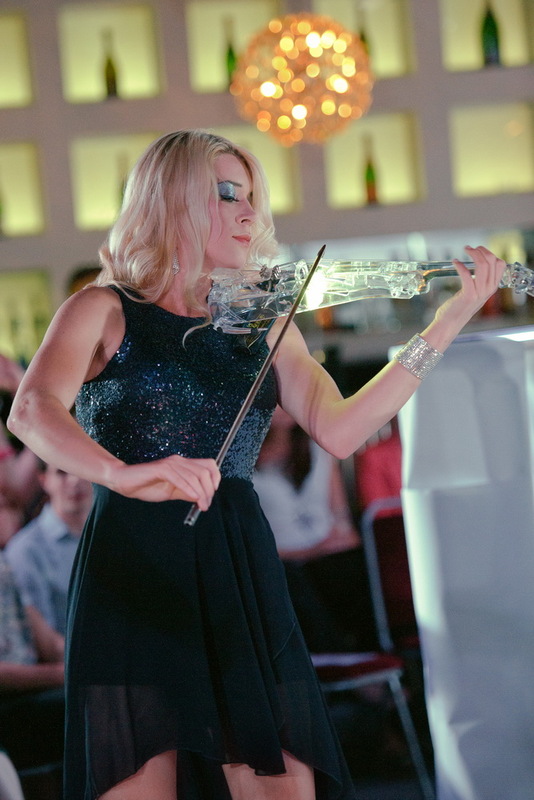 Electrify, Kate teams with another classically trained violinist. 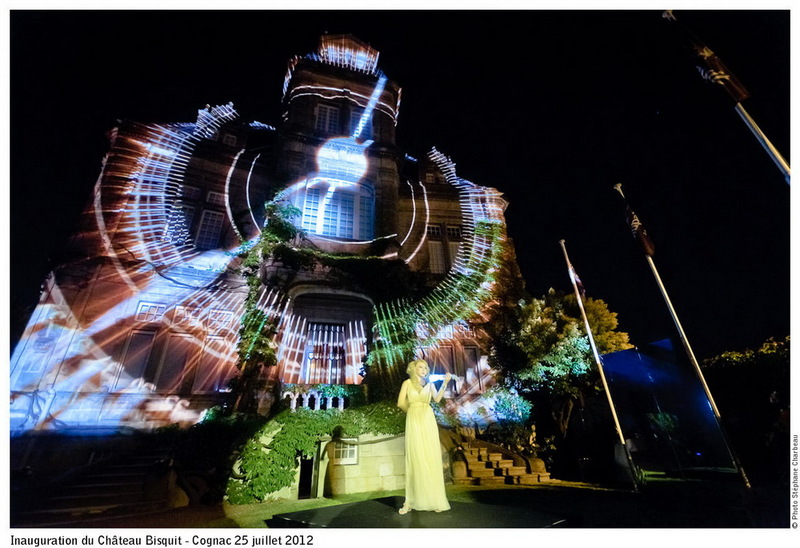 They’ve created an act which is a whirlwind of style and innovation. You need to be there to believe it. Scintillating, synchronised choreography. Glamorous, glittering costumes. 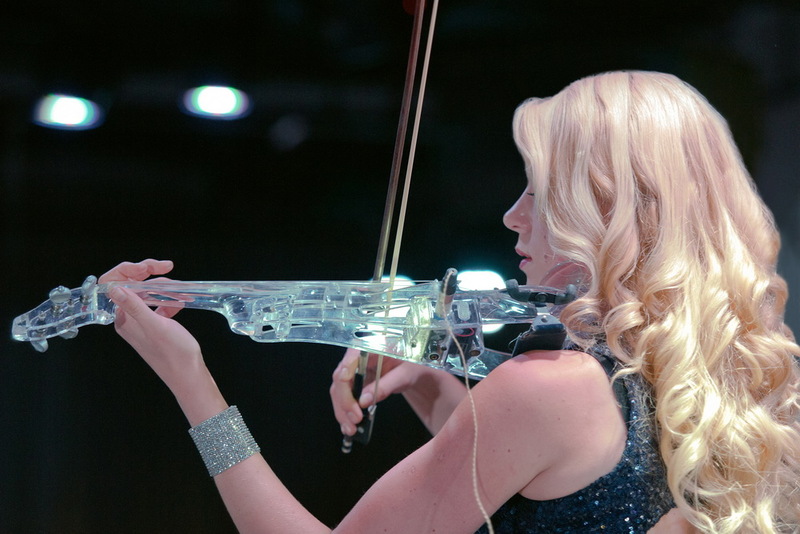 And divine sounds ascending from transparent electric violins. 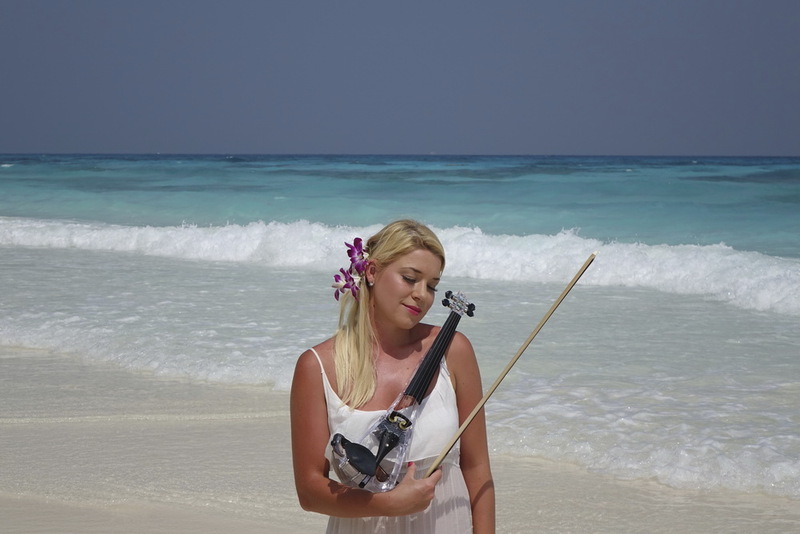 From crossover classical and epic rock to hot Latino and pop hits. 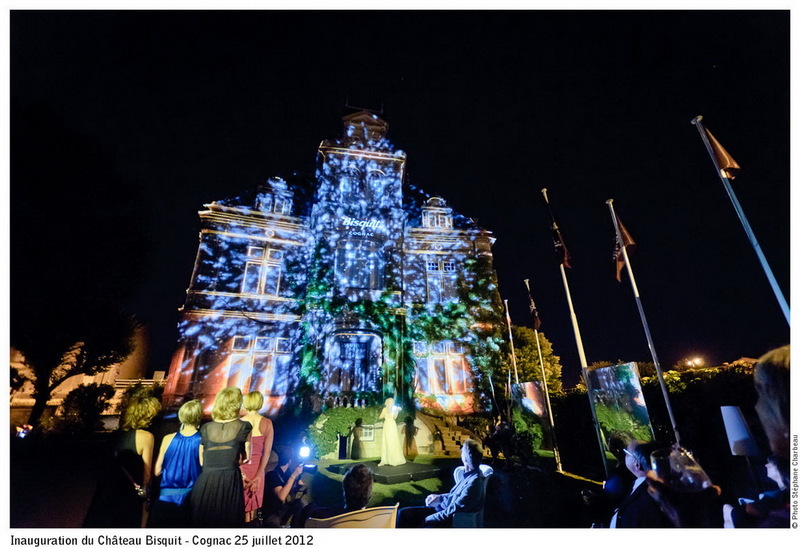 Whether it’s an intimate gathering or more elaborate affair, Electrify are used to customising their performance to specific venues and audiences. 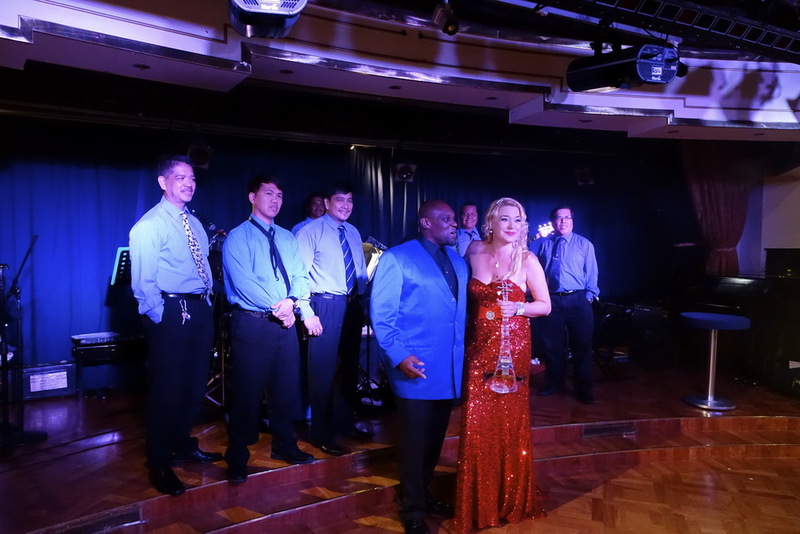 They come equipped with their state of the art sound system, can play songs you want to hear, and will interact with the audience by moving with their wireless transmitters. 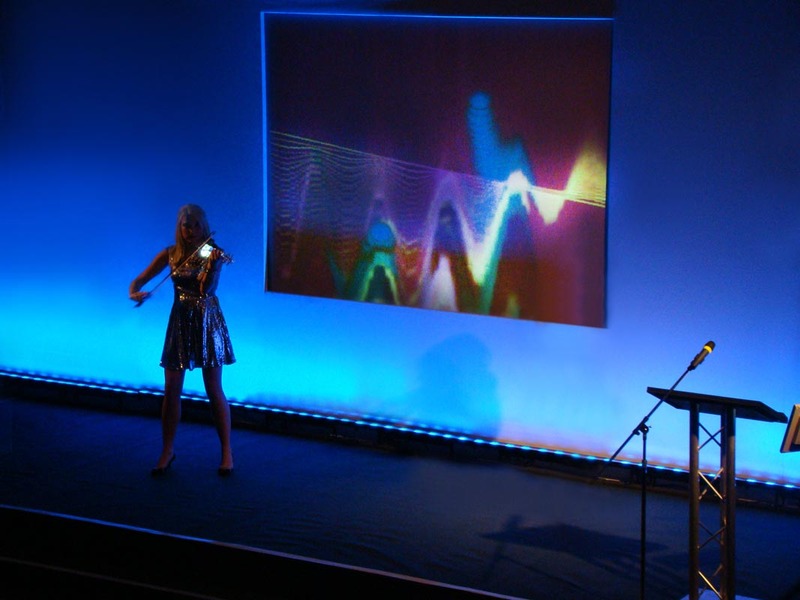 The vivacious duo can be booked to electrify any function from wedding receptions to corporate events to fashion and award shows. Kate clearly has the ability to weave together various types of music. 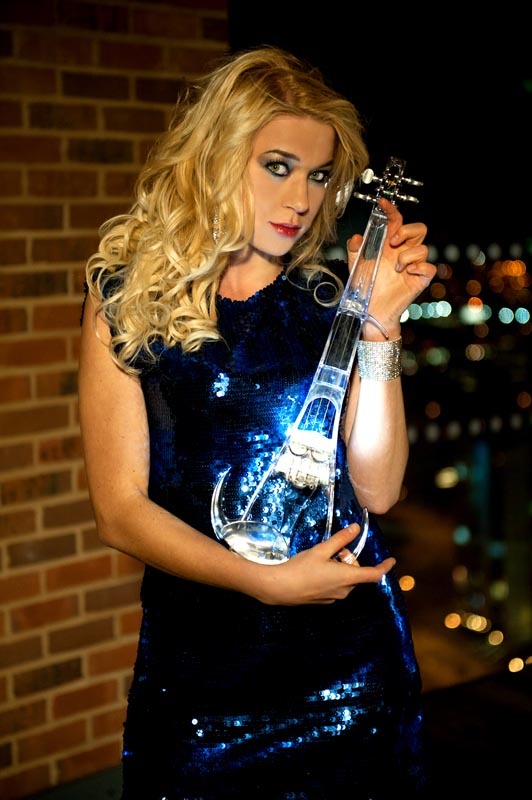 On her custom-made Ted Brewer electric violin she is a smash with Popular songs. Choose from timeless favourites (Sinatra, Streisand and Sting) to recent chart hits (Oasis, Elbow, Lily Allen) to anything and everything, including famous tunes from film, TV and musicals. 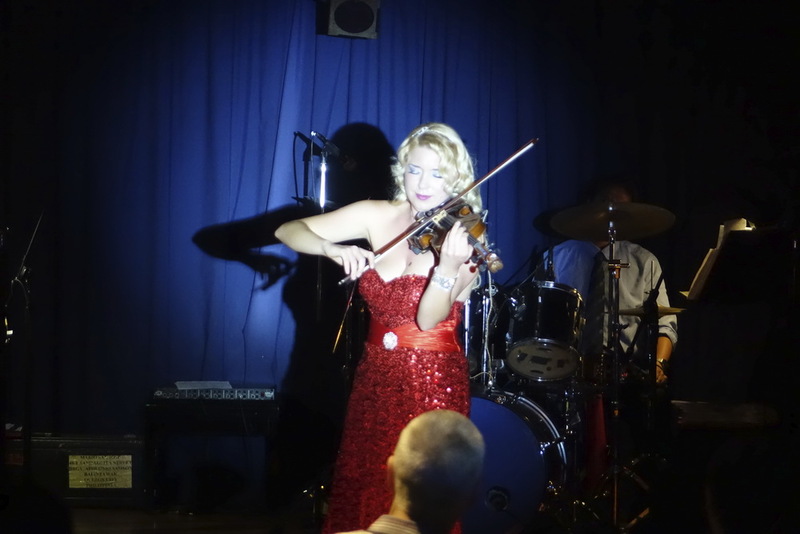 She has electrified audiences at major corporate events in prestigious venues and even delighted celebrities and their party guests with songs they instantly recognize—and sometimes can’t help but dance to (or at least hum along with!). 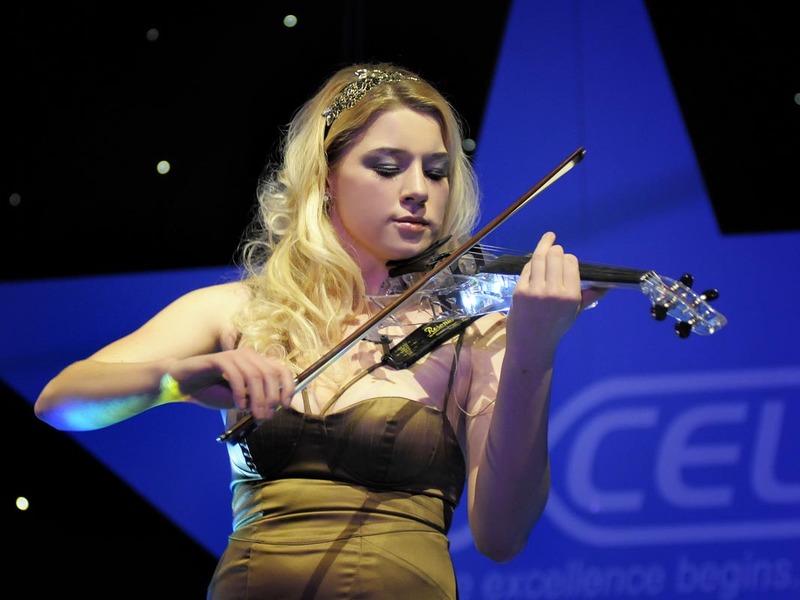 Kate blends well with backing musicians or can supply studio pre-recorded backing tracks to liven up any function. 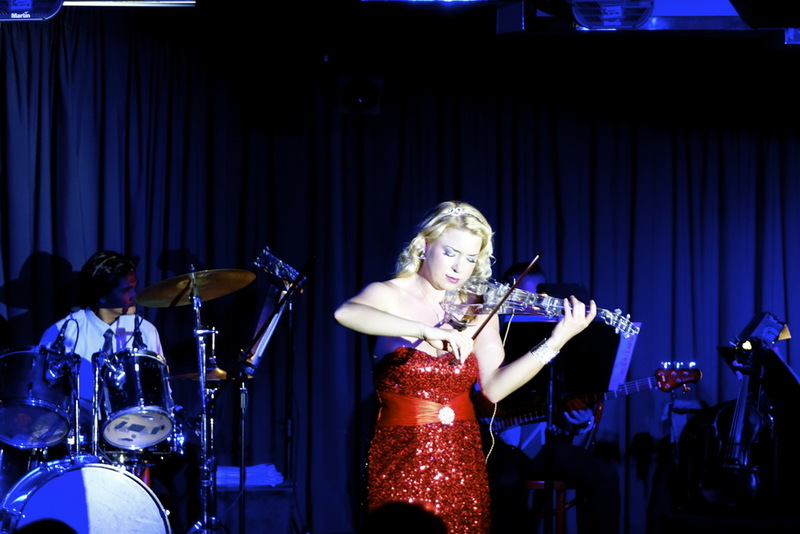 In addition to performing the songs of classical and popular artists, Kate has become a Session recording artist, herself. 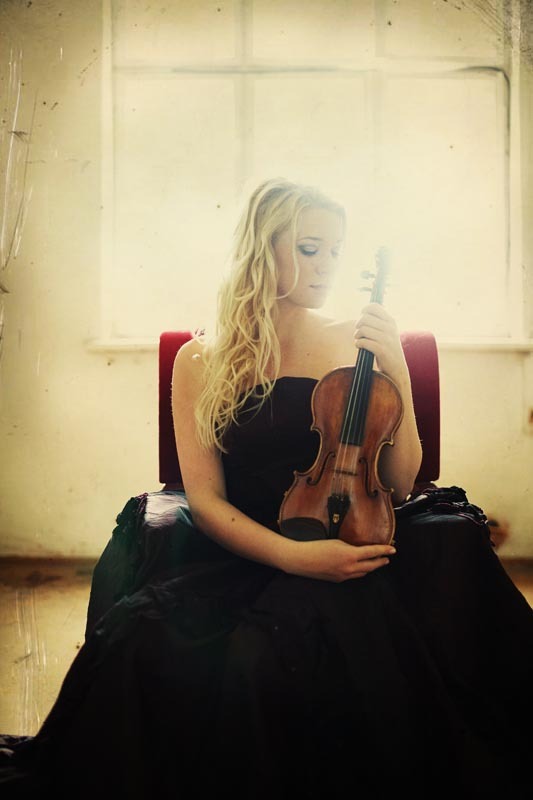 Kate feels completely at home in the studio, capturing the music that is her passion. She has already recorded and released two studio albums. 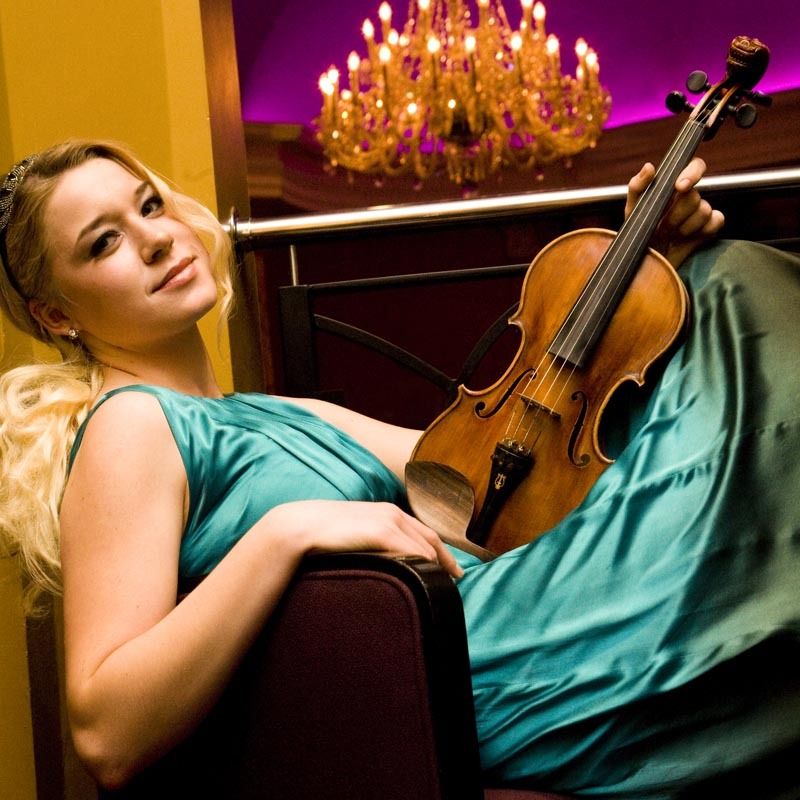 Her debut record “The Violinist” (2009) sold over 5,000 copies worldwide. 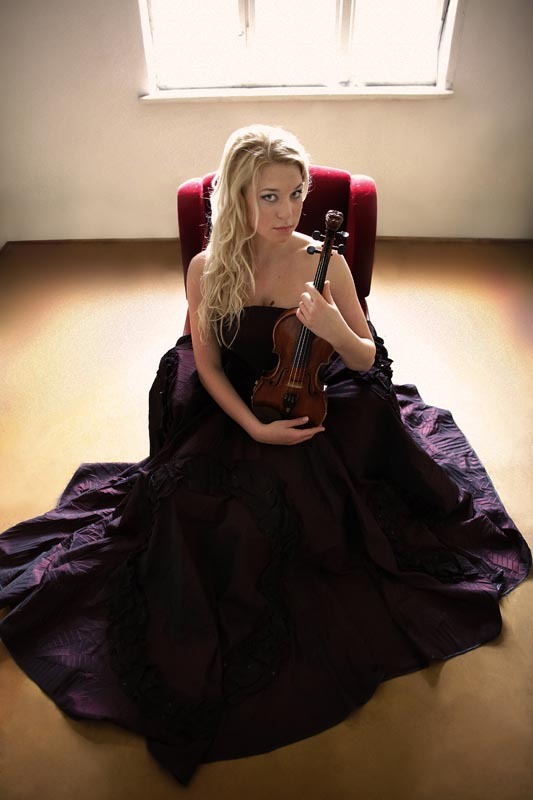 Her second album, “My Classical Interpretations” (2012), (featuring the piano accompaniments of Daniel Holden) sold over 2,000 hard copies and downloads, and includes tracks that have been broadcast on the BBC and used for programmes on ITV. Of course, a third hit record is anxiously anticipated in the near future! 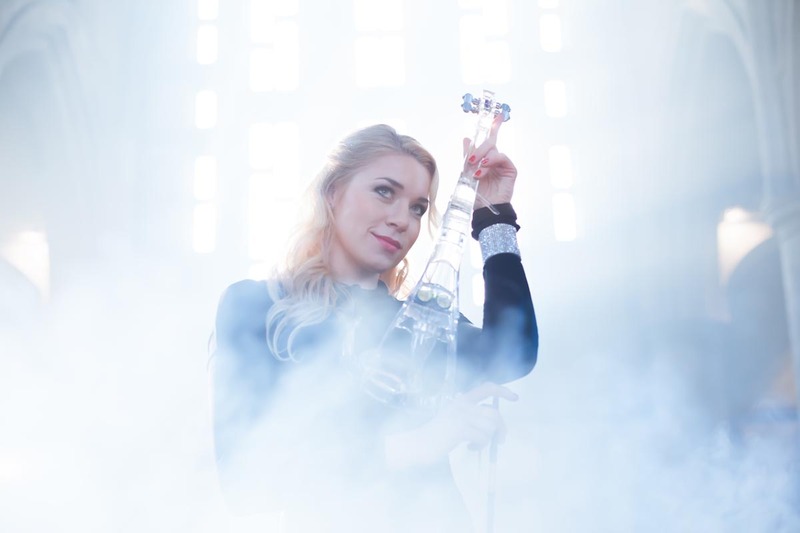 Because Kate is so versatile, she is often sought by organizations to record background music for commercials or corporate events, and by bands and other artists for fascinating cross-genre collaborations. 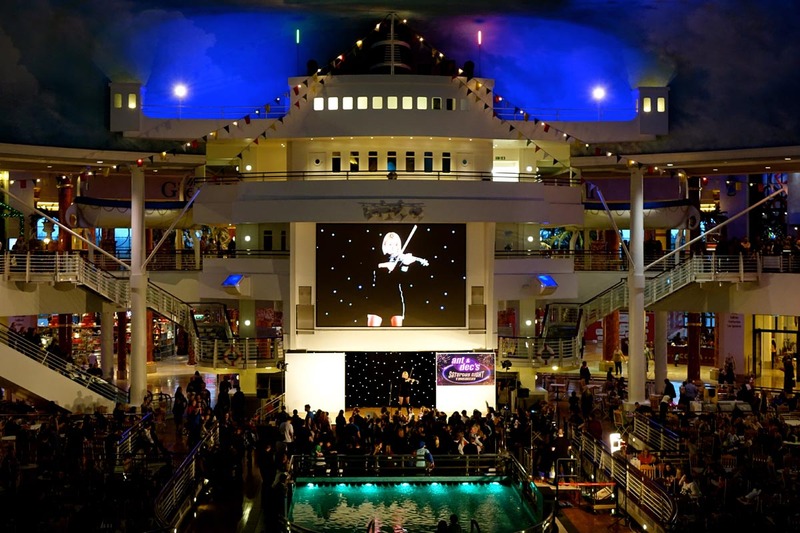 "The best act we have ever booked!" Kate belongs on a stage. Any stage. No matter where, it is there she can truly shine. 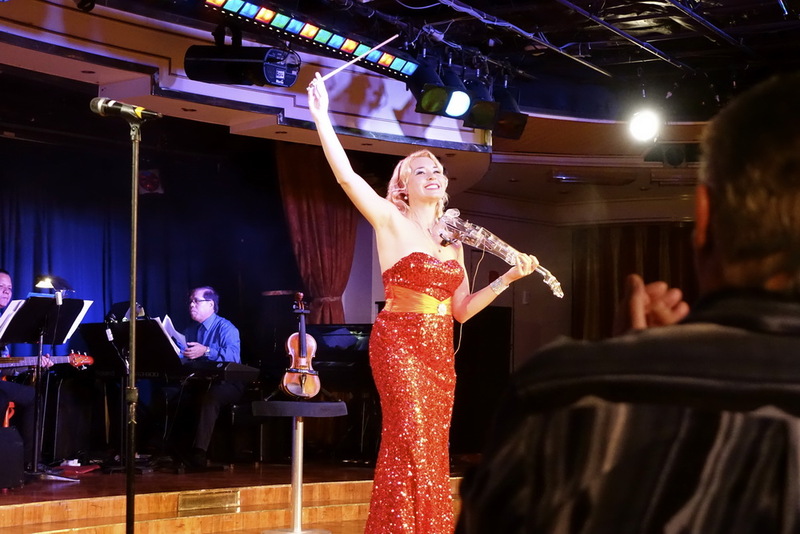 Her platform to perform can be a theatre, concert hall or better yet, aboard a cruise ship. 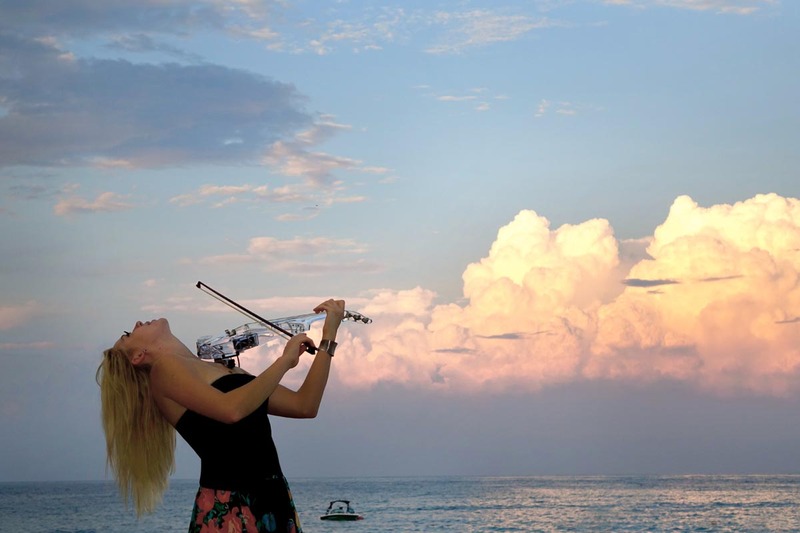 Wherever she is, her artistry with the violin creates an extravaganza of entertainment. 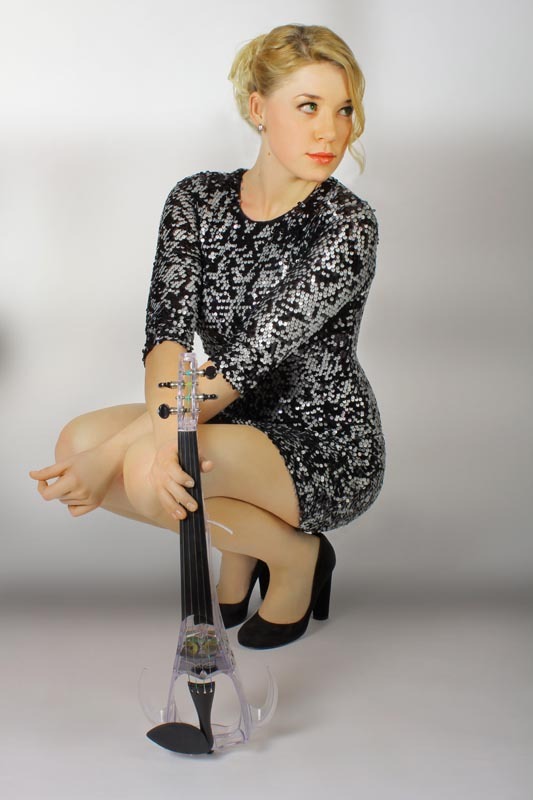 Not only is she excellent technically, she confidently performs in a cabaret style—craftily interchanging between the electric and classical violin, cordially interacting with her audience between magical melodies. 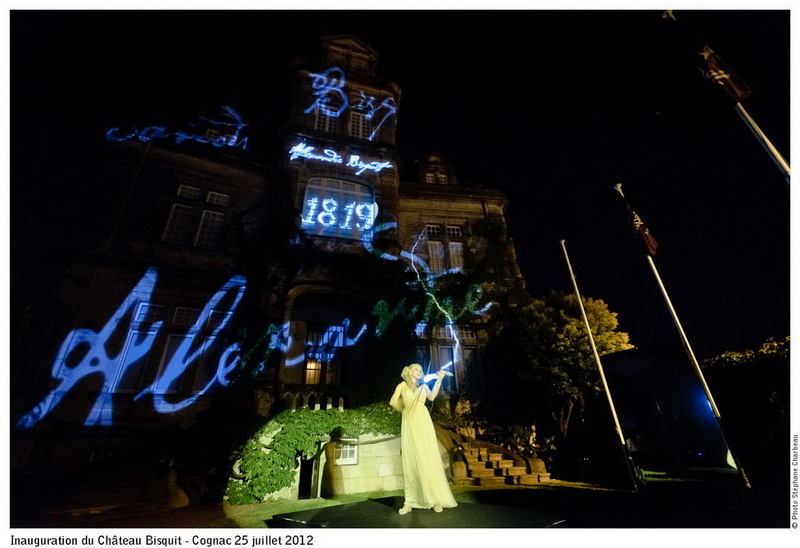 On her own, Kate’s performances are powerful, but her music is often enhanced with lighting effects. 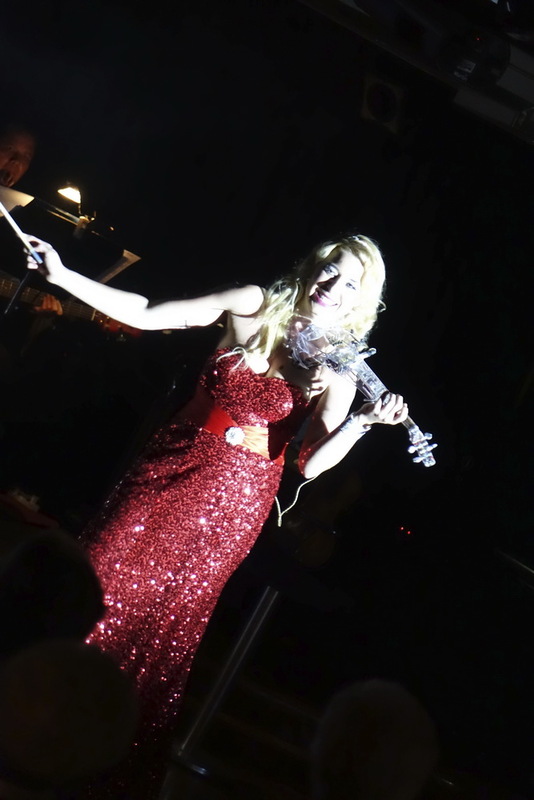 She especially sparkles with a ten piece band, a chamber orchestra or string quartet. 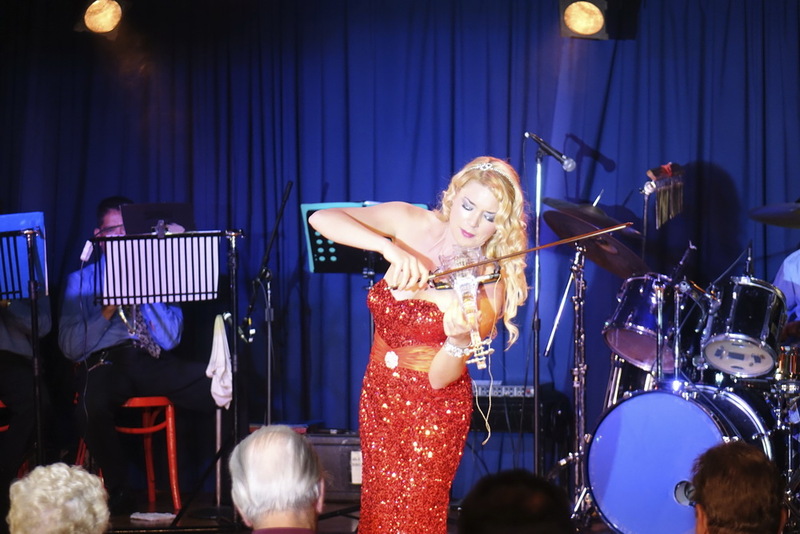 Her repertoire ranges from The Phantom of the Opera to The Queen of Sheba to the King of Pop, Michael Jackson. 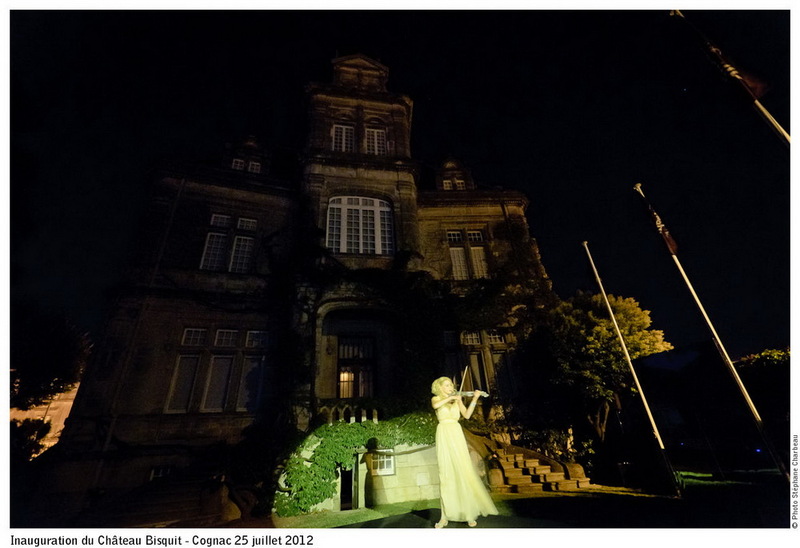 Each song is evoked to life, whilst elegantly-costumed Kate smiles and sways as she plays her violin—moving her audience by building rhythms—from soft and mesmerising to intense, vigorous and exciting. 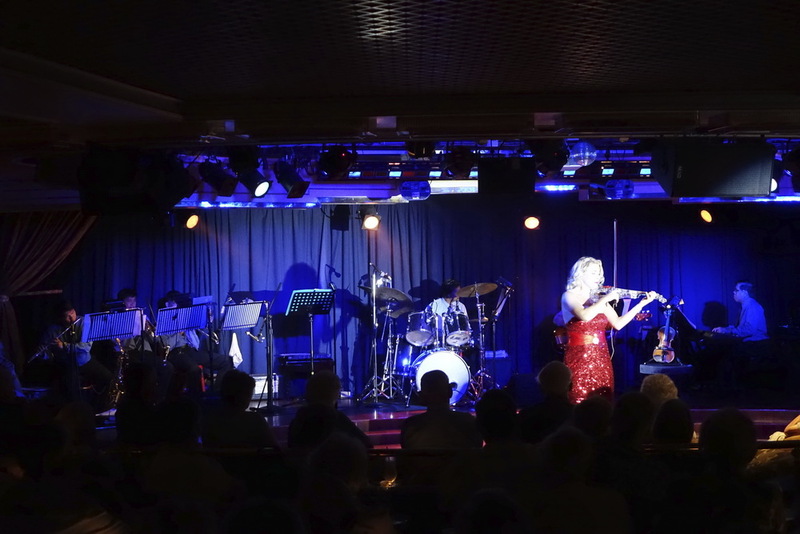 In 2015, Kate will be performing for Fred Olsen Cruise Lines, to the delight of passengers sailing between the Caribbean, Iceland, Norway, America, and the Canary Islands. 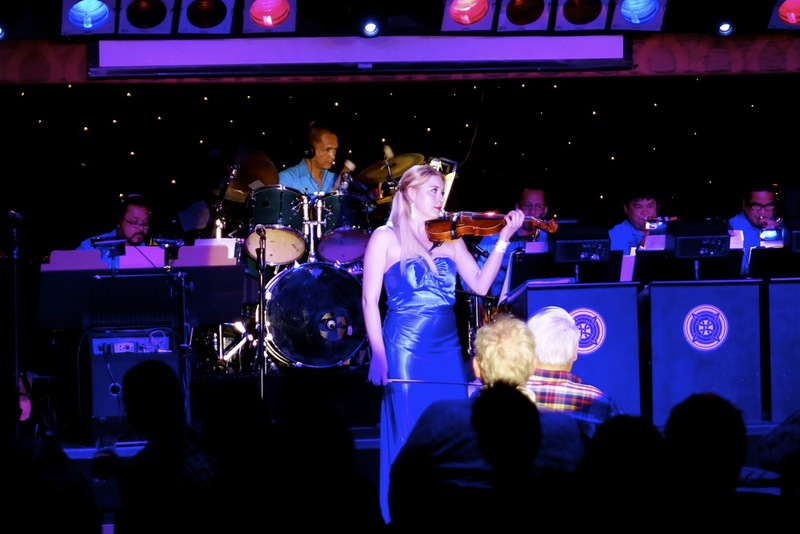 If you are interested in having Kate elevate your entertainment, be it by land or sea, please request the set list—she already has fifty astounding arrangements ready to perform. I knew the moment I heard Kate playing in Leeds that she was exactly what we wanted for our Wedding - we flew her out to Mallorca for the event and she is TRULY OUTSTANDING. I cannot praise her talents and professionalism enough - Kate is first class and was a highlight of our day - my husband asked for 'Last of the Mohicans theme' 3 times. 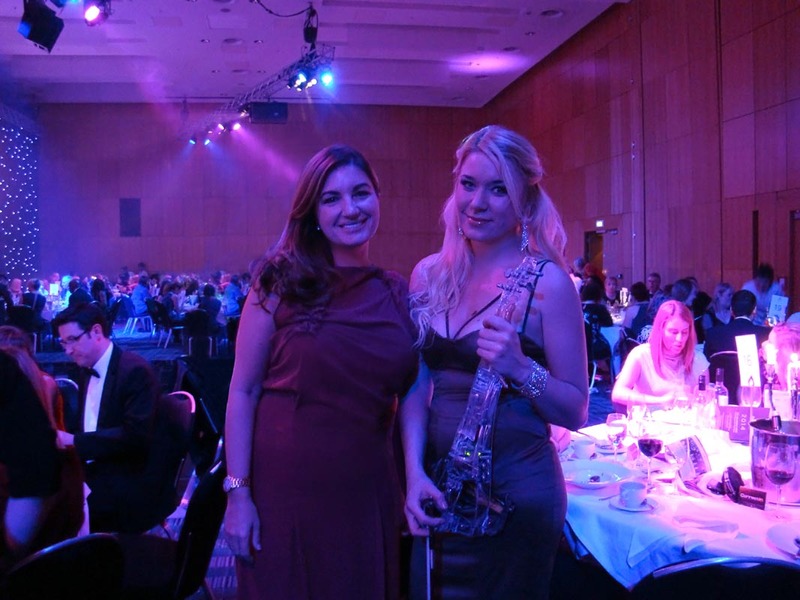 All our guests were amazed at our find - Kate we will hire you for all events in the future as I know will our guests. Perfection. We just wanted to say a huge thank you to you for playing at our wedding. 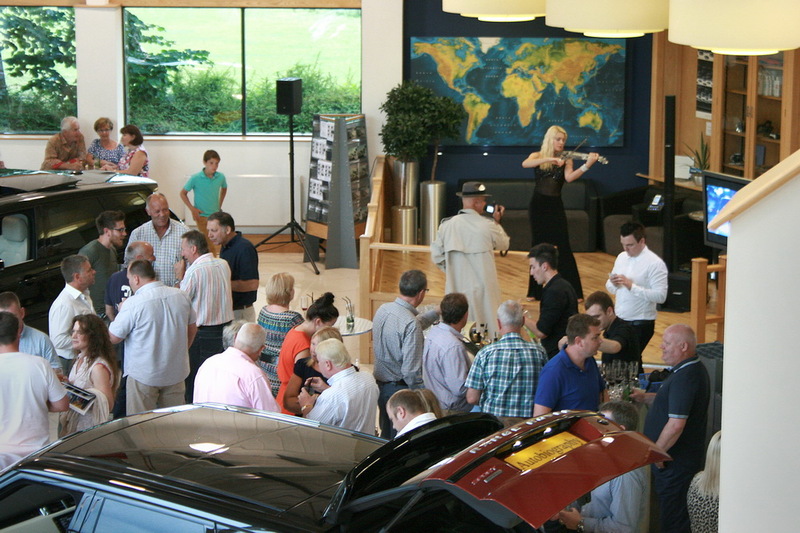 You were absolutely amazing and so many of our guests commented on how fantastic your playing was throughout the day. Sean and I have just returned from Honeymoon, and I just wanted to say thank you so much for the fantastic performance you gave playing at our wedding. You were absolutely brilliant, I couldn't have wished for a better day, I really appreciate you playing the pieces I had asked for, I can't thank you enough you really were amazing! Wishing you lots of luck in all that you do. 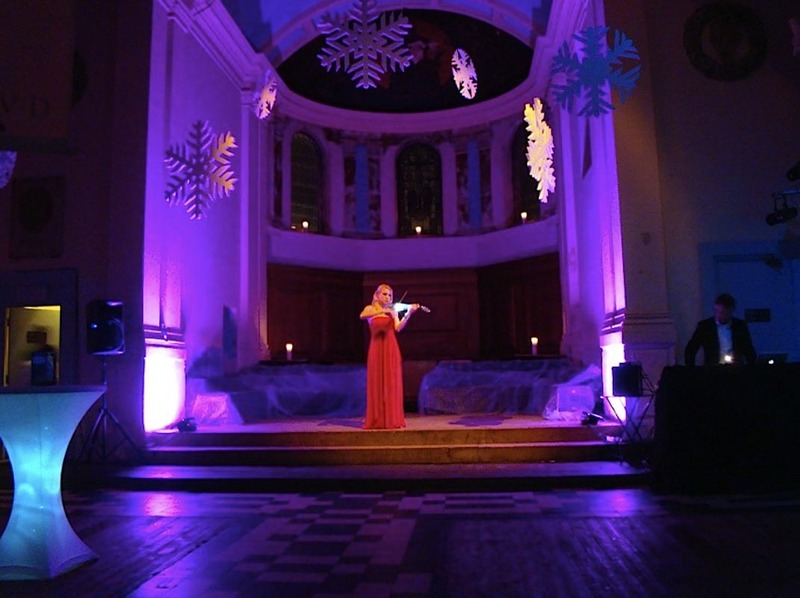 Just to say thank you once again for performing at our wedding last Sunday, and for all your help in choosing the pieces over the last few months. You were brilliant (as ever) and many people were complimentary about you so I just thought I should pass that on. Hope to keep in touch. 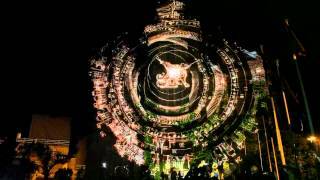 Best Wishes for the new year. 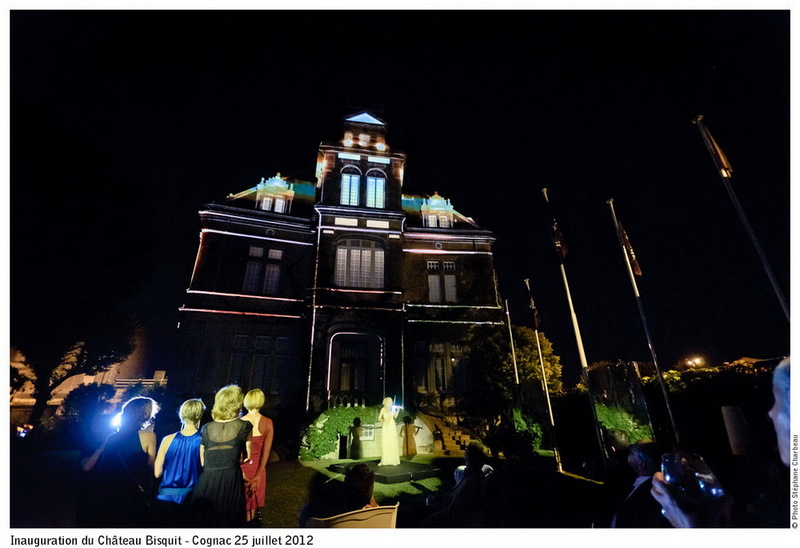 Just wanted to say a huge thanks for helping to make the party a huge success. Holly said you were amazing, I’m so sad that I couldn’t be there to hear your performance. Hopefully I will be able to see you again in the near future & work together on another event (once I am up and about)!! I just wanted to thank you again for everything the day went perfectly and everyone commented on how great you were. Thank you for all you have done, for amending pieces and playing beautifully. 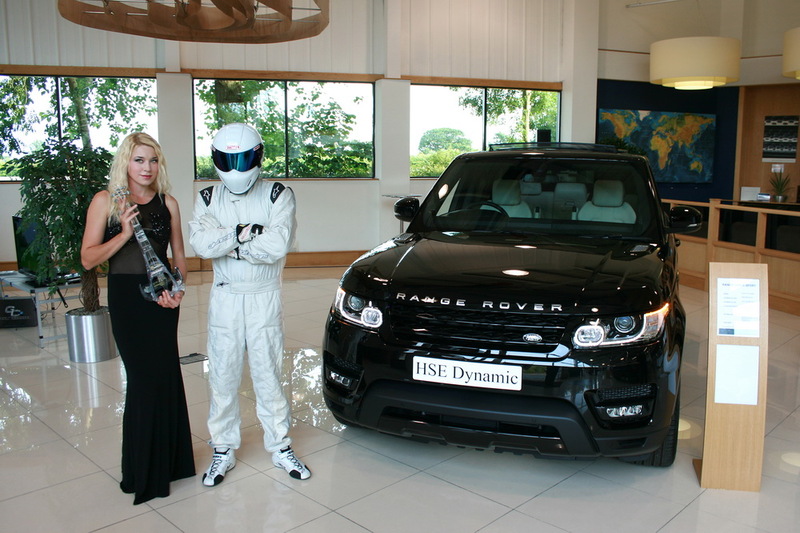 Thank you very much for your performance at Hannah and Danny’s wedding yesterday. It made the day very special and everyone was was very impressed with the quality of the music, your performance and the nonstop effort that you demonstrated throughout the afternoon. It was brilliant. I just wanted to email you to thank you for making our wedding day extra special. 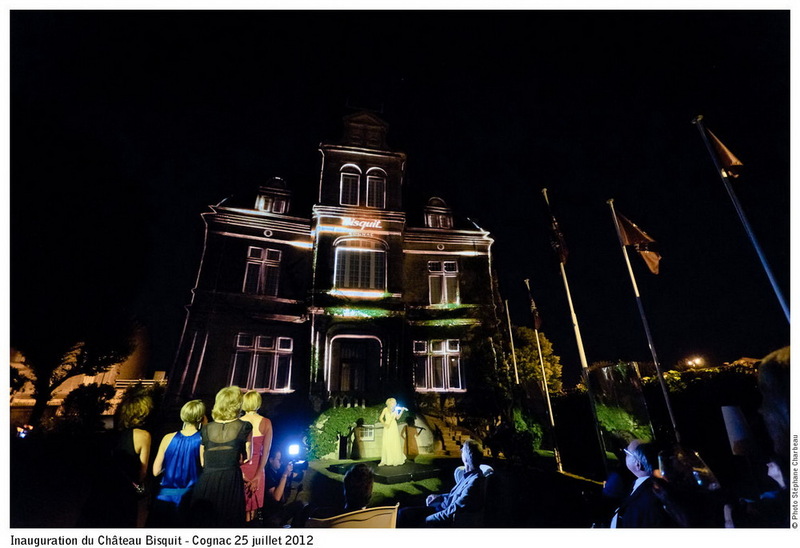 It was absolutely perfect and so many of our guests commented about how lovely it was when they came through for the arrival drinks after the ceremony to hear you playing. It created such a talking point. The music you played was beautiful and you catered for our requests wonderfully. Thank you so much for Saturday you made our wedding perfect! I am So sorry I didn't get chance to speak to you- I felt really rude afterwards- however with the weather our guests were desperate to get to marquee earlier than we planned. Everyone commented how beautifully you played. Once again thank you so much!!!! Sorry its taken me this long to email you but its been a mad week ! I just wanted to say, once again, a huge thank you to for your contribution to my party on Saturday night and for helping making it such a success – I have has so many cards, letters , telephone calls and emails saying what an amazing night everyone had ! 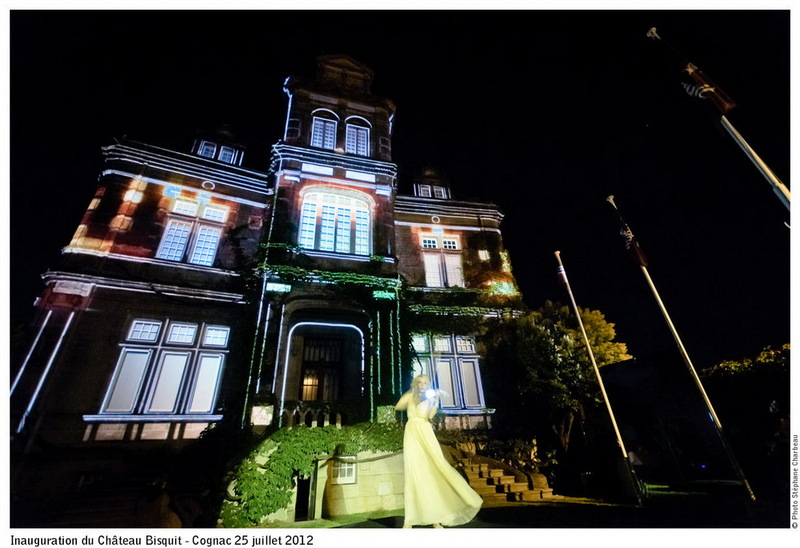 without exception they all said how amazing you were ….and you were! I think you may also get a couple more bookings out of it too !!! I would not have done a thing differently and the whole party turned out just as I wanted Andy and I had the best night we have ever had and that’s saying something! 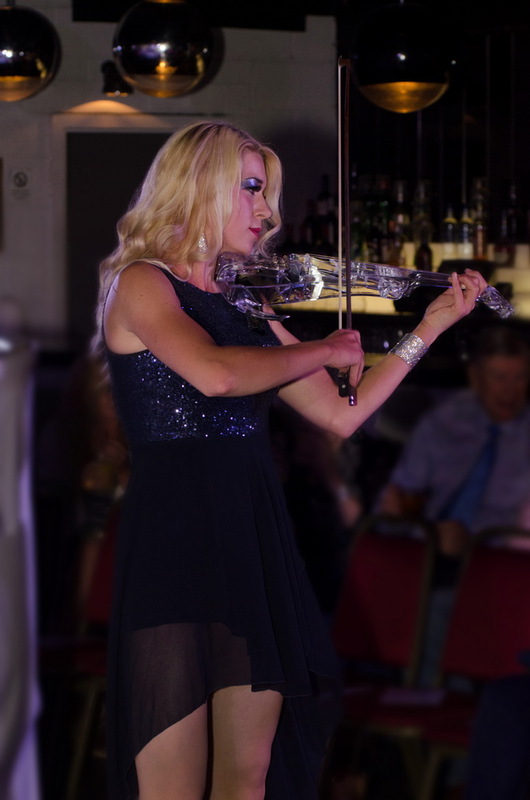 Kate , Just a note to thank you for performing on Saturday at Amelia's wedding . The repertoire was just right and your performance was very well received and enjoyed by us and all of our guests throughout the afternoon . Who would have believed you would ever find yourself in deepest Lincolnshire playing at a Private Horse-Polo pitch at a funeral reception to 250 guests. It sounds like you have new opportunities for your future career and I hope you embrace them, can spread your wings and follow your heart now to wherever it takes you. Having spoken to you yesterday for really the first time, there is also a lovely person inside alongside that musical talent, so don’t ever change who you are. Sorry I didn't get chance to say hello and thank you in person yesterday, I honestly don't know where the day went! I just wanted to send you a quick note to say thank you so much for your performance. 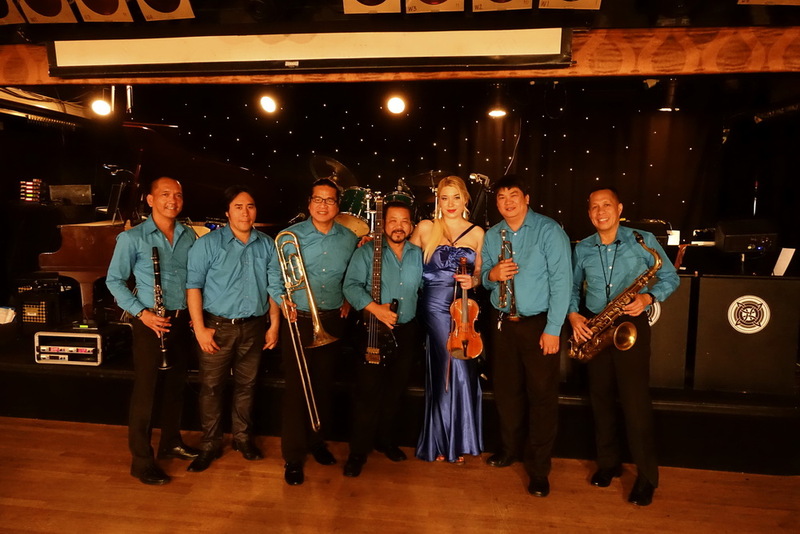 We were blown away how good you sounded, and received so many compliments from other guests, who wanted to know where I had booked you, as they have up coming events. I will forward your details on. ou helped to make our day very special. Thanks again. 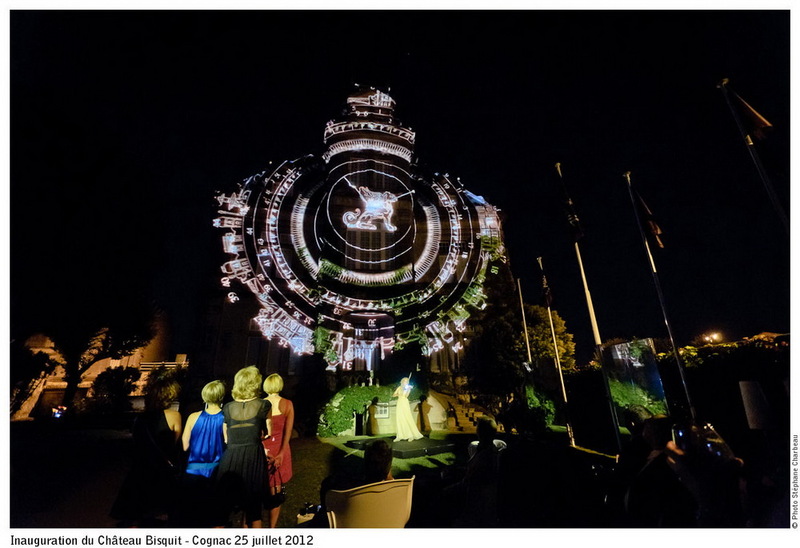 When we were planning our wedding we of course wanted to make the day as memorable and beautiful as possible. We were searching for ideas for our wedding whilst in Leeds City Centre one day and heard Kate’s music down the street. We ventured down to see her playing, and we both commented on how wonderful it would be to have her play at our ceremony. We approached Kate who was really friendly and kept in communication with us up to the big day. Kate helped us to pick the music we wanted, sending us samples of suggested tracks, and finding backing music for ones we requested. 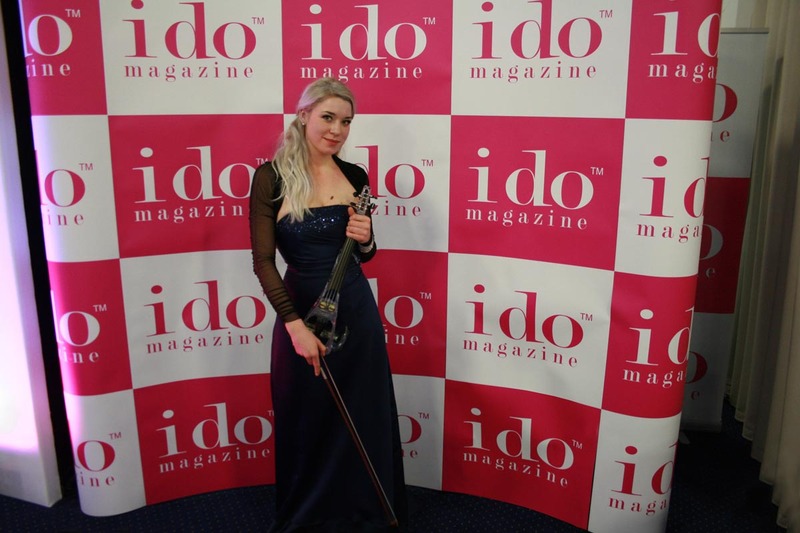 On the day of the wedding Kate didn’t disappoint, everyone commented on how wonderful her music was and the violin added a real touch of class to our day. 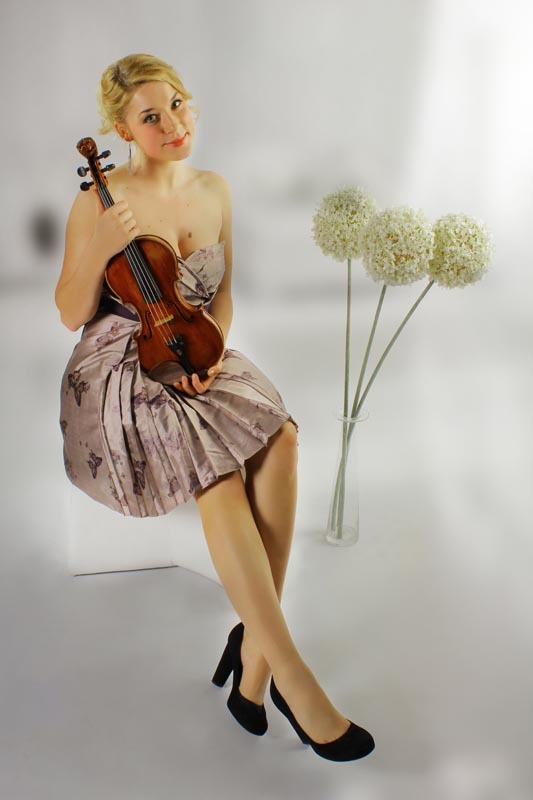 Kate was on time, immaculately dressed and played wonderfully – we’d really recommend Kate for whatever your event. 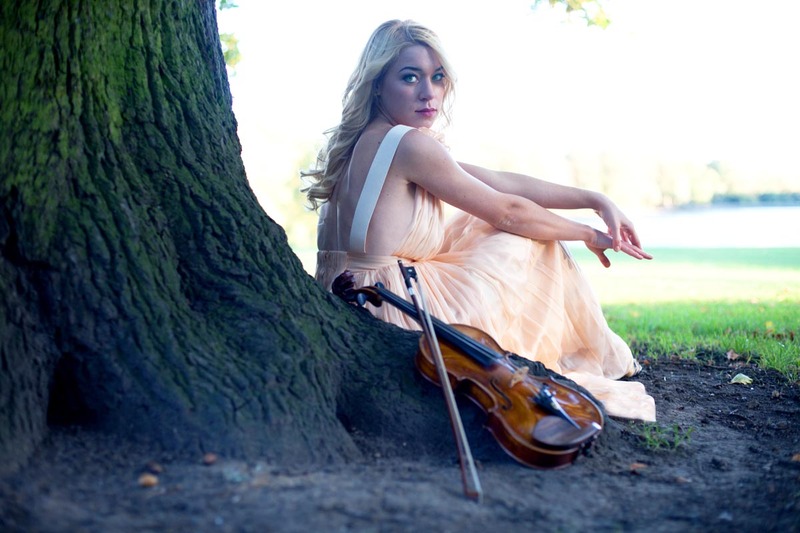 We’ve since listened to Kate’s new album which is great, and has a real mix of classical favorites and modern hits. 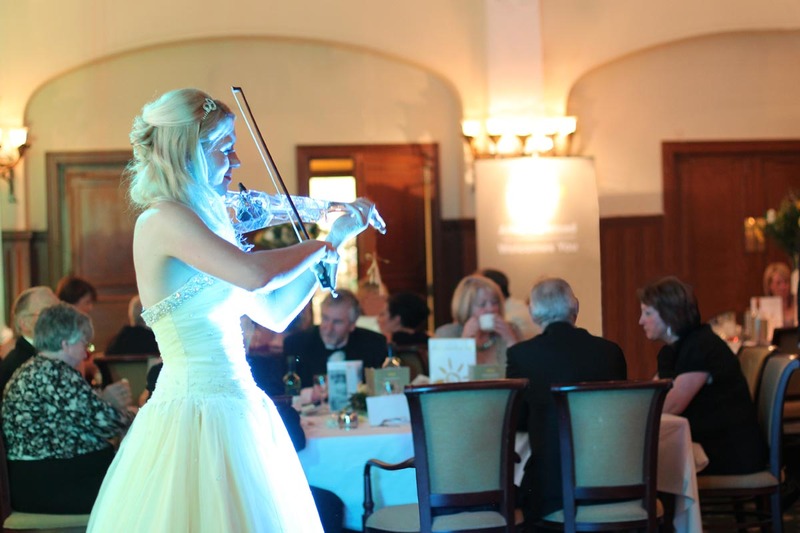 The wedding guests all commented on 'that wonderful violinist' who really got the event off to an emotional start. 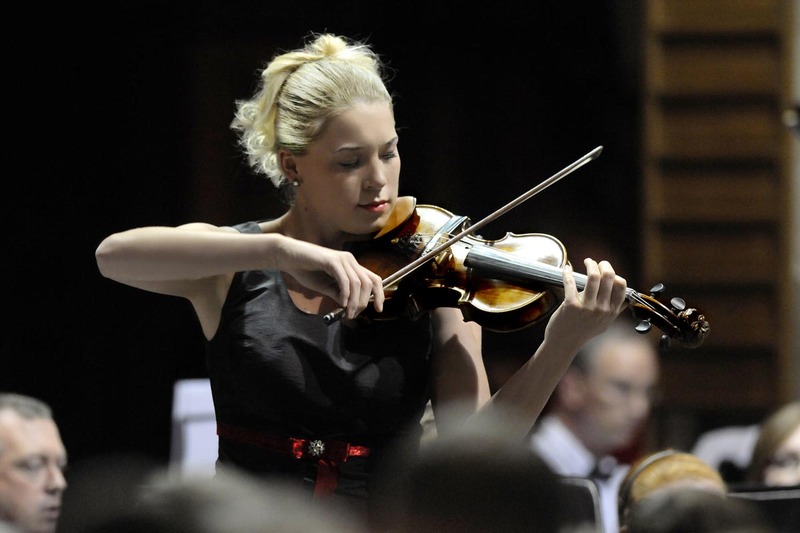 Kate's pieces were played with great passion and enthusiasm which added a terrific dimension to the whole day. 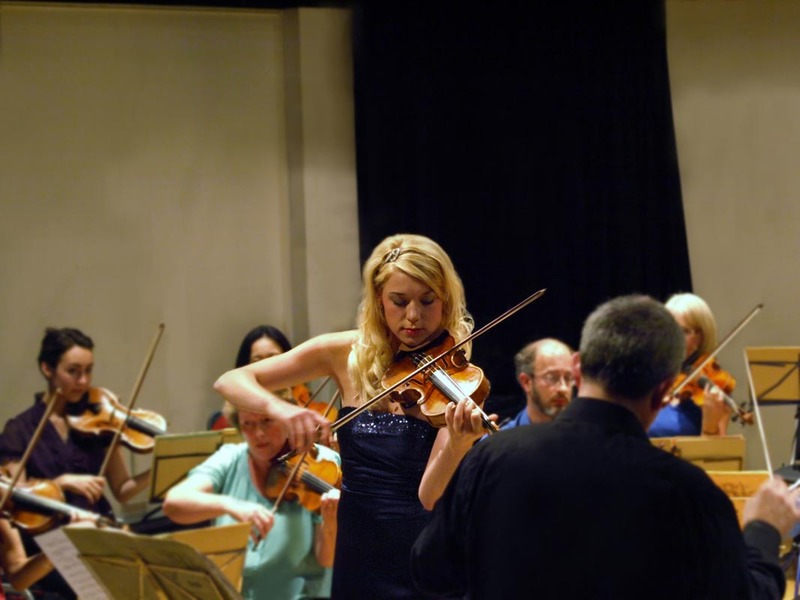 Kate had put together a brilliant score which included something for everyone and it was presented in a way that captivated her audience. The whole day was made complete because Kate added a unique strand of magic which brightened up everyone's hearts. 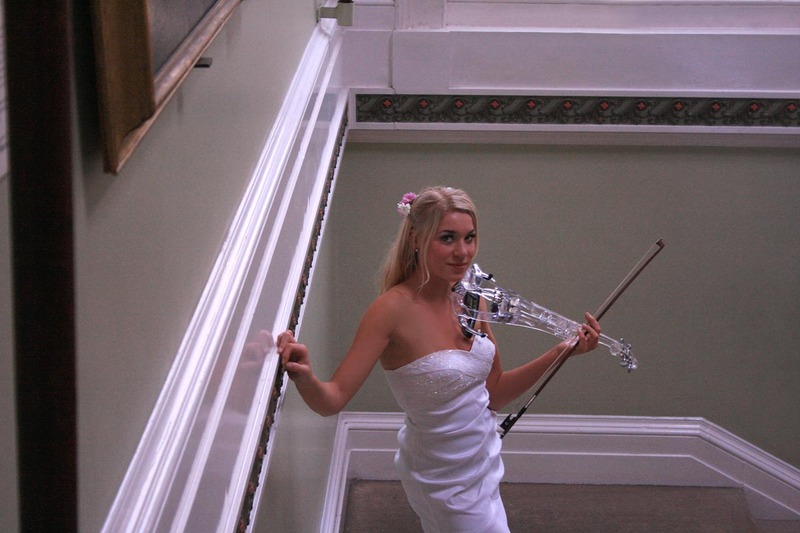 Kate played at our recent Silver Wedding at Ripley Castle. Everyone there thought she was fantastic! 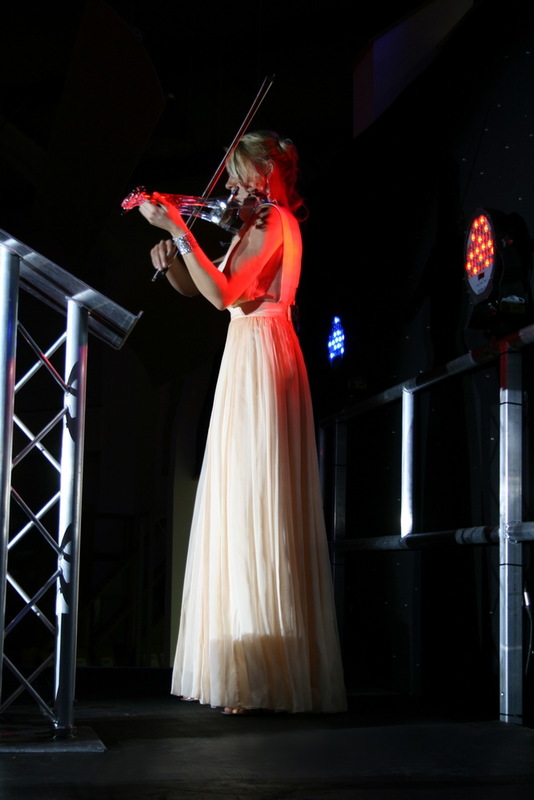 We were really pleased with her musical choices for the evening and her violin playing is simply brilliant. As we arrived at the venue, we could hear Kate start to play, which was a nice touch and set the mood for the evening to come. We would recommend her to everyone, whatever the occasion. 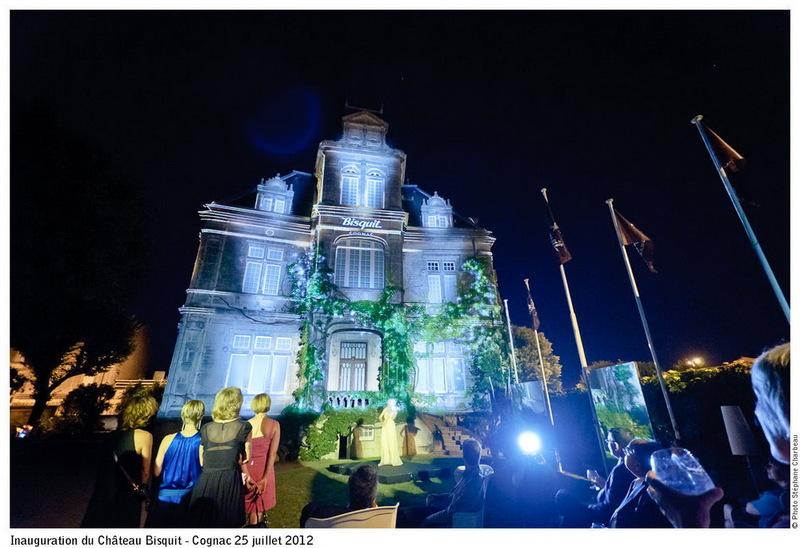 Thank you for making my 40th birthday so special, all the guest has told me how good you were and how moving was the performance, Your selection of musique was very good and we thank you for accepting some selection of our choice. Thank you again, we love your performance and wish you every success in future. Je ne trouve pas les mots pour te remerciè pour la magniphique soirèe que tu nous à animèe, inoubliable et èmouvante. 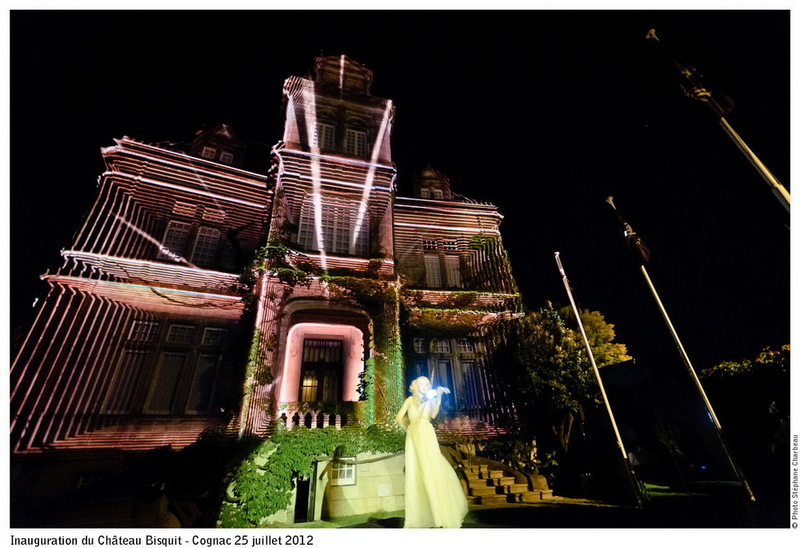 Spècialement le duo inprèvue et non planifier par nous deux, tu ètais d'une performance extra ordinaire, ça restera graver à j'amais dans ma mèmoire, grace a toi j'ai rèalisè le plus beau rève de mon mari. Tout mes invites etais inpresoinner par notre duo. Une chose est sure, c'est que quelque soit ma prochaine occasion, c'est à toi que je ferais appel. Bonne chance dans ta carière et je suis sure qu'une belle carière t'attend. I just wanted to drop you a note to say thank you so much for playing at my wedding yesterday. 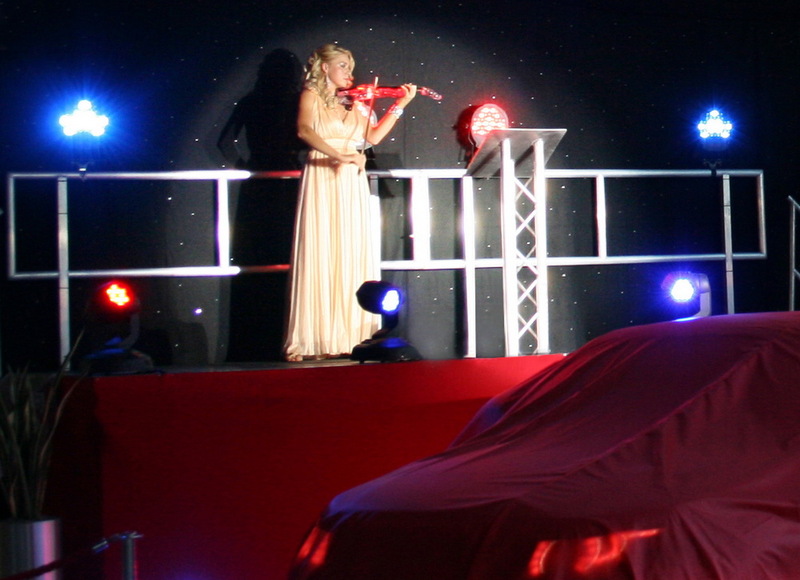 Many of my guests commented on how fantastic you were and you made the ceremony feel very special. One guest thought you had purposely worn a red dress to compliment my flowers! 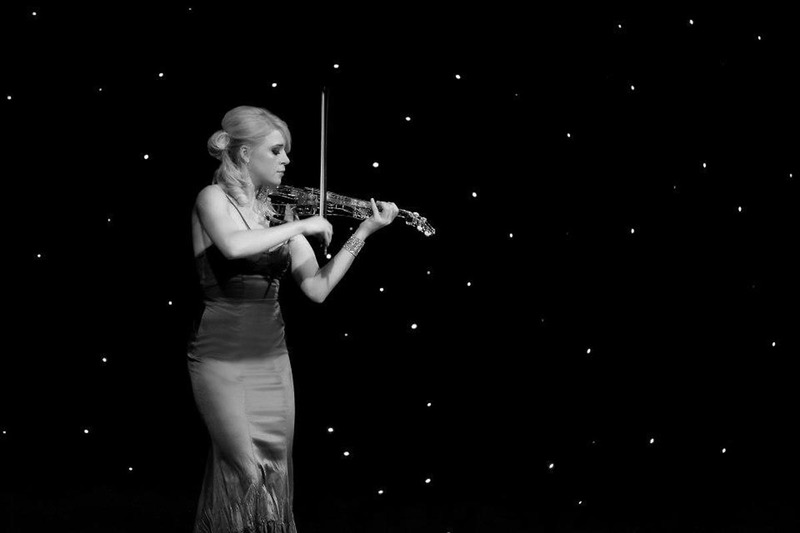 I arranged for Kate to perform at my son's wedding on the 4th June 2011. Kate's performance, manner and professionalism was superb. 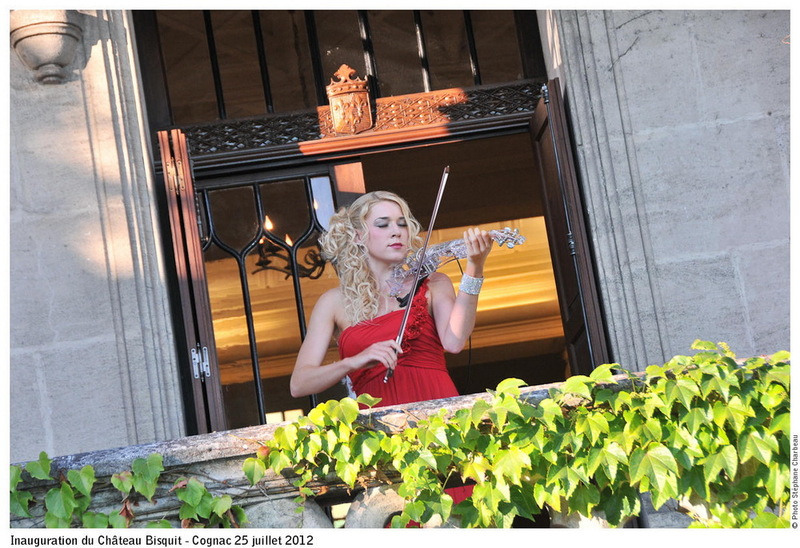 All the guests were so impressed with her music; it made the day extra special. 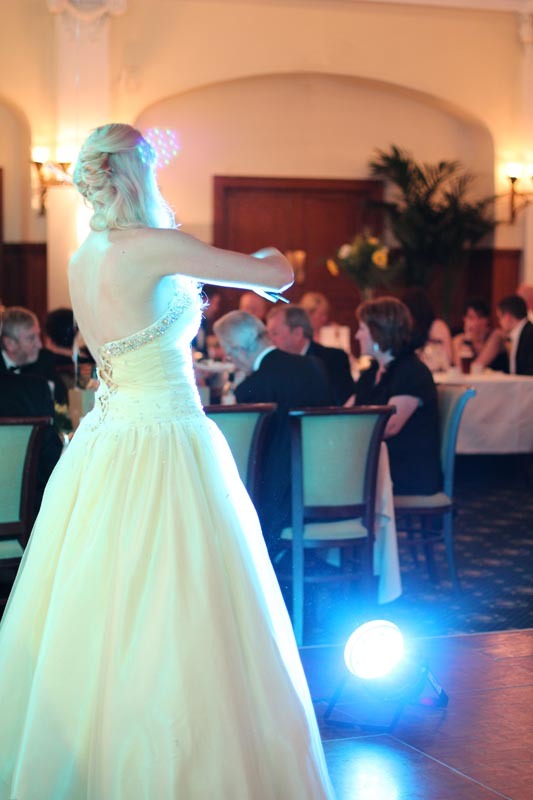 I would recommend Kate wholeheartedly to anyone wanting to add something special to their personal events. 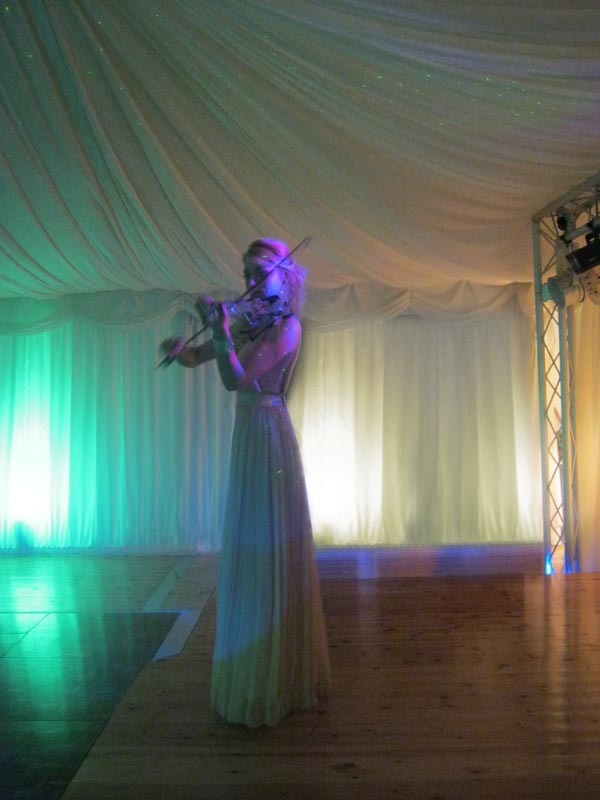 Kate was very professional and creative in her performance at the recent wedding at Whirlow Grange. 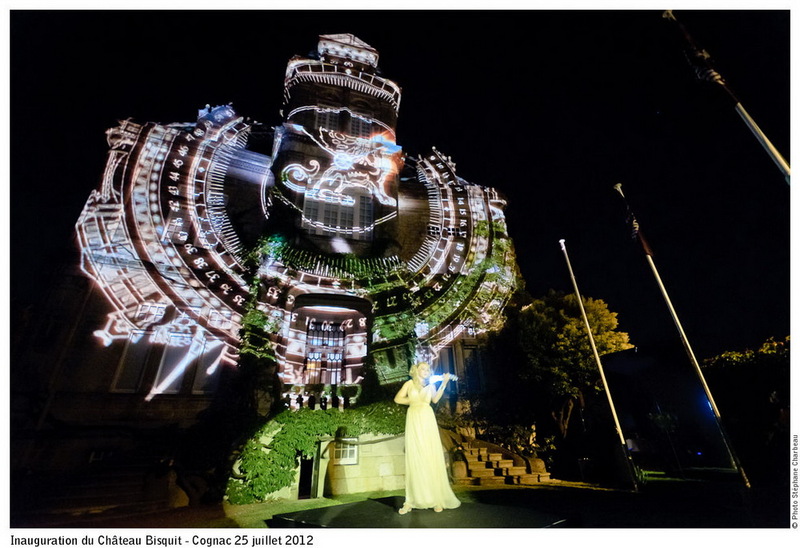 We see many performers and creative individuals and Kate was up there with the best. 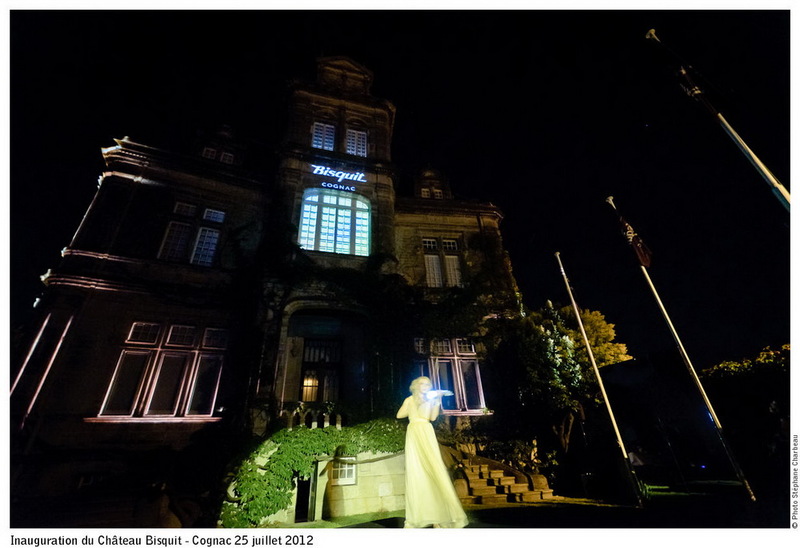 She was helpful and reflective of the needs of guests and the wedding party. All round a first class choice of performer. 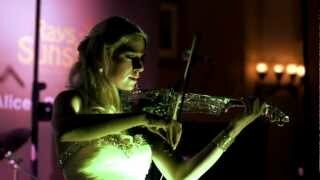 Having had Kate perform at our wedding earlier this year we are delighted to recommend her. Her repertoire was excellent. She was professional at all times, and communicated regularly. 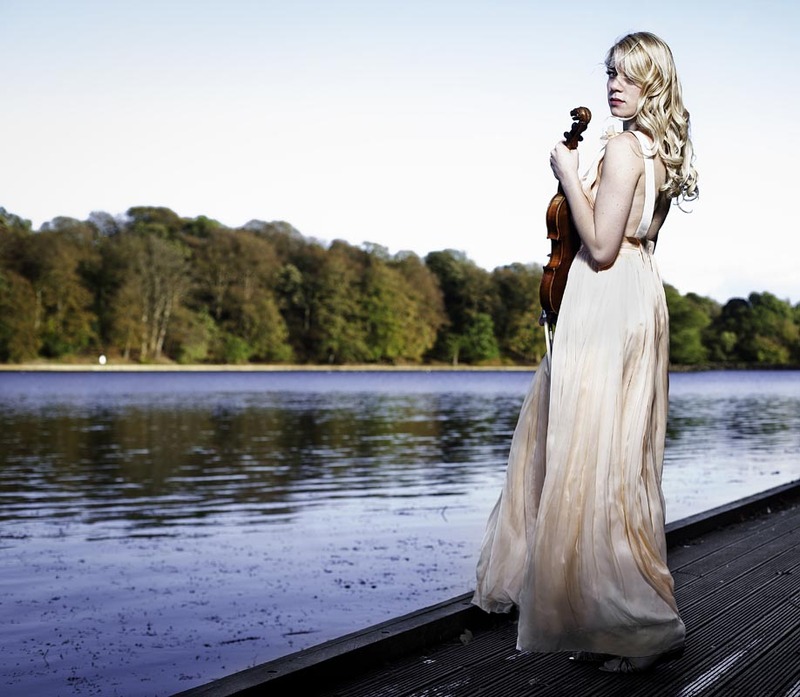 Her Violin music was beautiful at the Hotel wedding ceremony and the blessing service that followed held at Bolton Abbey Priory in North Yorkshire. Kate is a real find! Just to say thank you for your truly wonderful playing yesterday. Many guests from my 50th birthday party in Lincolnshire have contacted me today, mentioning how much they enjoyed listening to you. My most sincere best wishes for all that you hope to achieve in the future. 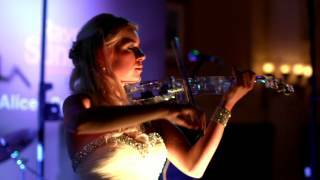 Kate played at our wedding and was outstanding, we would highly recommend her to play at any event, she was one of the highlights of our special day! Thank you so much Kate! I got back from honeymoon at the weekend - I wanted to email you to say a big thank you for playing on the day. It was brilliant - everyone commented how good you were. 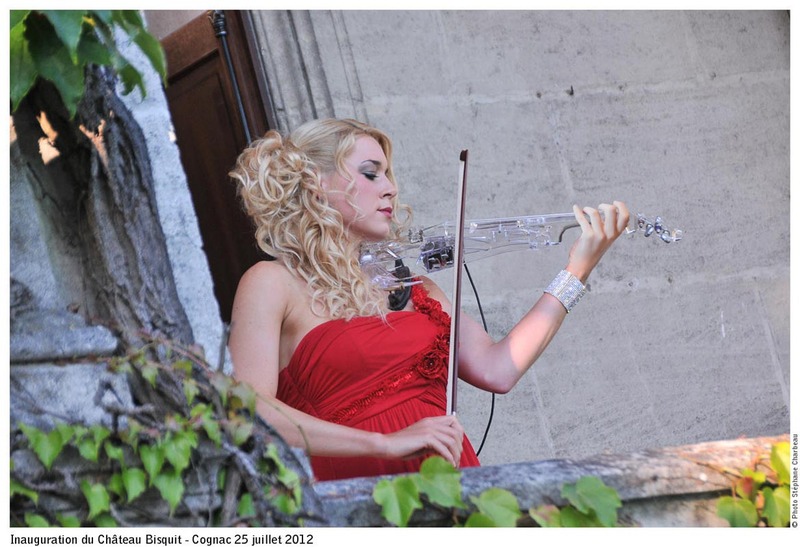 I really wanted to send you my sincere thanks for providing such beautiful music on that special day. It made their ceremony perfect. 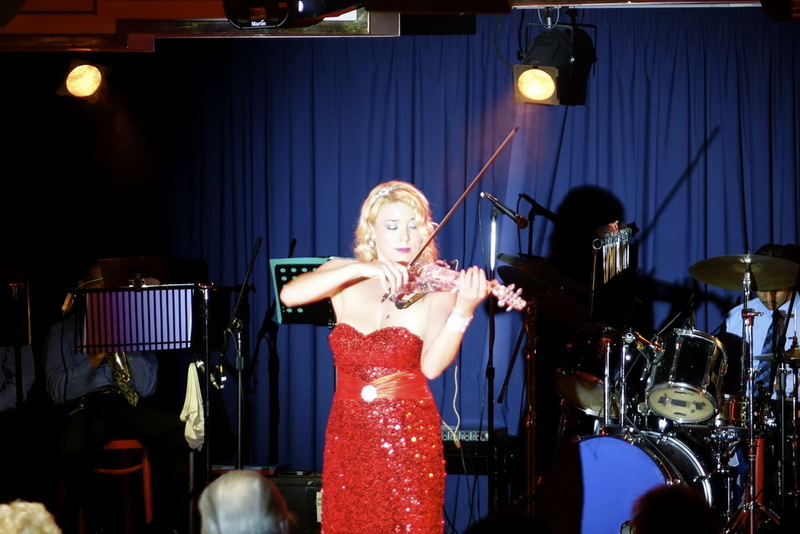 The guests were all buzzing with comments and complements about your reception performance and I have to say that I enjoyed every minute listening. 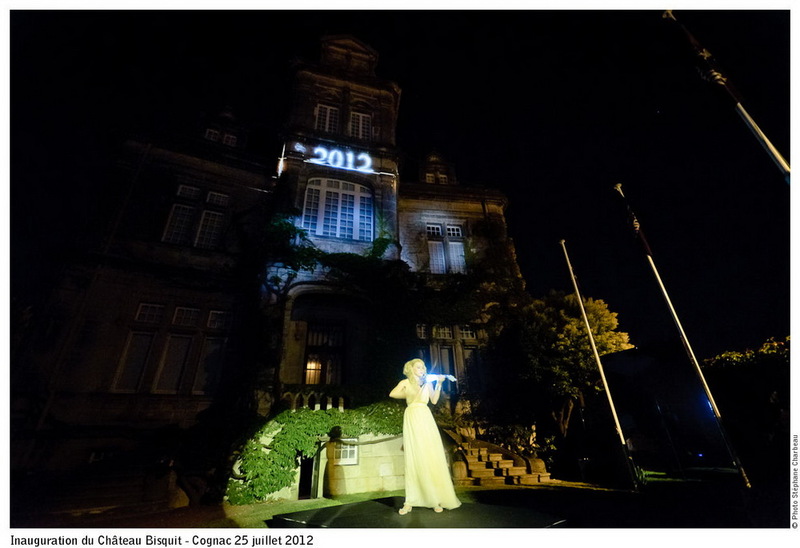 (…) and best wishes to you for your continued career in music. I am delighted to hear that everyone fully enjoyed your presence and Oliver and his partner send on their sincere thanks to you. 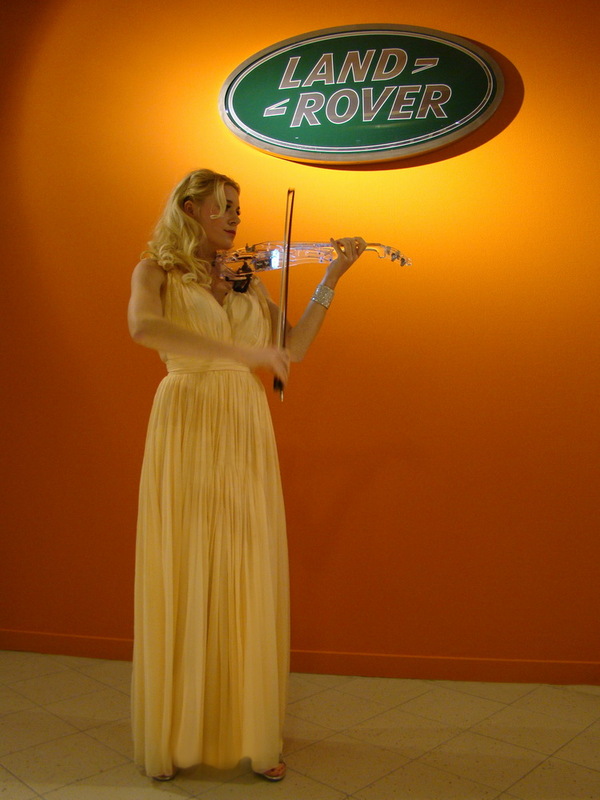 Kate the violinist was truly spectacular at our Range Rover Evoque Launch. 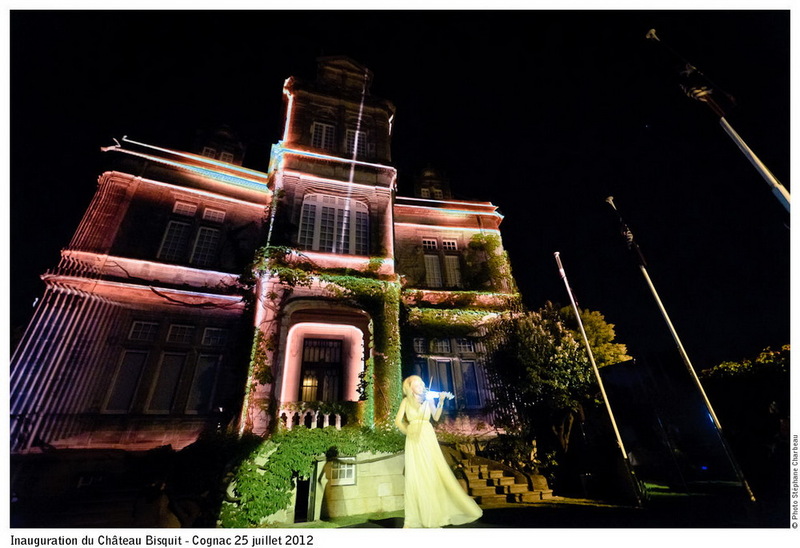 She entertained and indeed memorised our guests all evening with her exquisite performances. We received so many compliments about Kate. 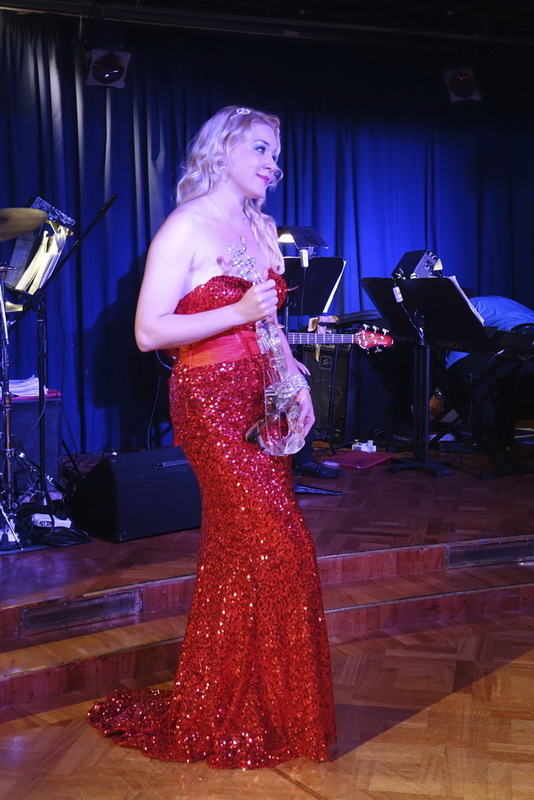 Her quality and music was perfect for our occasion and what impressed us all was her commitment to the evening - she played all night! A true professional. 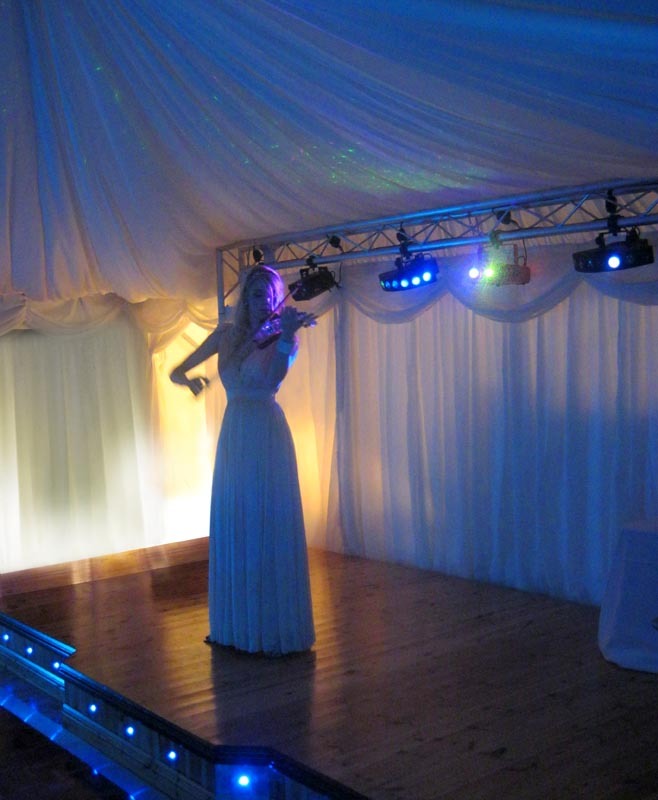 We would not hesitate to recommend Kate, particularly if you’re looking for that wow factor for your event. 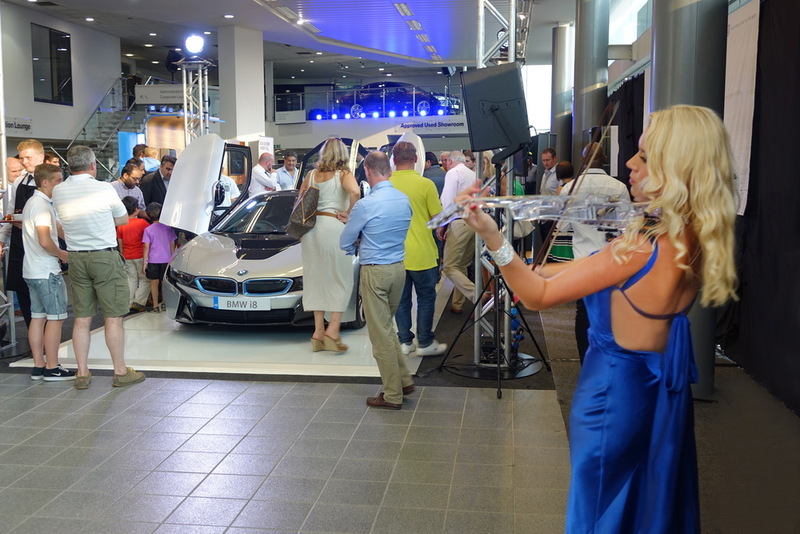 Just a short note to thank you for the excellent entertainment at the launch of the BMW i8.The pieces played really added to the event theme and to the success of the event. We look forward to working with you again in the future. 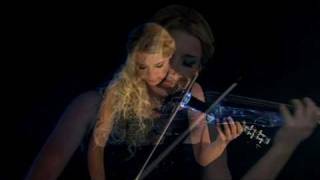 We watched yesterday the video we made of your performance and appreciated it very much. 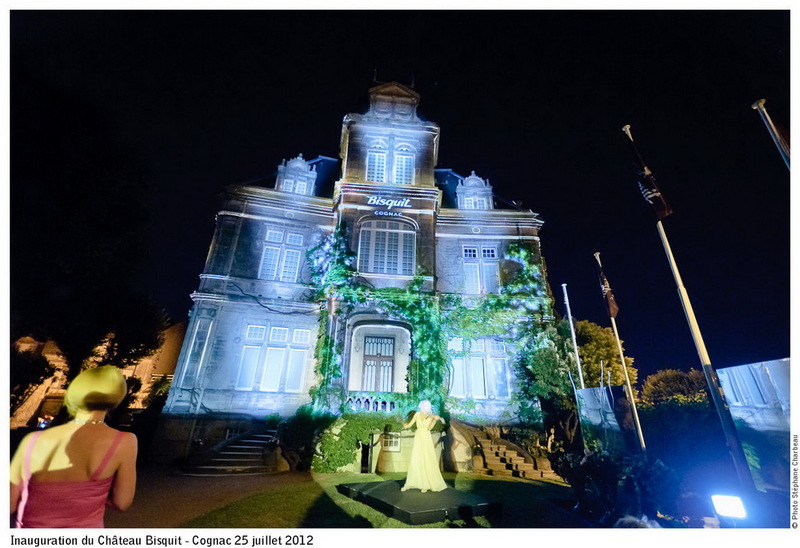 It is also nice to see it without any pressure from the exhibition! And thank you for patience and professionalism. Hope your future will be as you wish and hope to see you performing another time! 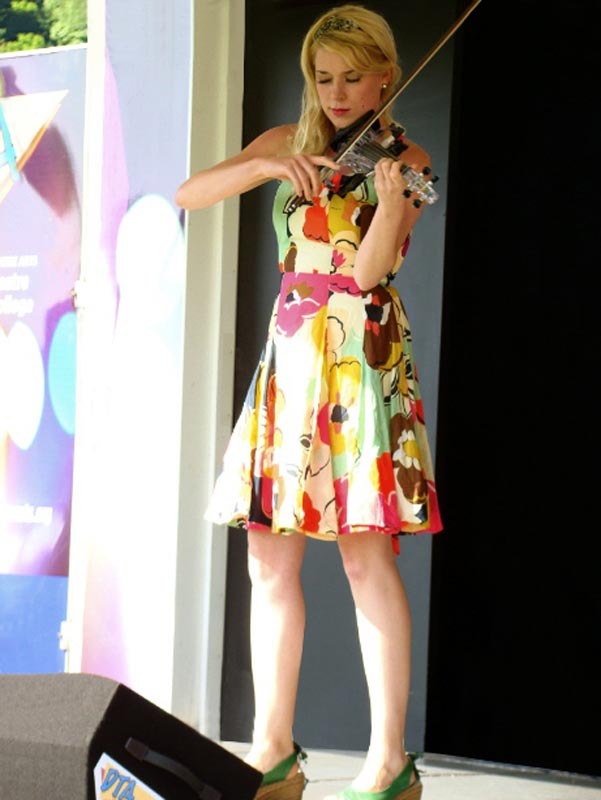 Kate played at the Yorkshire Cancer Research Art Exhibition which was held at Pavilions of Harrogate last May. 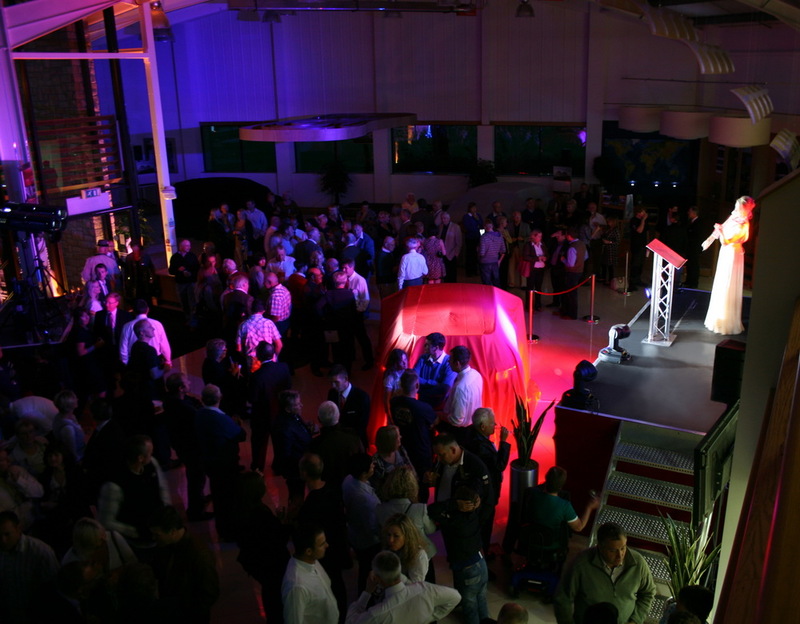 The event was attended by around 350 people and was opened by The Rt. Hon. William Hague. 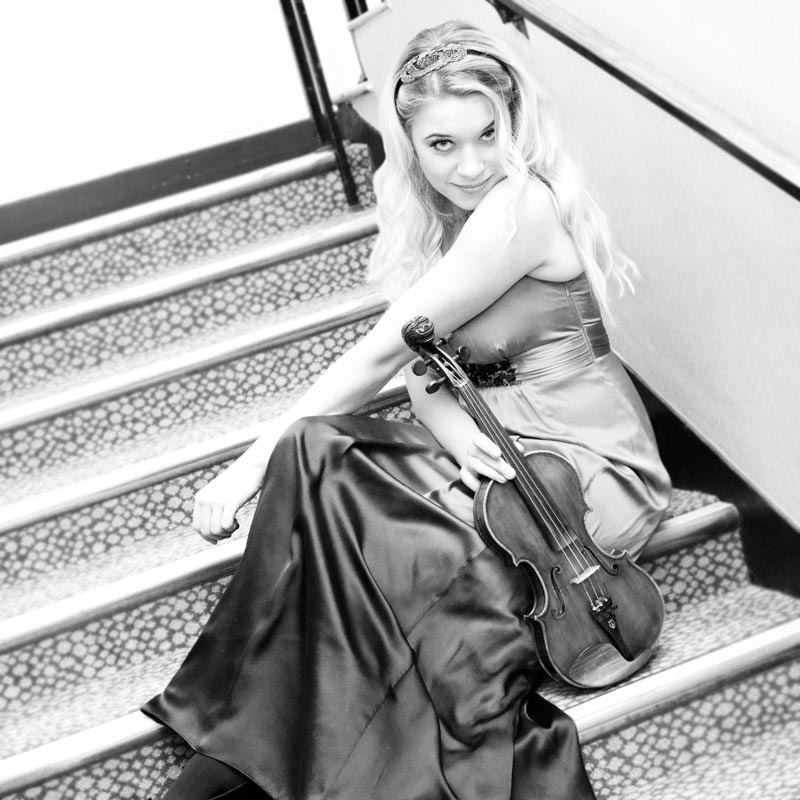 Following our initial discussion, Kate chose a selection of classical and elegant popular pieces to play. 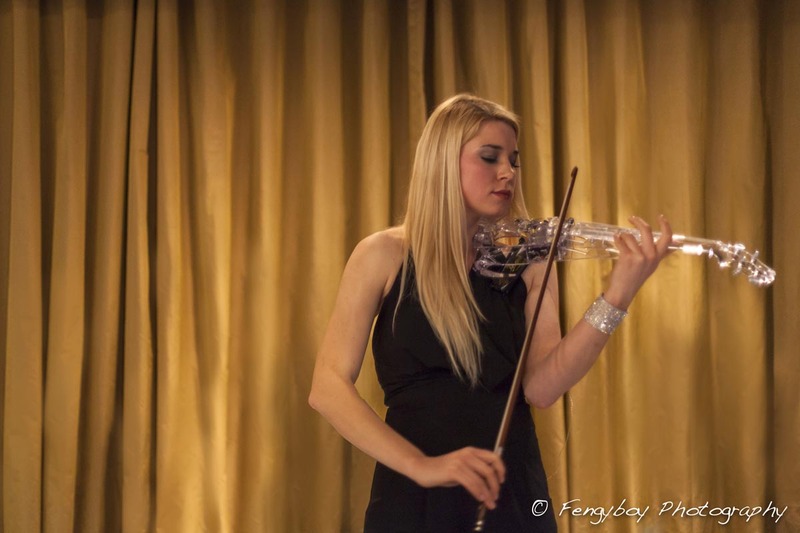 Her performance was impeccable and I received many complimentary comments. I would not hesitate to use her again. 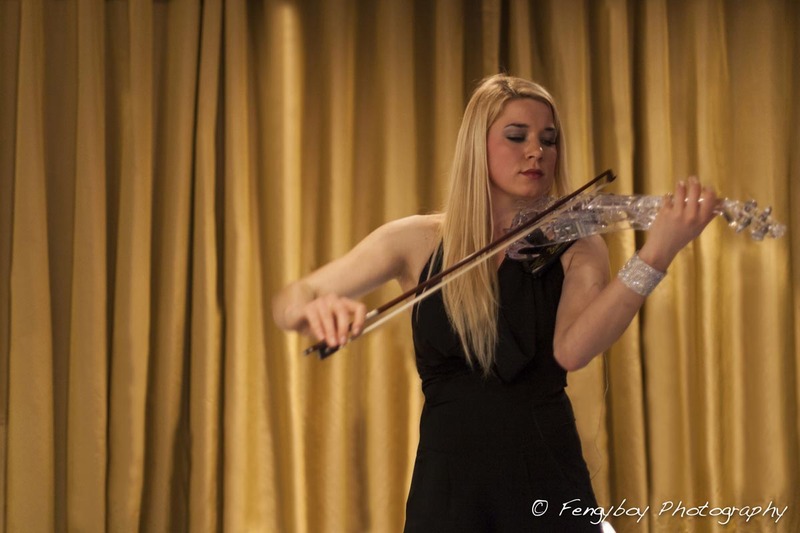 Thank you so much for your wonderful performance last month. 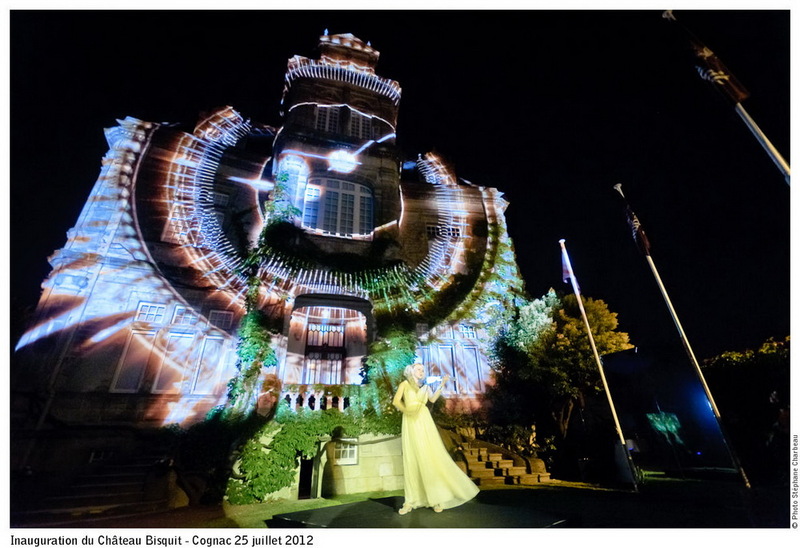 I know our guests were thrilled with your bright and vibrant performance. Sorry I didn't get to say thank you for last night. 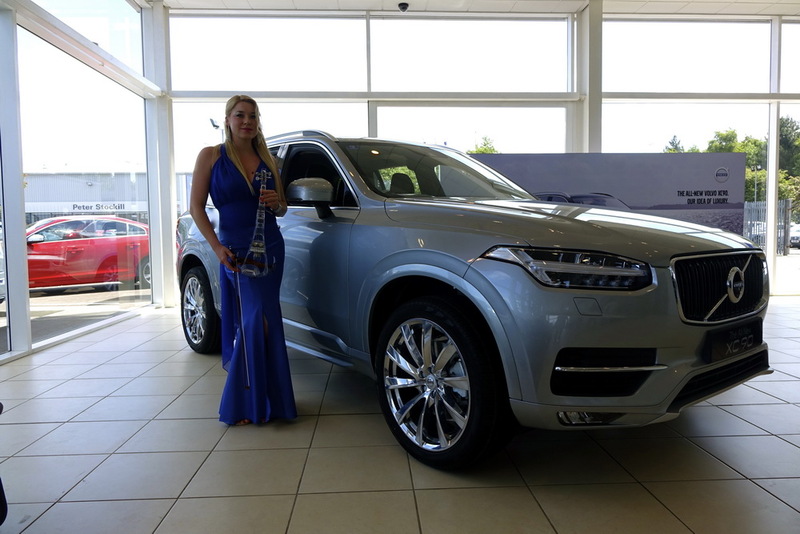 I got caught up in a few issues with Karren Brady & paparazzi waiting outside so I must have missed you leaving. 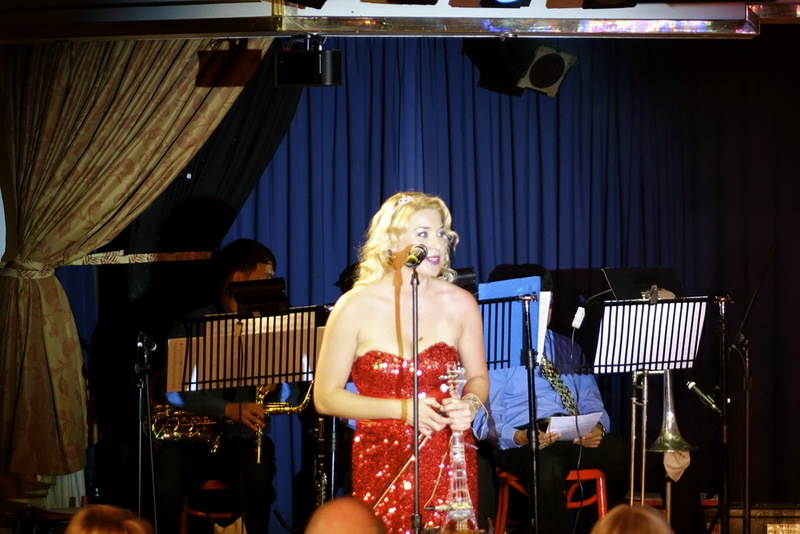 Anyway I thought your performance was superb and I have had great feedback & comments from our guests to back it up. So thank you and hopefully we can work together soon. Just note to say the compliments the public have said with regards to your performance at the Air Show. Everybody thought you were excellent. “Very pleasant and excellent music and violinist very pleasing to one's ear.” “Accomplished young lady.” That was just a few. I understand a millionaire has booked you for some time this year on his estate. Also pleased you sold a few CD's. Thank you and regards. Just a note to express my thanks for your brilliant performance at our Chapter Dinner. 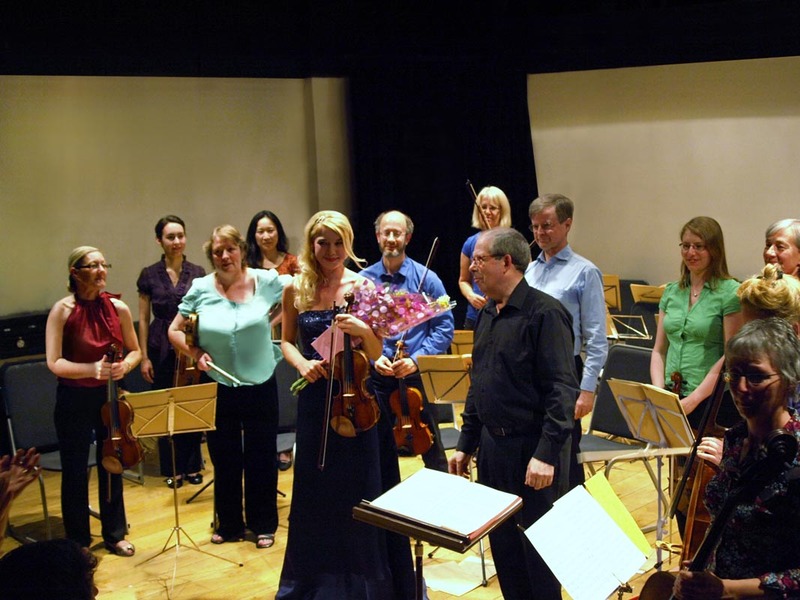 Everyone was delighted with your repertoire and personality and we have played your CD regularly ever since. May I wish you every success in the future and we shall look out for your name in the celebrity circles very shortly. Kind regards. We want to confirm our absolutely gratitude and pleasure in the joy of hearing and being introduced to your exceptional talent at the Mansion House on the 9th May. Everyone thoroughly enjoyed it and are still talking about you. Thank you for ensuring that we had a fabulous evening and looking forward to hearing and watching you play in the very near future. On behalf of the Pattenmakers our sincere thanks. 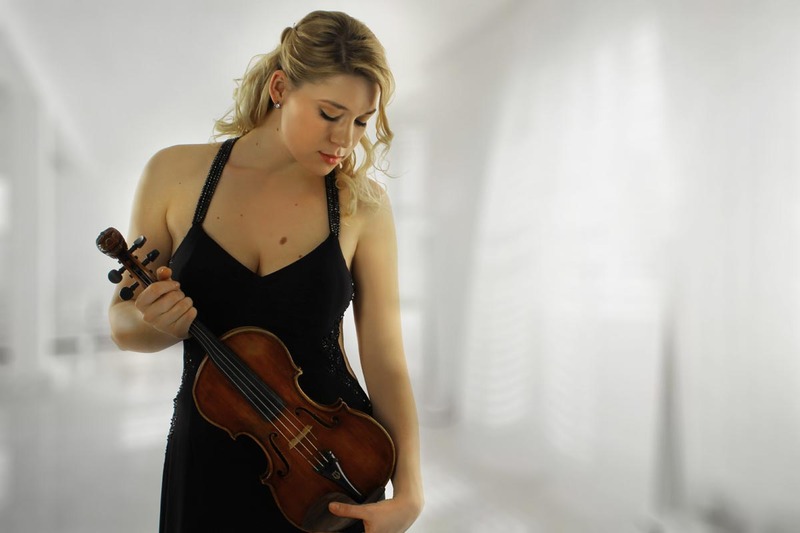 A great blend of classical music delivered with the contemporary twist that today's listener wants to hear. 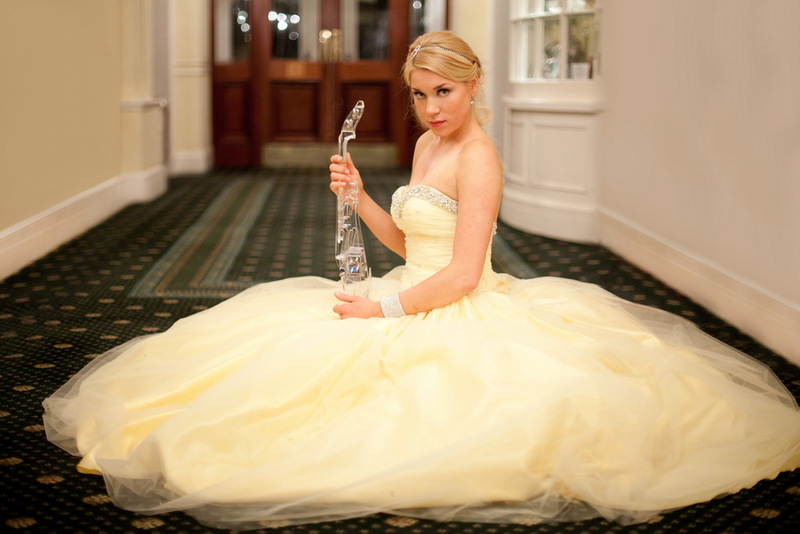 Kate's music is a welcome addition to any style of event or party. 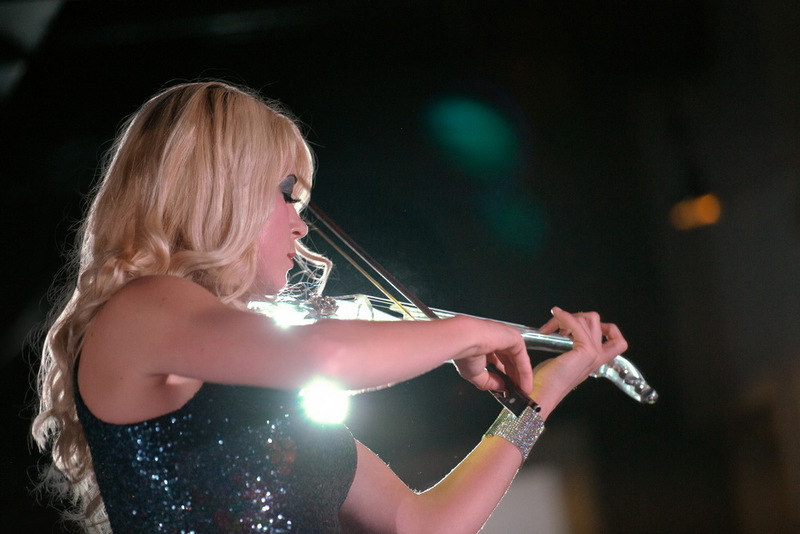 Kate played a varied set of classics and popular tunes, displaying a virtuosity that immediately seized the audience. 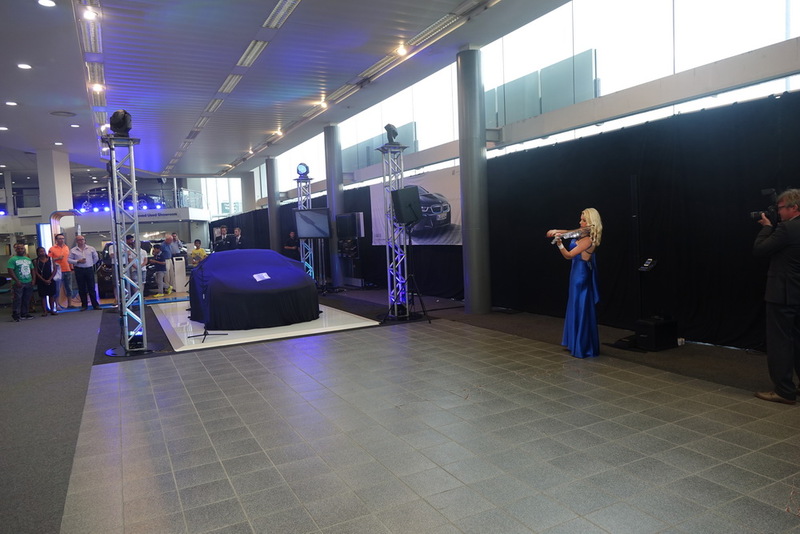 The assembled group were entranced and said they couldn’t wait for her to come back to play for them again. 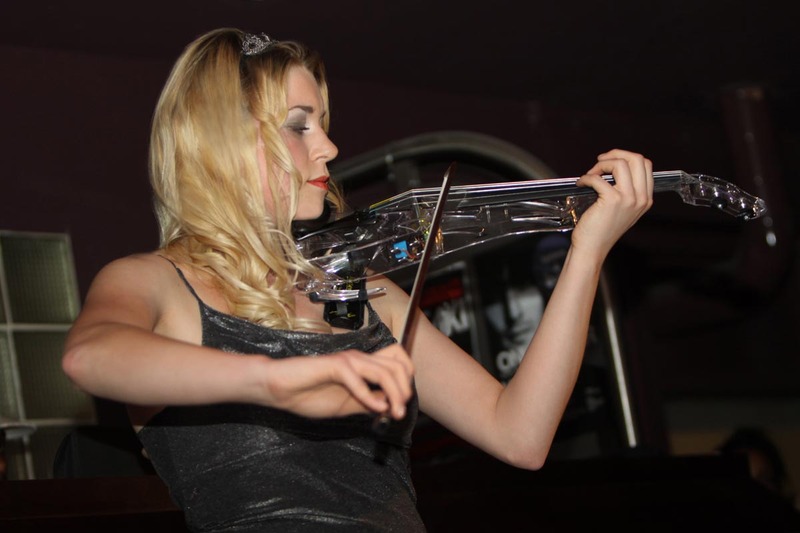 Having heard Kate playing on Briggate we knew she would be absolutely perfect for our event... and she was. Playing during the drinks reception she set exactly the right tone and guests loved her. Would definitely recommend. Everyone enjoyed the concert on Wednesday. It was enhanced by your beautiful playing. 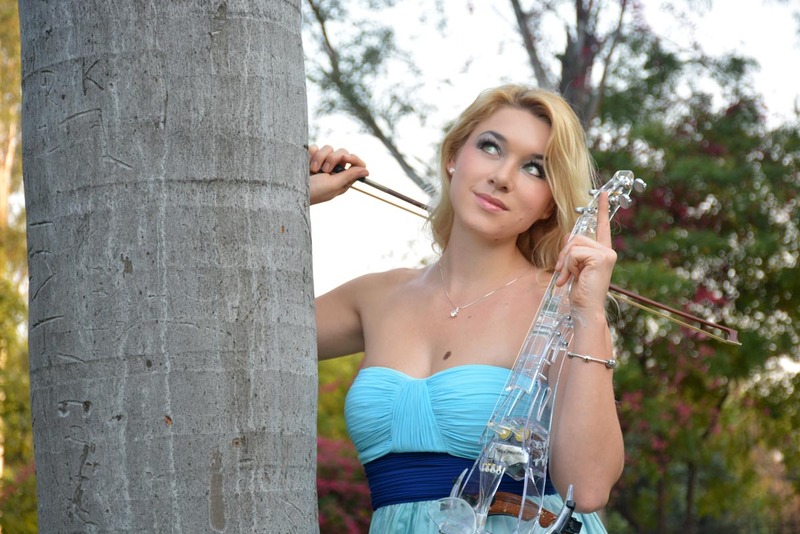 Good luck in your musical career - you deserve to succeed. 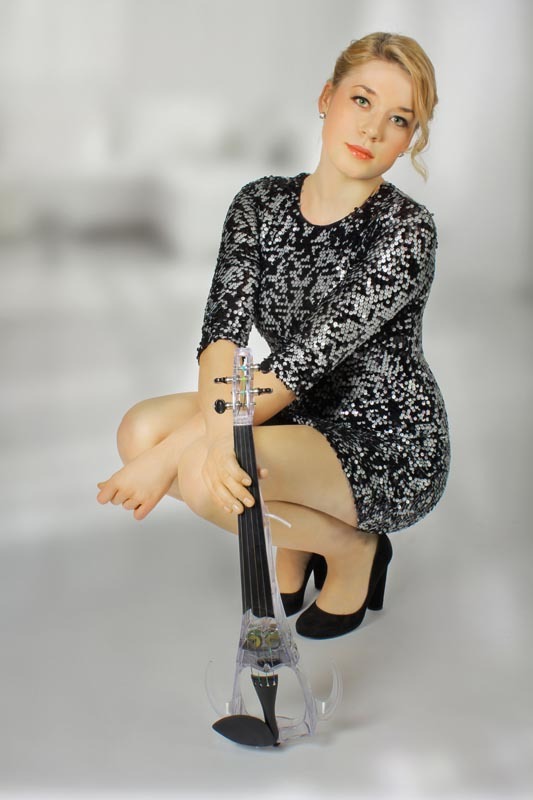 Katarzyna has deputised on violin for my professional band Charanga del Norte whilst studying for her BA in music at Leeds University. 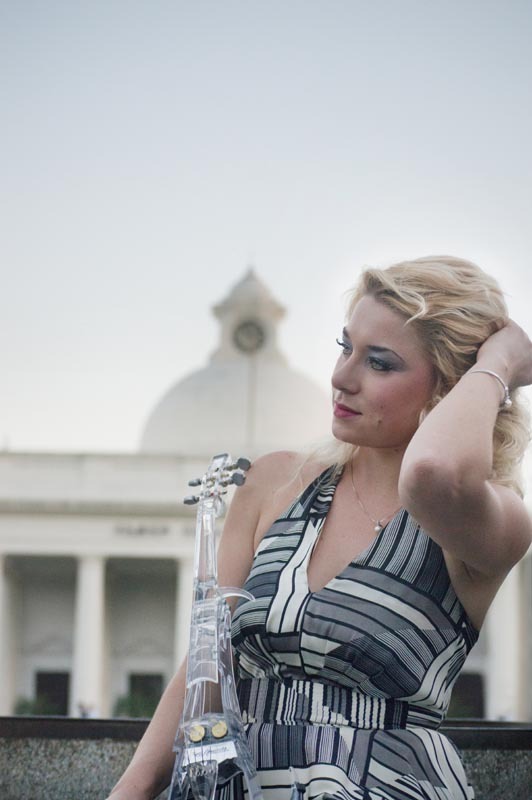 She has a great sound and is a pleasure to work with! After 2010: We look forward to you playing - we've had so many lovely comments from people when they have found out you would be playing again next year! 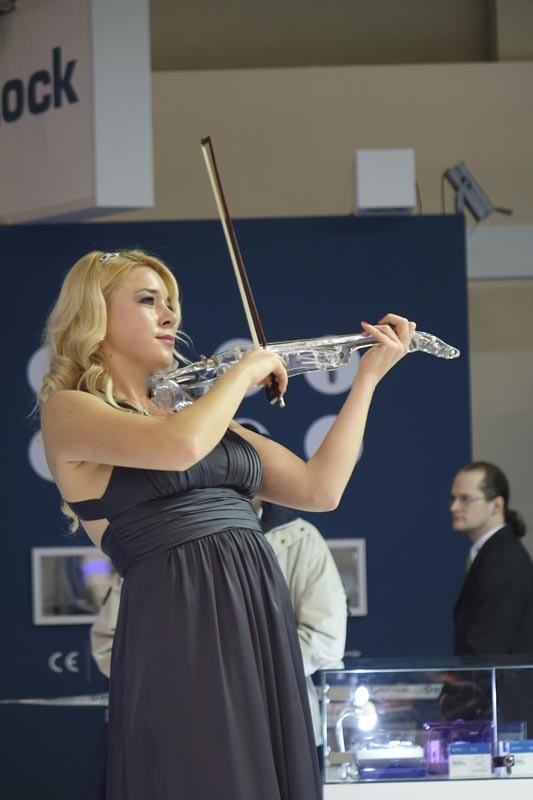 After 2011: Comments are still coming in about the service and your beautiful playing! Can we book you for the next hundred years? 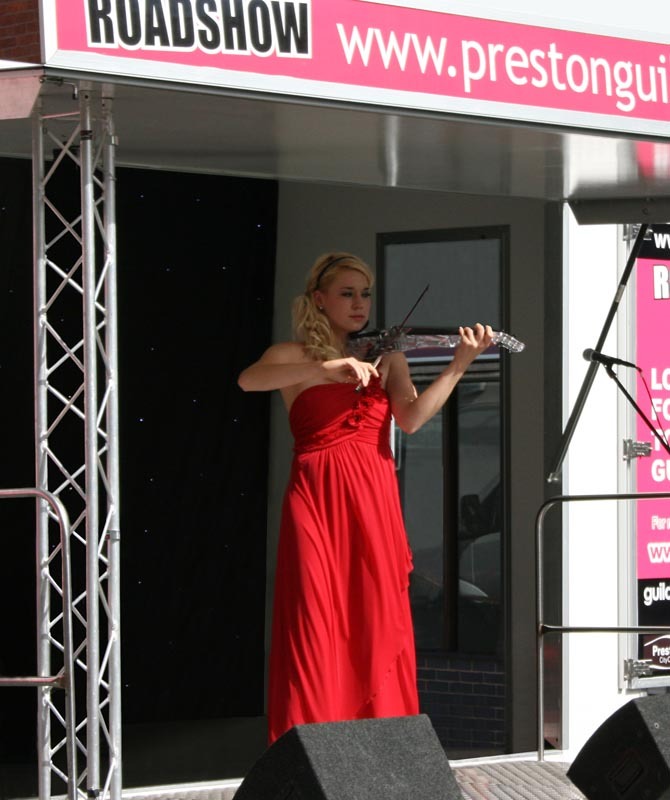 I saw Kate playing her violin in Huddersfield Town Centre. 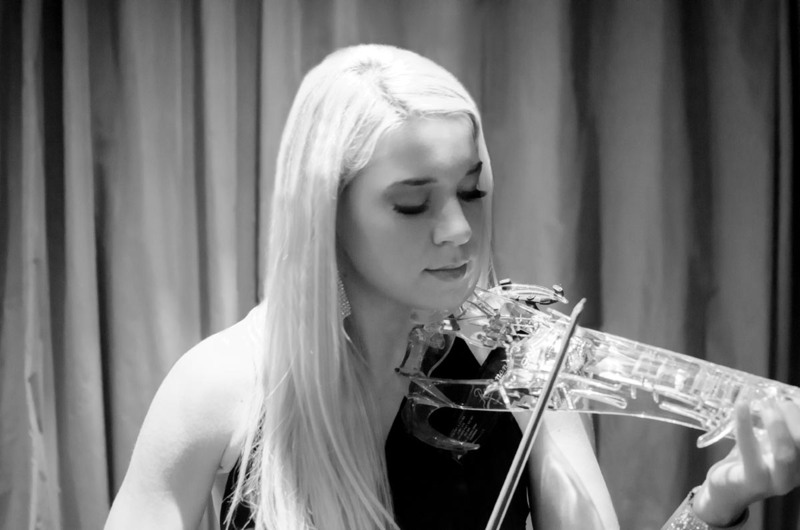 I never knew the violin could sound so beautiful. Some of the tunes Kate played brought a tear to my eyes and a lump in my throat. 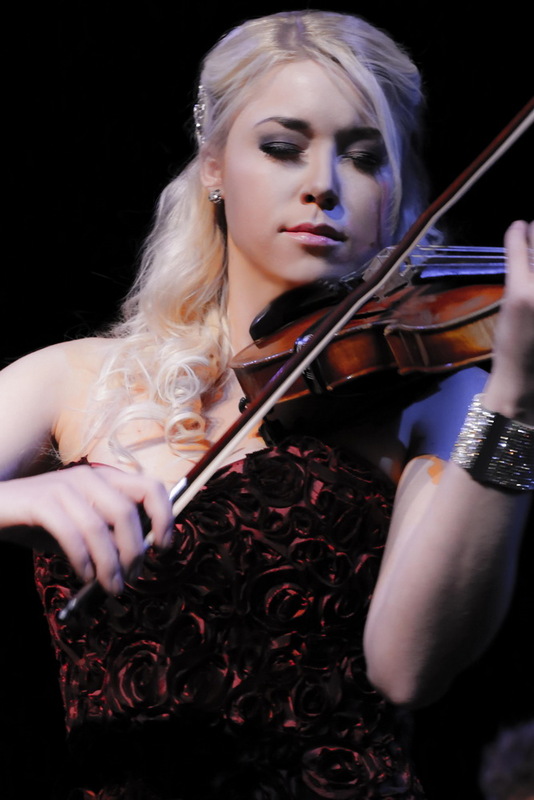 If you get the chance to see her play you will not regret it and I recommend her CD's to play to relax. They will make you drift away from the stresses of the day. Kate appeared with the Choir at a Concert in Silkstone Parish Church and "wowed" the audience with her choice of music and her versatility. 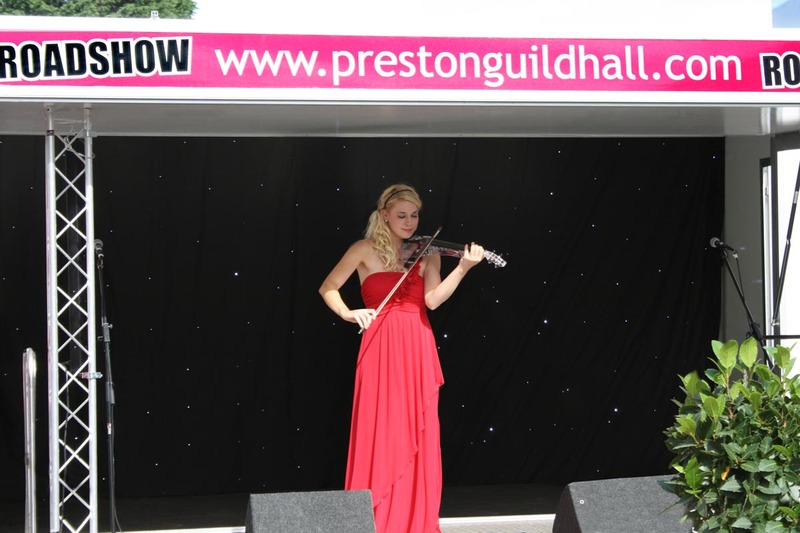 We would strongly recommend her to anyone wanting a highly talented and professional violinist. I would like to thank you on behalf of Chantry Lodge for making our Ladies evening such a success. Your captivating and amazing performance was the icing on the cake. 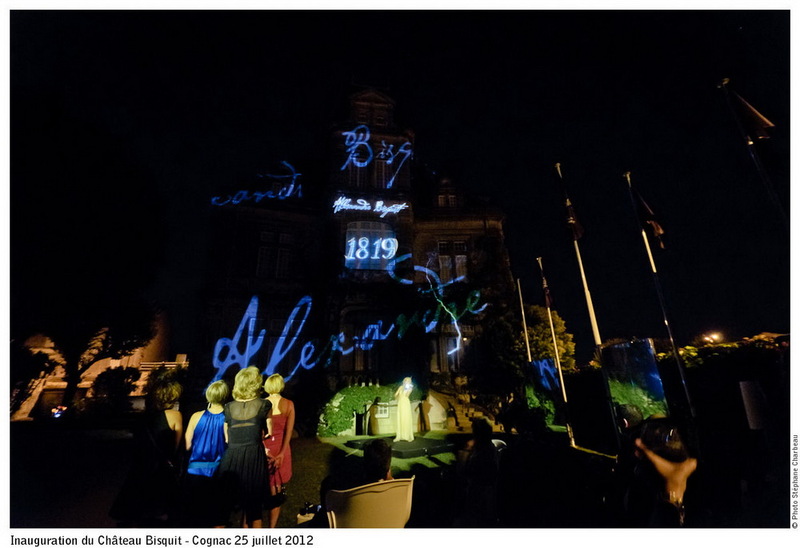 Everyone thoroughly enjoyed it making it a night to remember. Lovely to meet you last night. Thank you so very much for helping make it a wonderful evening. 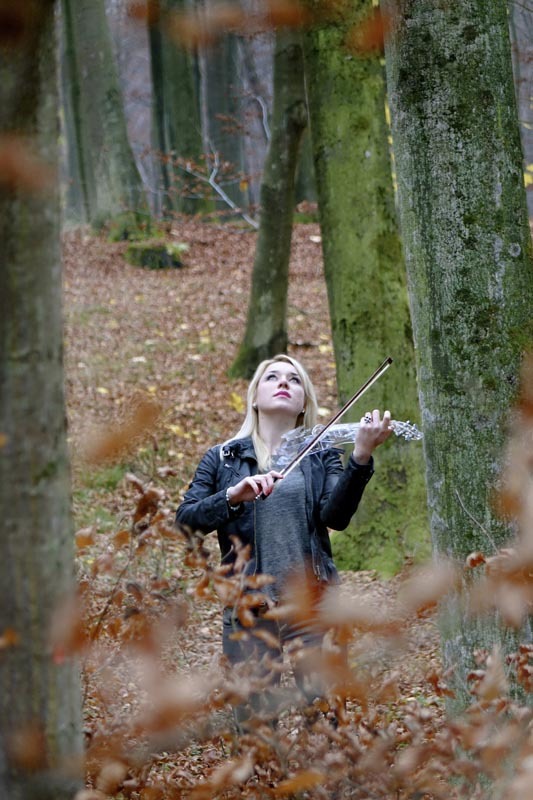 You are very talented and your music was wonderful. I'm currently recording my new album. Please leave details below - I will inform you when it is ready!